Item number [ B460319 ] NEW!! Certificate paper : n/a Material : Iron "鉄地"
Technique :　tate-maru-gata "竪丸形"　kage-sukashi "影透"
Hitsu holes : one "片櫃孔"
Feature :　A pair of large and small tsuba. Design of chrysanthemum fine openwork engraved. Item number [ B010219 ] NEW!! Technique :　Aoi mokko-gata "葵木瓜形", ji-sukashi "地透", kaku-mimi- koniku "角耳小肉"
Feature :　Both large and small tsubas are common in the theme of openwork "four directional bracken" "四方蕨手" , design with a bent tip. 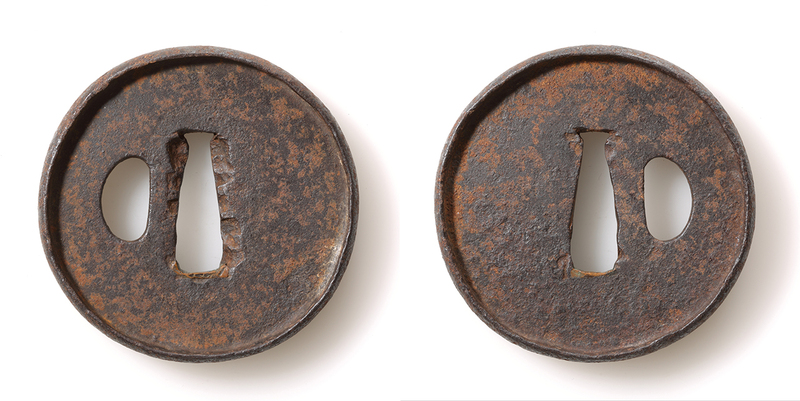 There is a difference in each tip part of warabi te "蕨手". 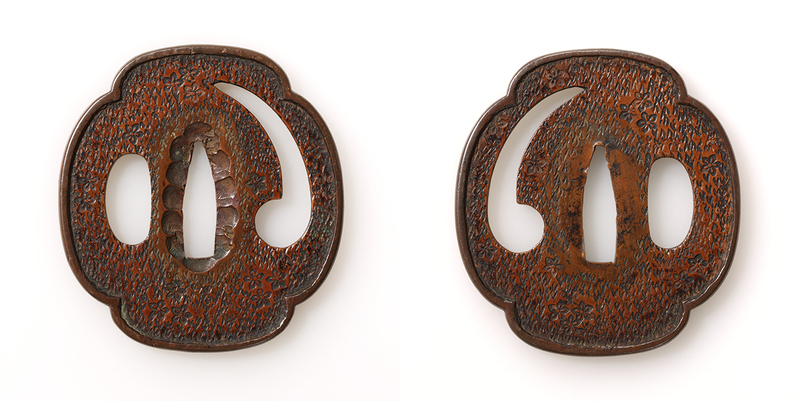 Large tsuba's design is divided into two, and it bends each other. 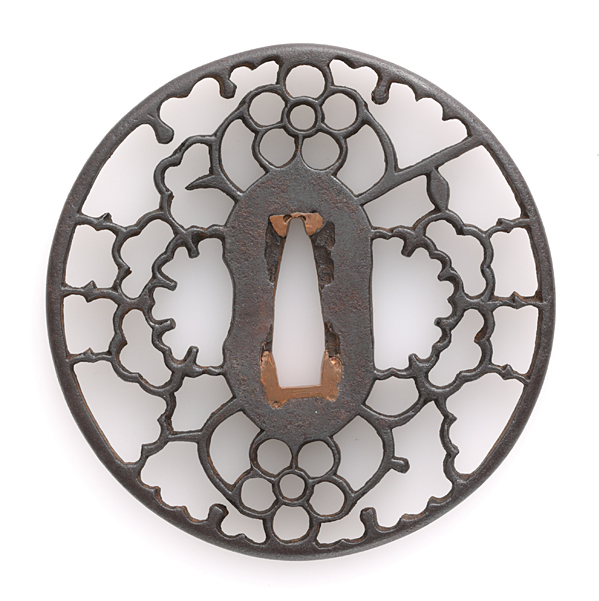 Small tsuba are represented in a shape bent in one direction. 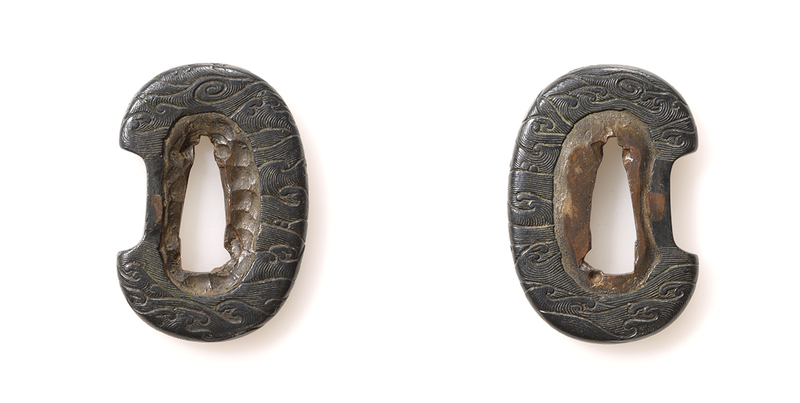 These are the variations of the figure corresponding to the size of each tsuba. When two are in line with each other, it makes feeling the vitality of the budding plant as it is corresponding. At the same time, movement is born. It can be said that it is the combination of charm. It is possible to think that it was originally made with this combination. 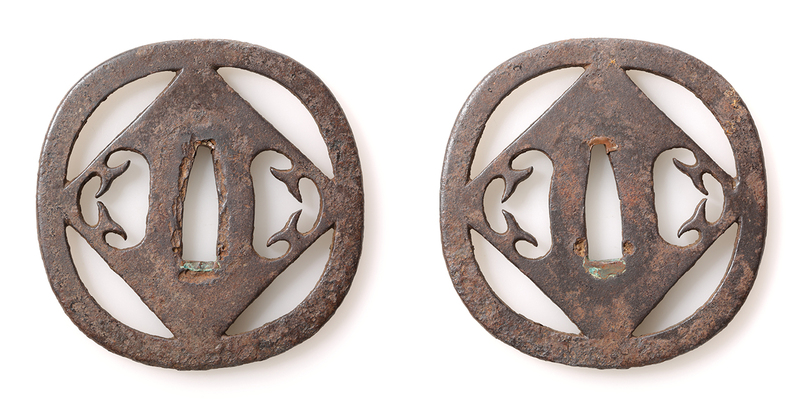 In the large tsuba, a covered ring fuku-rin of red copper with a small diagonal cut pattern on the ear is applied. On small tsuba's fuku-rin, the uplift of tekkotsu on the steel as it is. 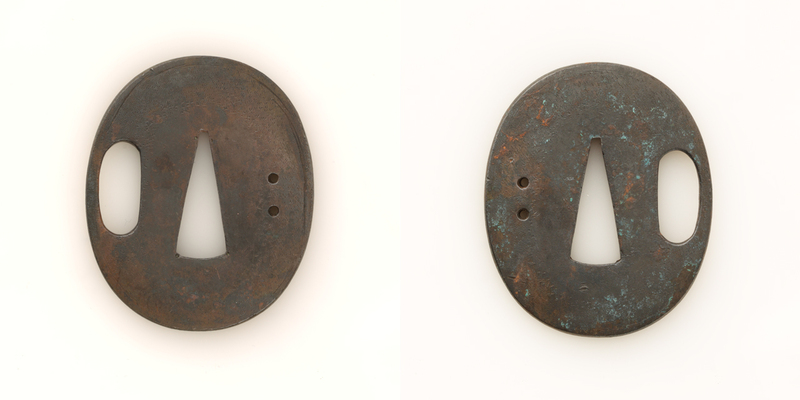 Both are similar instrong iron quality with a black tint. 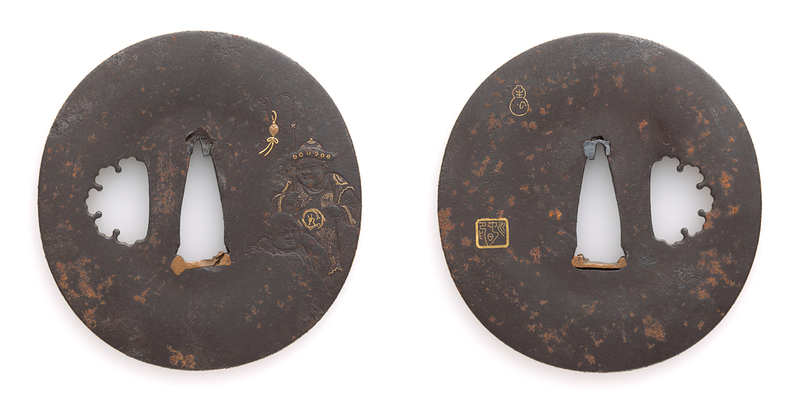 Large tsuba has not yet been identified by certification. 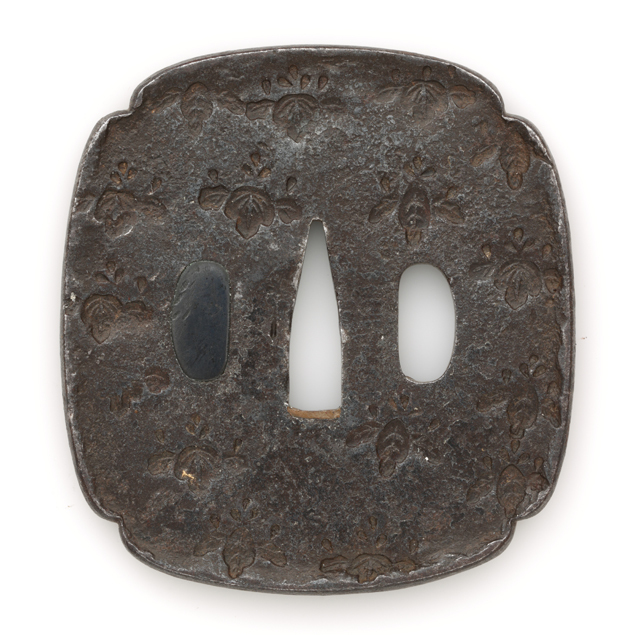 Small tsuba has been attributed to den-Kanayama by NBTHK. Item number [ B450319 ] NEW!! 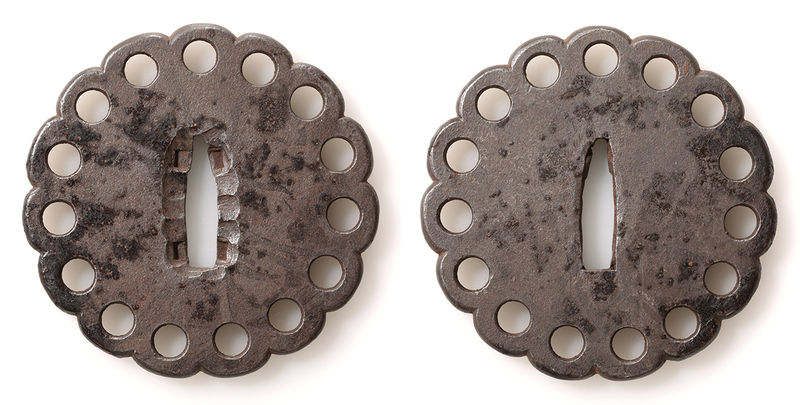 Motif : iron-base small openwork "鉄地小透鐔"
Technique :　ko-sukashi "小透"　hammer pattern "槌目"
Hitsu holes : two "両櫃孔"
Feature :　Grossy iron surface, there are long and short horizontal lines and hanmmer patterns. 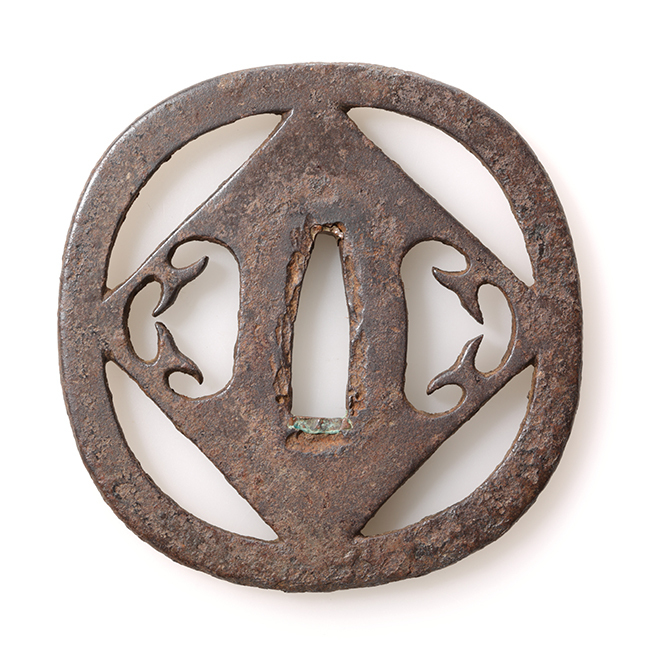 Large size tsuba which has a hole for ude-nuki-o and small openwork. Item number [ B440319 ] NEW!! 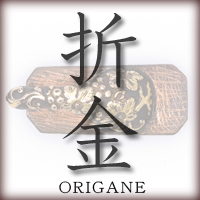 Motif : design of characters on the boat "船上人物図"
Signature / artisan : made by Mogarashi-sôten "藻柄子宗典製"
Material : su-aka "素銅"　brass "真鍮"　copper "銅"
Technique :　taka-bori "高彫" kin-iroe "金色絵" nanako-ji "魚々子地"
Feature :　The person who stands on the ship swaying in strong winds, with squaring his shoulders, holds a pearl-like object high on the right. It looks like that he is intimidating a monster whose face is washed away from a rough sea. 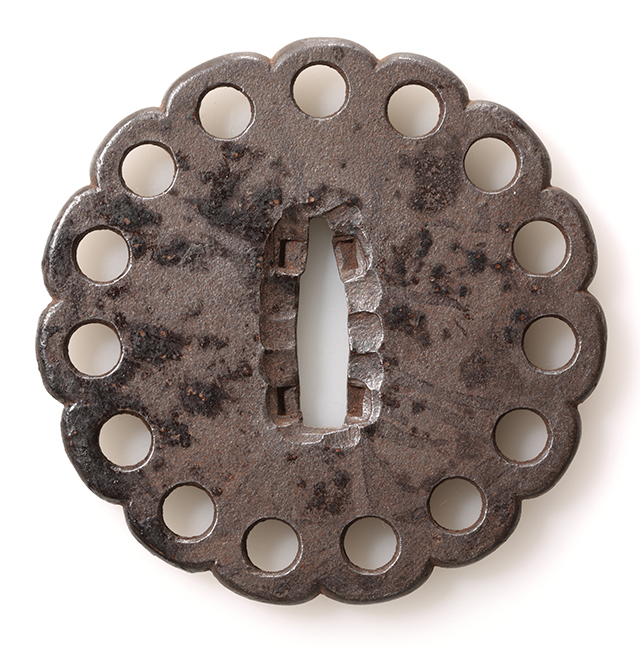 The pattern with a sense of tension is displayed in a boldly carved pattern. Conditions : There are a few detachments of point inlay. Item number [ B430319 ] NEW!! 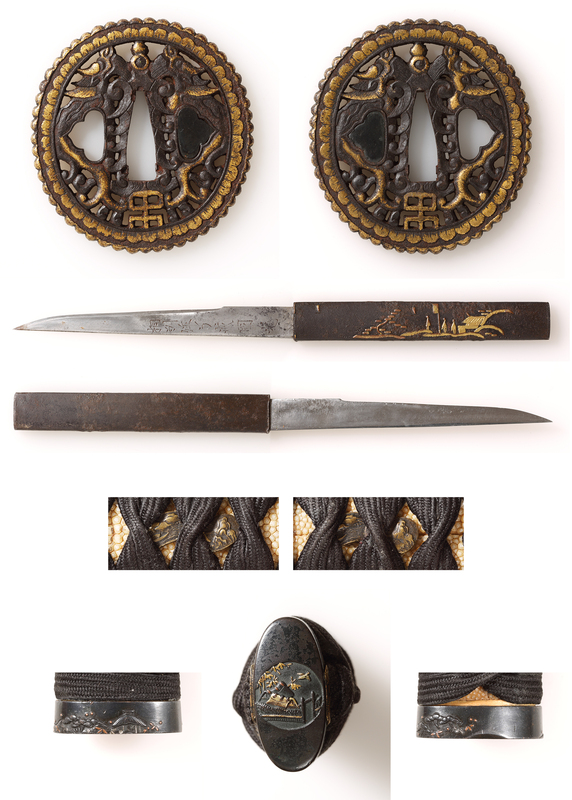 Motif : design of warriors in the battle "武者合戦図"
Signature / artisan : omote "表" "藻柄子宗典製", ura "裏" "江州彦根住"
Certificate paper : n/a Material : Iron "鉄"　su-aka "素銅"
Technique :　sukisage-hori "鋤下彫"　inlay "象嵌"　iroe "色絵"　ke-bori "毛彫"
Feature :　Brave warriors in armor are in opposition. Elements that make up the battle scene, such as waves, pines, and stone walls that have been engraved in a turtle-shaped kikkô pattern. Lively, you can enjoy appreciating. Conditions : Some patina observed. Item number [ B150219 ] NEW!! 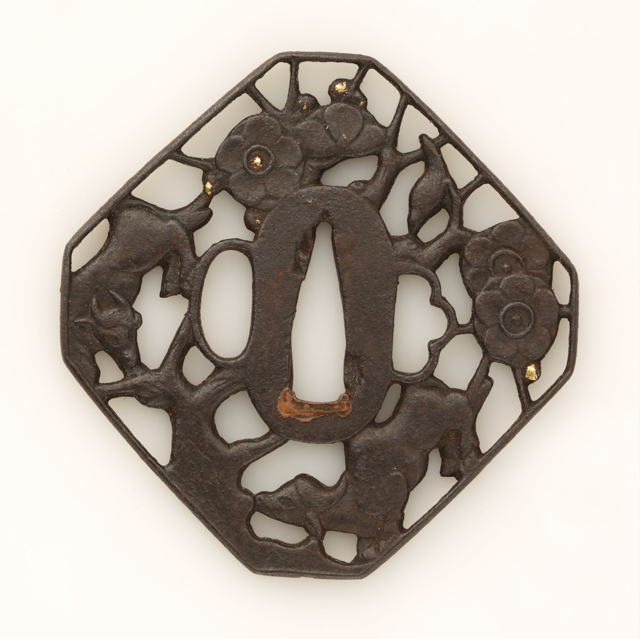 Motif :　design of moon and rabbit "月兎図"
Form : design of a mudguard "泥障形"
Technique : Taka-bori "高彫"　kin-iroe "金色絵"　kata-kiri-bori "片切彫"
Full moon of a autumn night. Suddenly the rabbit crosses my eyes. Rabbit who have noticed the existence of man hurried in a panic. It drew such a scene. 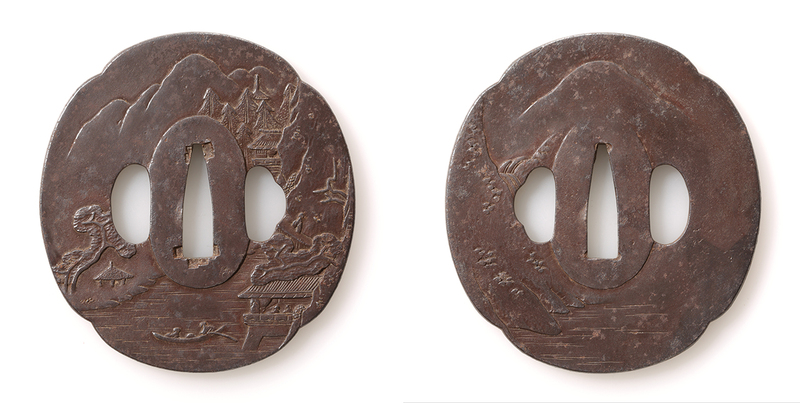 By showing only the shadow of sculpture kata-kiri-bori, the moon is represented, and by covering with the cloud the lower half is hidden, it has succeeded to represent greatly in terms of composition. Also, even if not expressing itself brightly, by applying gold painting to Hagi and Rabbit, the moon is felt more grande and magnificent as a source of reflected light. Item number [ B140219 ] NEW!! Motif :　design of chrysanthemum and arabesque "菊唐草文透"
Form : round "丸形"　kaku-mimi, ko-niku "角耳小肉"
Technique : Monyô-sukashi open work "文様透"
Feature : Chrysanthemums and arabesque are place in well-balanced. 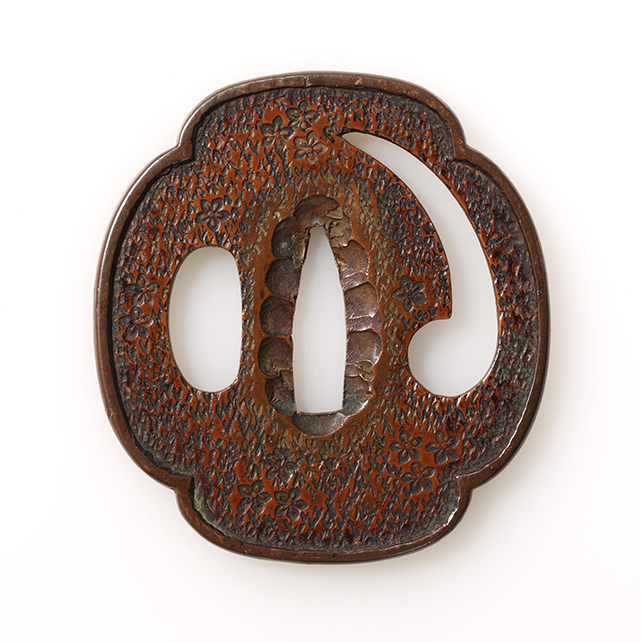 Elegant tsuba that extensively use curves in thin lines, patterns are given by open work sukashi-bori. It has some gloss, since it might be given lacquer. Item number [ B130219 ] NEW!! 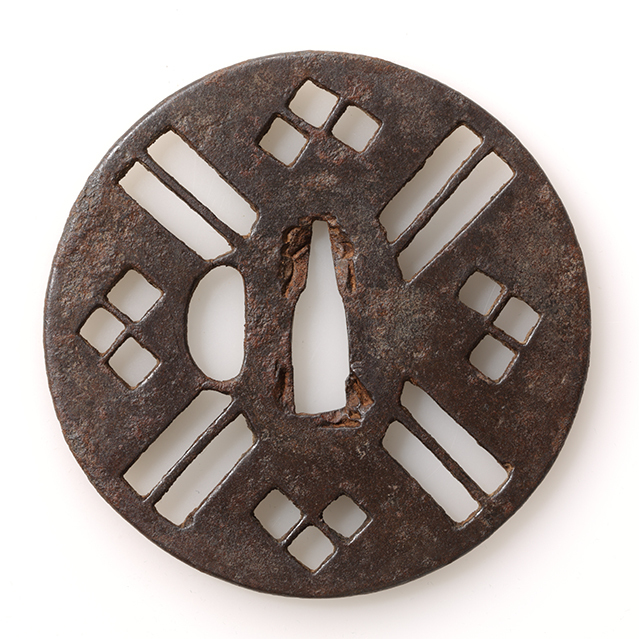 Technique : inlay sue-monzô-gan "据文象嵌"
Feature : Inside of iron tsuba's round outline, wire is placed on concentric circle. Just above its circle, short wires are placed and filled radically, the colors changing by turns. Edge border is not fuku-rin but sue-mon. A weighty tsuba. Conditions :　A piece of wire detached. Some rusts observed. Item number [ B120219 ] NEW!! Motif :　design of futatsu-hiki and clock "二引時計図透"
Technique : open work sukashi "透彫"
Feature : Combination of motif, round, futatsu-hiki, clock design and bore eyes. Simply and tasteful design. It looks like harness or belt. 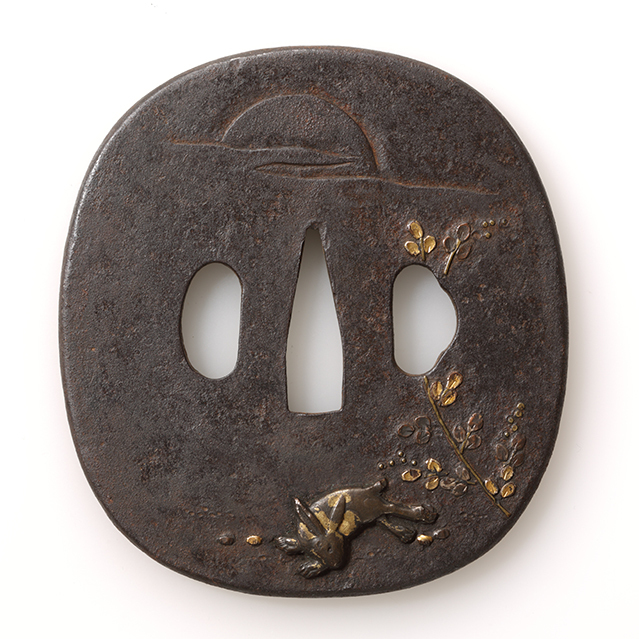 A tsuba filled with sense of creativity. Item number [ B110219 ] NEW!! Motif :　design of four directional three lozenge pattern Shihô-mitsubishi-mon sukashi "四方三菱文透"
Mitsubishi-mon patterns are made into kakge-sukashi. double lines crossing on the seppa-dai. As kage-sukashi, it makes geometric patterns. Conditions :　There is tiny rusts. It is improved by wiping of clothes. Item number [ B100219 ] NEW!! 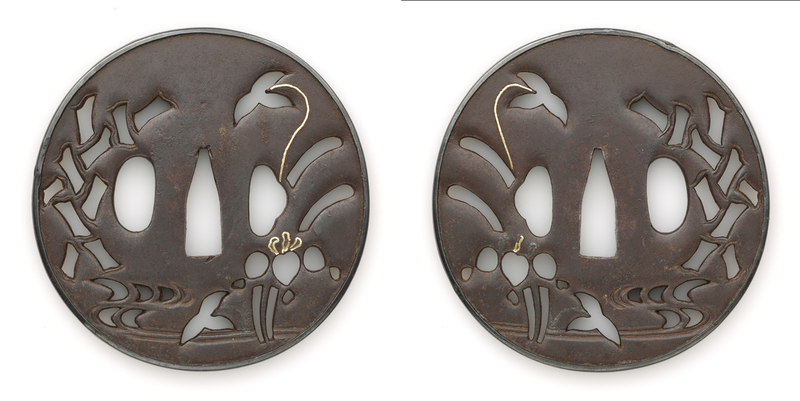 Motif :　design of bats "蝙蝠図小透"
Feature : An iron tsuba relatively large in size. Mottled deep color brass inlay and iron textures make specific contrast. 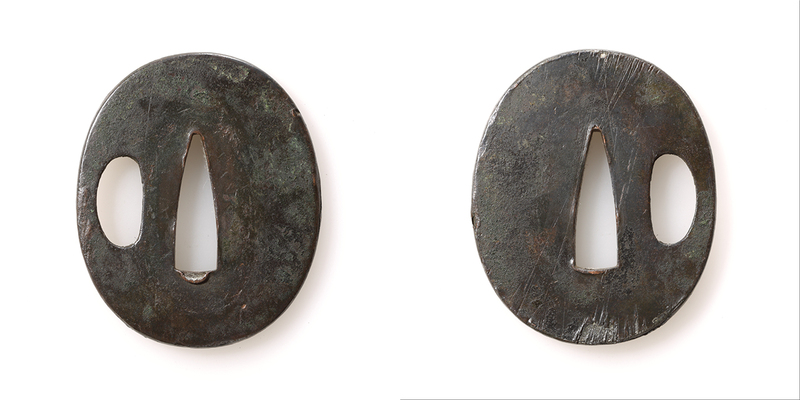 Other than two holes "両櫃穴", there are three small open works. Extremly simplified silhouette make it difficult to determine the object but they are bats flying freely as it were. Item number [ B090219 ] NEW!! 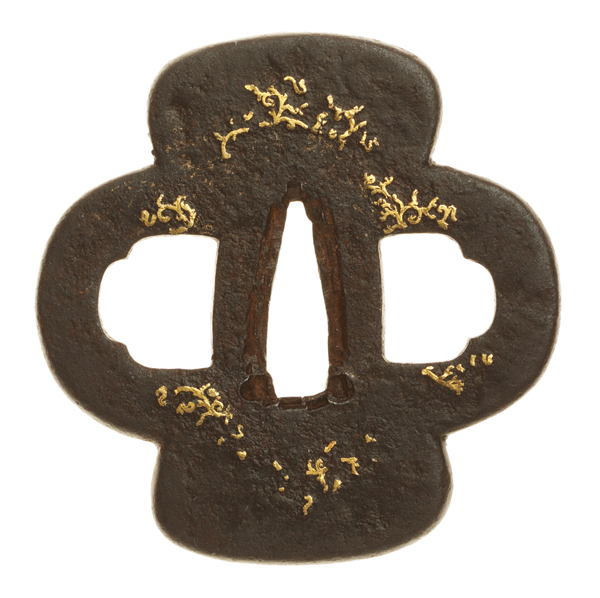 Motif :　design of soto-ba "卒塔婆透"
Mei ( signature ) : Tomohira "友平"
Form : sloping edged "撫角形"
Technique : Gold texture inlay "金布目象嵌"
Former designated national treasure, MURAKAMI Hikoshiro Tsuba might be a criterion of this Tsuba. 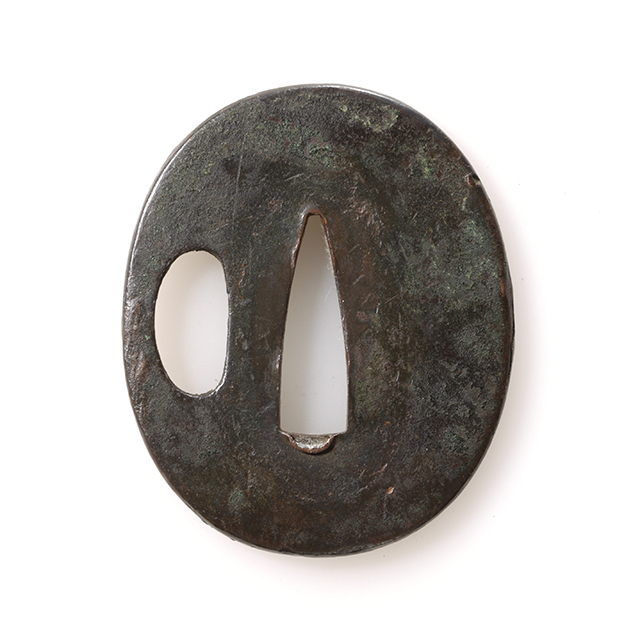 At Nagato province, in later Edo period, metalsmith dictionary showed that there was a smith with signature "長州萩住友平作". 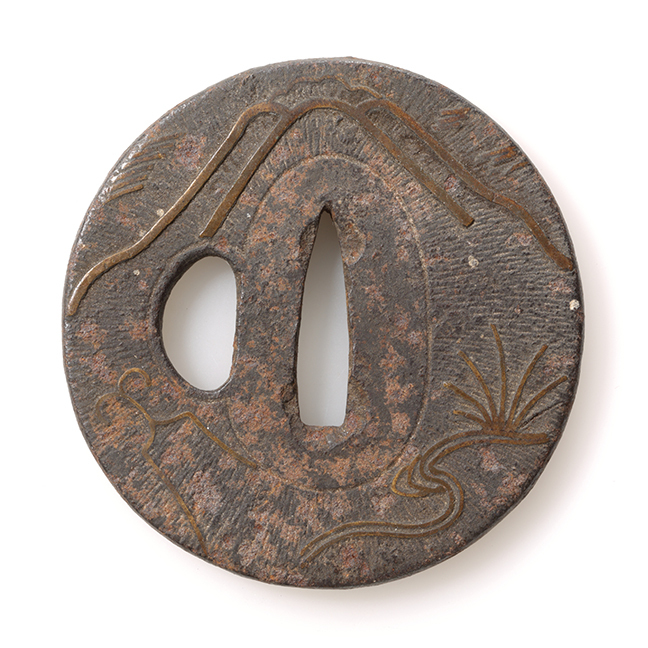 It is not certain if the metal smith of this Tsuba (with two characters signature) and Tomohira mentioned as above. Item number [ B080219 ] NEW!! Motif :　design of wild geese flying in rain "群雁図"
Form :　Mud flap shape aori-gata "泥障形"
Technique : hammer patern base "槌目地"　sue-mon inlay "据文象嵌"　dewdrop inlay "露象嵌"　ke-bori "毛彫"
Hitsu holes : two ryô-hitsu-ana "両櫃孔"
Feature : In the rain, making a group, geese flying. Beauty of composition with scenery atmosphere. With round tip bold chisel, plowing in one time, in sloping line, fine ke-boris are made. Made of brass and silver dew points inlay are distributed a little. Finished so carefully. Item number [ B070219 ] NEW!! Motif :　design of flower "花文透"
Hitsu holes : two holes　ryô-hitsu-ana "両櫃孔"
Feature : Nice feeling of iron surface, smooth texture iron Tsuba. The thickness of edge is relatively thin. Plump round shape. 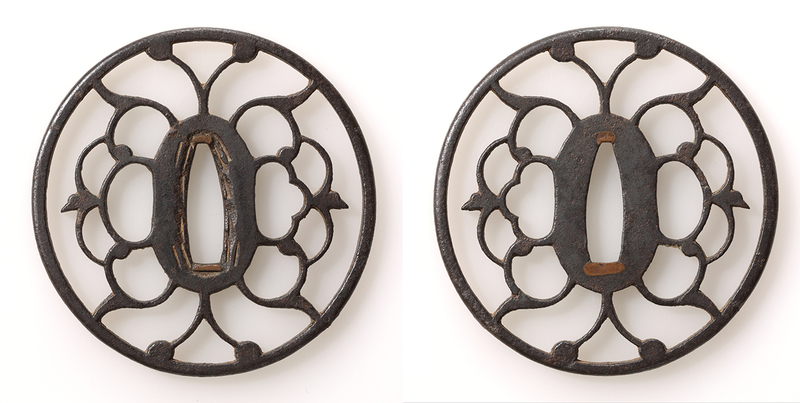 Petaroid hama-mon which expressed by kage-sukashi and symmetrical holes are well balanced. Harmonized and sense of stabilized design is one of characteristic. Item number [ B060219 ] NEW!! Motif :　design of a comma-shaped bead "勾玉文小透"
Certificate paper : n/a Material : suaka "素銅"
Form :　Japanese quince mokko shape "木瓜形"
Technique : suki-sage-hori "鋤下彫", kage-hori "影透", carved seal "刻印"
Feature : Form like a comma-shaped bead for ornament, usually combining two or three, making a tomoe pattern is one side large in size by kage-bori. Mokko shape suki-sage surfaces are engraved both on the front and the back. Fine v-shapes were done by chisel, stamped many. Cherry blossoms curved seals are distributed part by part. Calm reddish color shows elegant charm. Item number [ B050219 ] NEW!! Motif :　desing of bamboo grass, willow tree and egret "笹柳鷺図"
Certificate paper : n/a Material : su-aka "素銅"　brass "真鍮"　shakudô "赤銅"　silver "銀"　gold "金"
Technique : sue-mon "据文"　inlay "象嵌"　iroe "色絵"
an egret open the bill and closing to bamboo grass. In its motif, no special meanings and emotions but just plainly expressed. 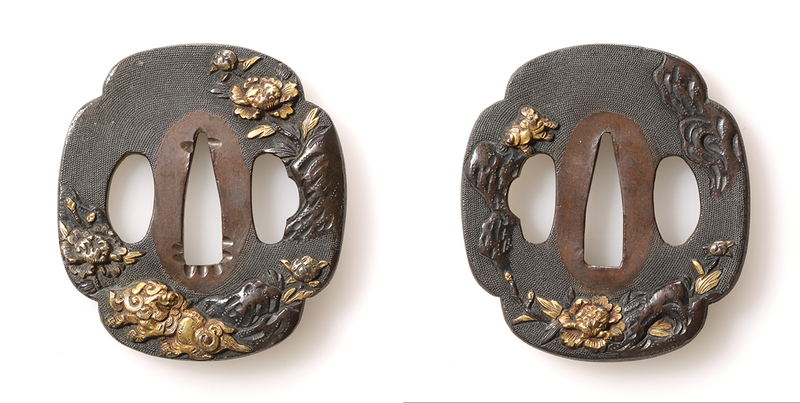 Rather, using several iro-e and gold iro-e, it becomes a tsuba showing the charm of rich color expression by metals which is deployable by Japanese metal-smith technique. Item number [ B040219 ] NEW!! 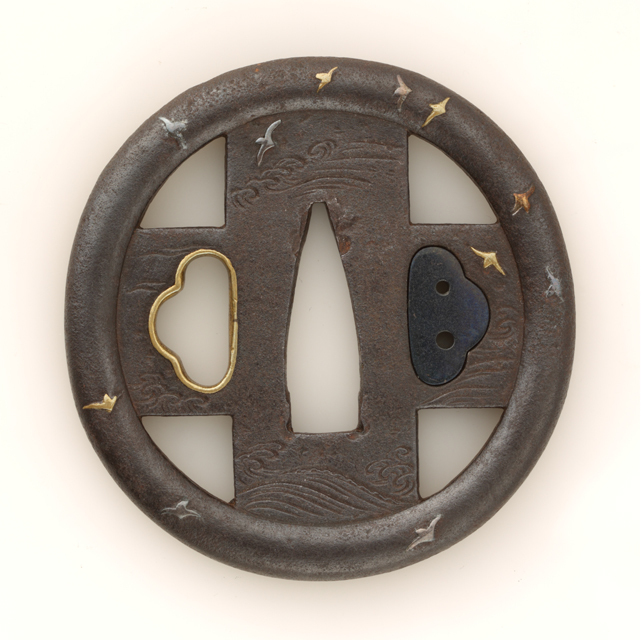 Motif :　design of locks "和錠図透"
Technique : ji-sukashi "地透"　kage-sukashi "影透"　ishime-ji "石目地"
Hitsu holes : two ryô-thitsu-ana "両櫃孔"
Feature : The design of Japanese lock which fit into mokko-shape. 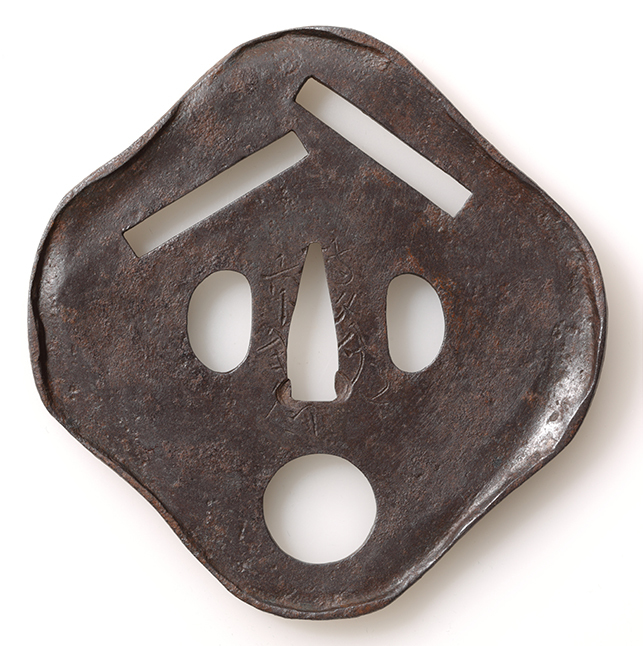 An iron Tsuba excellent in design with sense of humor. Even the design of ropes which connected to lock are expressed. Mei ( signature ) : omote : "越高田貞寿" ura : "壬申六月透鐡青( kaô 花押)"
Form :　Sumikiri kaku-gata　"隅切角形"
Technique :　Yakite-sukashi "焼手透", silver nunome inlay, gin-nunome-zô-gan "銀布目象嵌", kaku-mimi- koniku "角耳小肉"
Feature :　A Tsuba which has indescribable taste with natural texture shown by surface covering mottled rusts, moon and axe design expressed by open work. 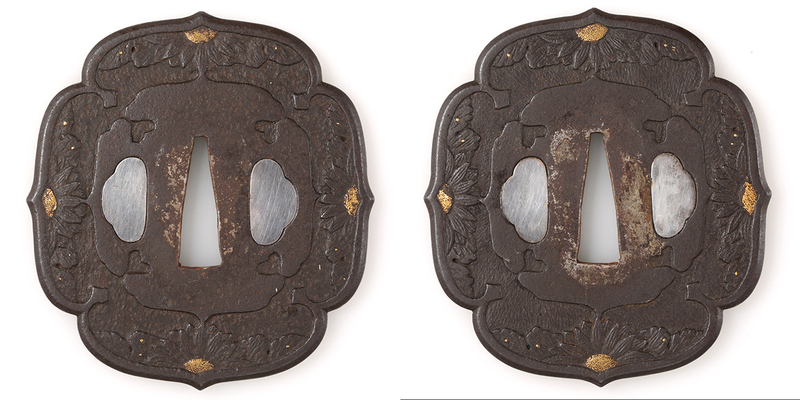 Large and sumikiri-kakugata (square and four edges cut)Silver nunome inlay which given at edge part of axe motif becomes blacken by aging. It shines when reflecting the light. Sadatoshi was a member of Matsui family. A child of Sadahide. He had a name Eitaro as well. His pen name was Fû-sai. He was a swordsmith. A pupil of Suishinshi Masahide. He lived in Echigo province. Hired swordsmith of Takada clan. There are time signature of Kaei In his swords. 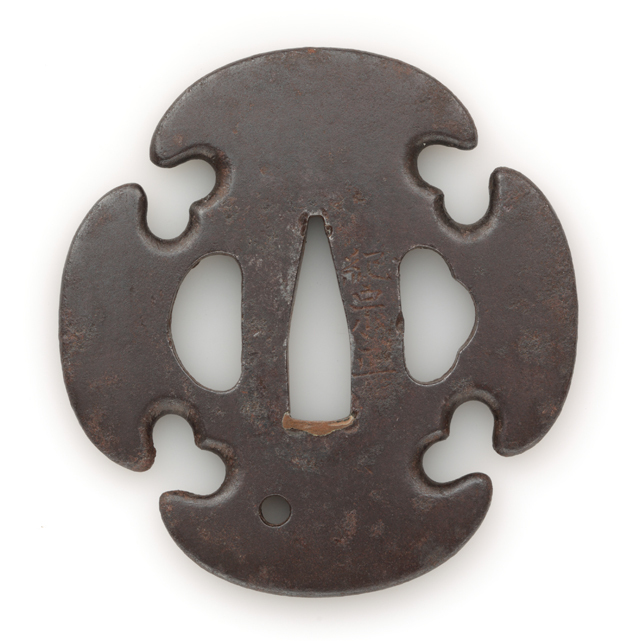 He created the Tsuba like this. 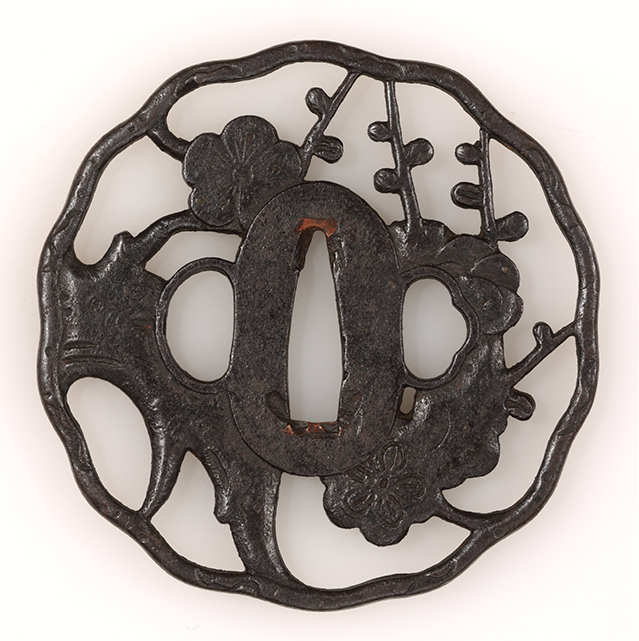 This Tsuba is recorded on the book Tsuba collection Tsuba Syûsei "鐔集成" page 239, #79. 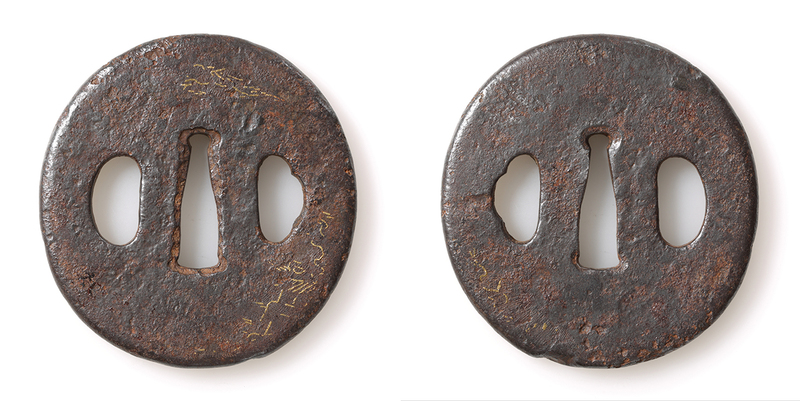 Feature :　A sense of stability, a little angular, in center of mokkô-gata iron tetsu-ji, boar eyes inome positioned toward four directions. Ô-seppa like seppa-dai is remaining out of engraving. 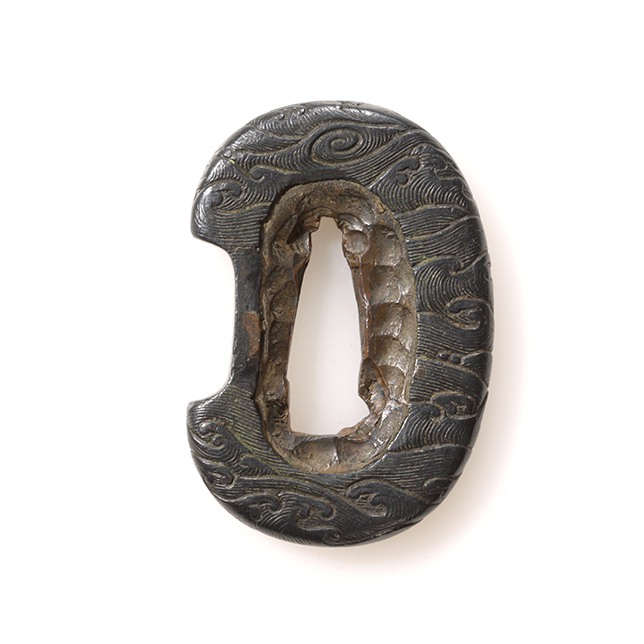 Looks lile fuku-rin, from tomo-tetsu-ji outer edge, a little engraved. At four points, chrysanthemum flowers and leaves shown partly by engraving. Gold inlay added. Ô-tsuba not only excel in design but practical also. Conditions : A lillte scratches on seppa-dai but excellent as a whole. 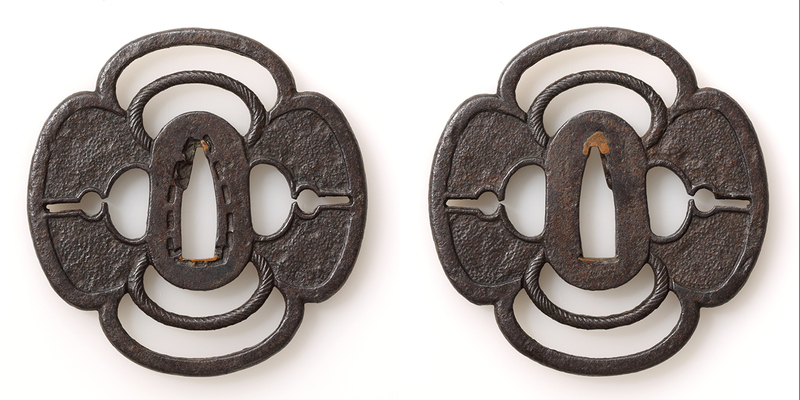 Motif : Design of clam Hamaguri-sukashi-tsuba "蛤透鐔"
Technique :　Ji-sukashi "地透", maru-mimi "丸耳"
Feature :　Roundish shape, a pair of cute clam are overlapped with a little shift. 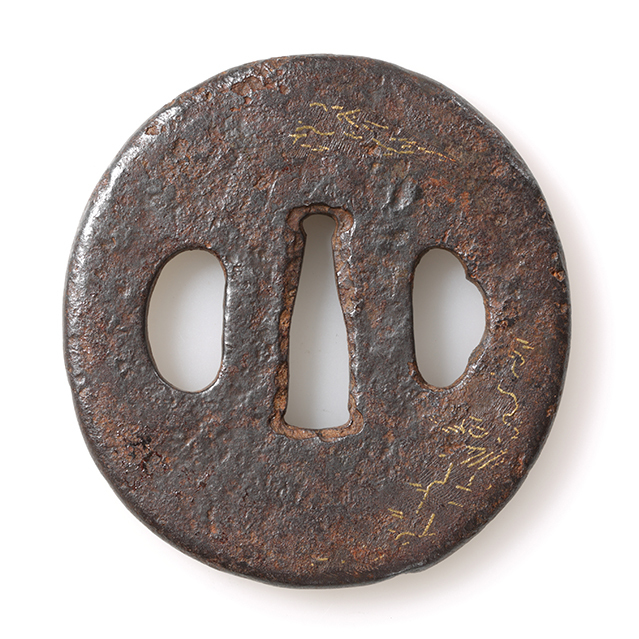 In tilted composure, iron tsuba with niku-bori sukashi. Smooth surface tetsu-migaki-ji reflect the light elegantly. It may express elegant game with shell kai-awase or a wish for harmon of married couple. A little small in its size. Motif : Design of Japanese apricot Baijyu-sukashi-zu "梅樹透鐔"
Price : JPY 120,000- -> JPY 100,000-(shipping and insurance fees are not included)　PRICE DOWN! 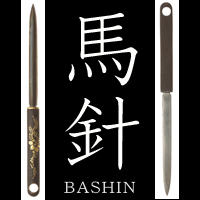 Technique :　Yakite-shiage "焼手仕上", uchi-kaeshi-mimi "打ち返し耳"
Feature : Specific Japanese apricot tree, called Garyû-bai is designed into a tsuba. Also, flowers are drawn several ways, three types specificaly. Dare to making it into flat outline flowers, designing it very detail with ke-bori. 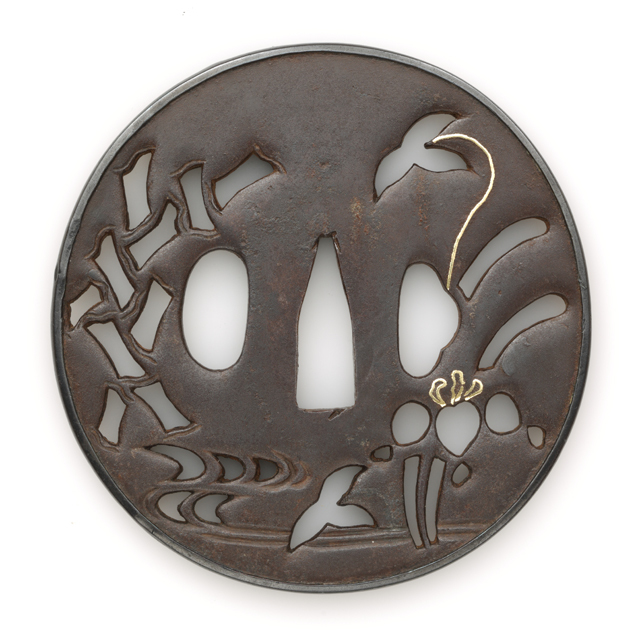 By niku-bori engraving, kinetic and partially, flower appeared aside of hitsu-kôgai hole. Above trunk of tree, appeared by keri-bori. Meander creeping apricot tree's feeling is common on the fuchi of kawari-gata and engraved wormhole. Branches with fat buds are waiting for its turn for blooming. 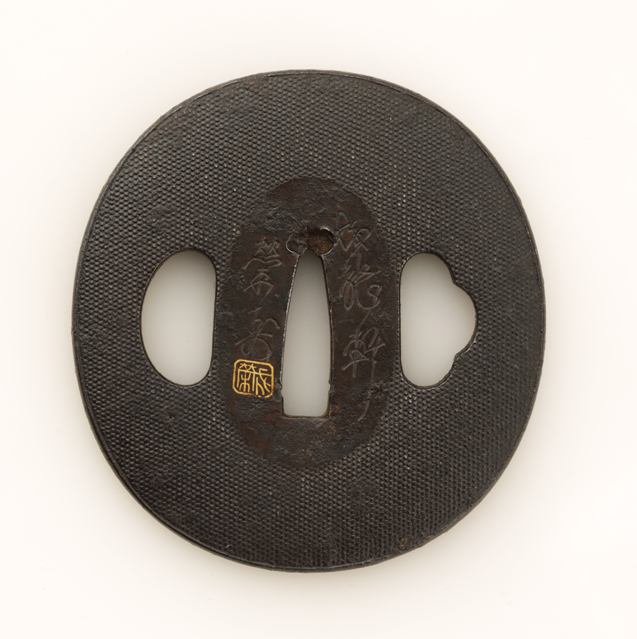 The tsuba something densed energy. 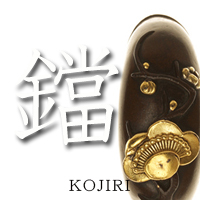 Motif : Design of Japanese apricot, bush warblers Ume-uguisu-zu tsuba "梅鶯図鐔"
Mei ( signature ) : omote : Kazunari tsukuru "一成造"
Technique :　Ji-sukashi "地透かし", kebori "毛彫り", maru-mimi "丸耳"
Feature :　Just blooming Japanese apricot flowers, nightingales twittering delight with lifting their tails. Such early spiring scenary and mood expressed delicately. It can appreciate well forged iron smooth surface. 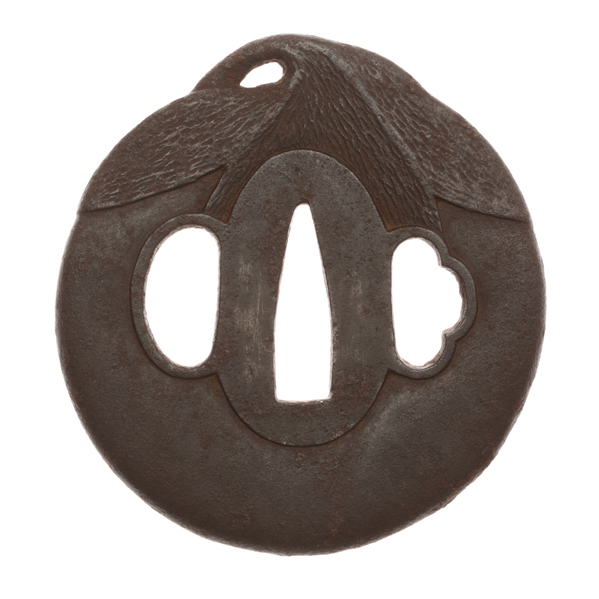 Motif : Design of reed and wild geese Ashi kari sukashi tsuba "芦雁透鐔"
Price : JPY 150,000- -> JPY 120,000- (shipping and insurance fees are not included)　PRICE DOWN! Technique :　Niku-bori "肉彫", ji-sukashi "地透", inlay zô-gan "象嵌", kaku-mimi ko-niku "角耳小肉"
Feature :　A box of paulownia wood, back cover has an opinion of refined taste man : "Kariganeya Hikobei design of wild geese. Ko-niku kaku-mimi deep iron taste and open work has its rhythm. The form of geese also have quaint elegance. Holes are big and quaint, too. Excellent work. Lucky day February Heisei 1. Moto-something Michihito described. " "雁金屋彦兵衛　雁繋図透鐔　小肉角耳　深い鉄味と透しにリズム感あり　雁ノ姿にも古びた風趣あり　櫃孔大きく古雅優品　平成元年二月吉日　基◻︎道人 印". Large size in an elevated style. 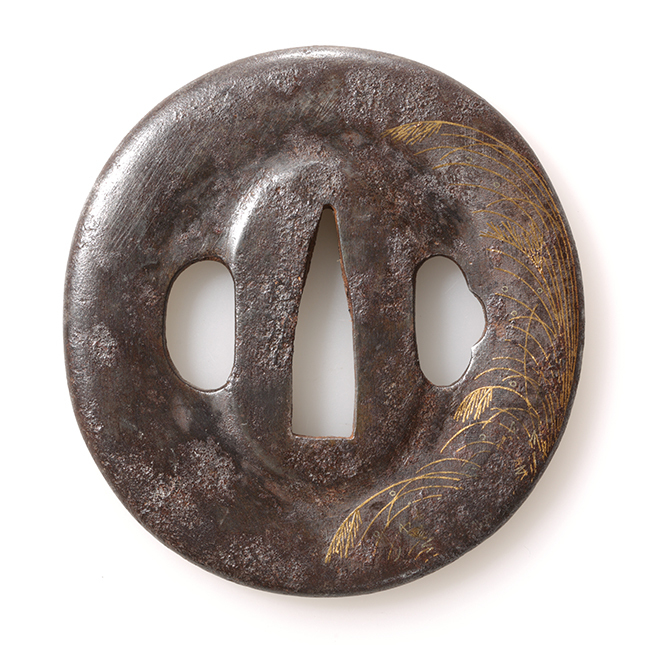 Recent authentication assesed this tsuba as Kyô-Shôami "京正阿弥"
Motif : Pine leaves, honeycomb pattern Matsuba-ni-kikkô-zu "松葉に亀甲文"
Feature :　With specific feel, on expressive iron surface, pine leaves and honeycomb patterns are given and engraved part by part. In order to reduce the thickness, both omote and ura sides of seppa-dai are lowered. The mimi finished in thick. Honeycomb patterns are given on mimi also. Mr. NARUKI Kazunari was born in Shiwa 6(1931). He is a tsuba-smith who lives in Nakatsugawa city, Gifu prefecture. He was accredited to an intangible cultural asset of Nakatsugawa city, as "the technique holder of sword guard making". 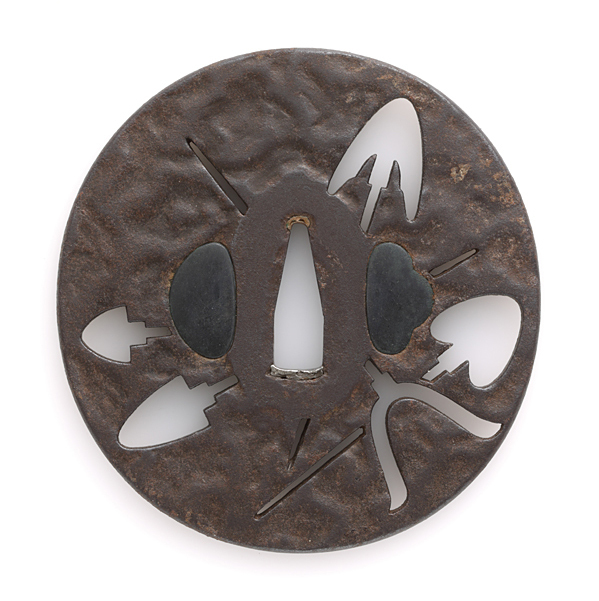 At planning exhibition, titled "the beauty of Tsuba : - the challenge of tsuba-smith NARUKI Kazunari - ", which was held by Gifu prefectural museum in Heisei 25(2013), following issues are displayed ; four seasons expressions inspired by Mino ancien potteries, self steel making effort using Japan domestic sand irons and iron ore, reproduction tsuba of Yagyû 36 poet saints tsuba "柳生三十六歌仙鐔", etc. Motif : Wisteria Tô-ka-mon-zu "藤花文図"
Form :　Tate-maru-fû kawari-gata　"堅丸風変り形"
Technique :　Migaki-ji "磨地", sukashi-bori "透彫"
Hitsu holes : Single kata-hitsu-ana "片櫃孔"
Feature :　Utilizing gloss texture of Shaku-dô, elegant form of wisteria pattern engraved with regular feature. 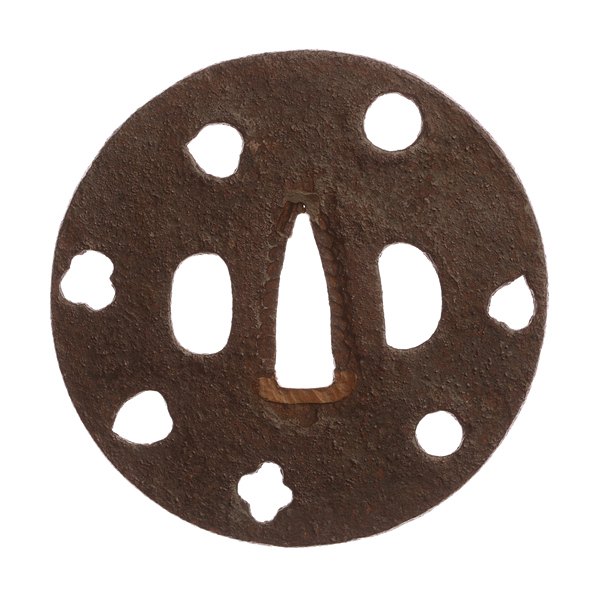 Seppa-dai finish is suited for kata-hitsu-ana single hole, so that it is wisteria flower outline naturally serve kozu-ka hitsu-ana hole and its advanced design. Motif : Waves and plovers Nami chidori "波千鳥図"
Technique :　Tetsu-migaki-ji "鉄磨地"　inlay zô-gan "象嵌"
Feature :　Hamidashi tsuba which reminds us the sceneary of harbor town, making it motif, waves, plovers and fishing nets. Conditions : Some lacks of inlay, scratches and small rusts observed. Motif :　Sleet and plum mizore ume sukashi "霙梅透"
Technique :　Ji-sukashi "地透"　Kaku-mimi ko-niku "角耳小肉"
Feature : At the edge of branch with plum flower blooming, which almost collapsed at the moment of a touch. Scenery of sleet with dim outline become a sort of design. Lively expression composed of a sequence of arc. 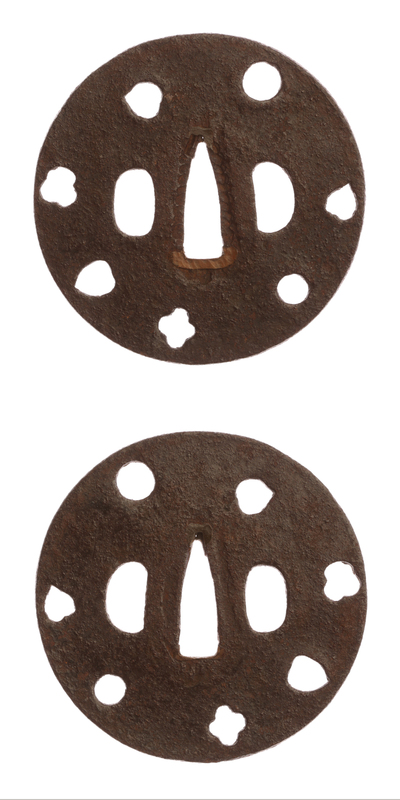 Hitsu holes : two holes filled Ryô-hitsu-ana ume "両櫃孔埋"
Feature : Such as hira-ne or kari-mata, each of them has different shape. 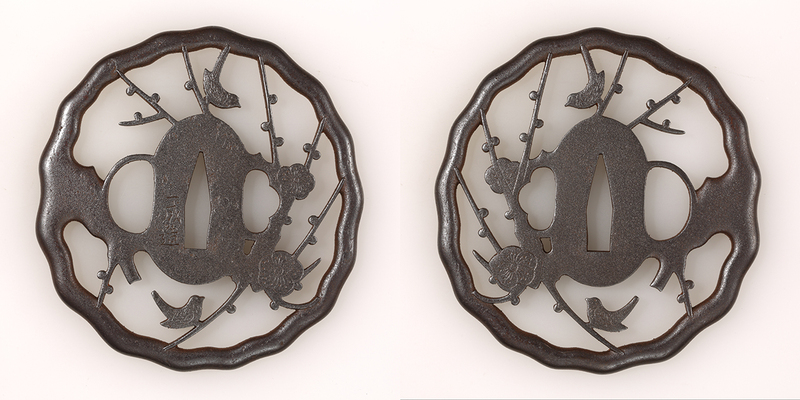 Five arrowheads, which resemble to cloud pattern kumo-mon, distributing heading several directions on tetsu-ji iron base with ji-nie. 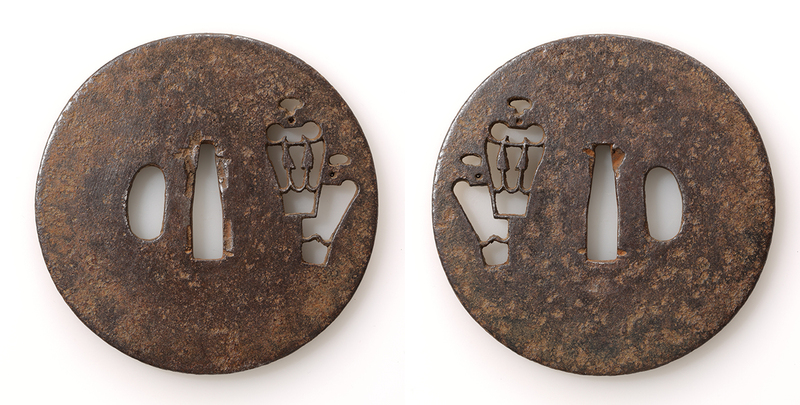 Large size tsuba making them kage-sukashi. Conditions : In general, it maintains excellent condition. However, there are a few part rust observed. It can be improved polishing by cloth. Motif : Seaweeds and crabs "藻蟹図"
Mei ( signature ) :　"会津松村"
Technique :　Sue-mon-zôgan inlay iroe "据紋象嵌色絵"　kaku-niku ko-niku "角耳小肉"
Feature : A round and smooth iron flange of "ishime-ji". 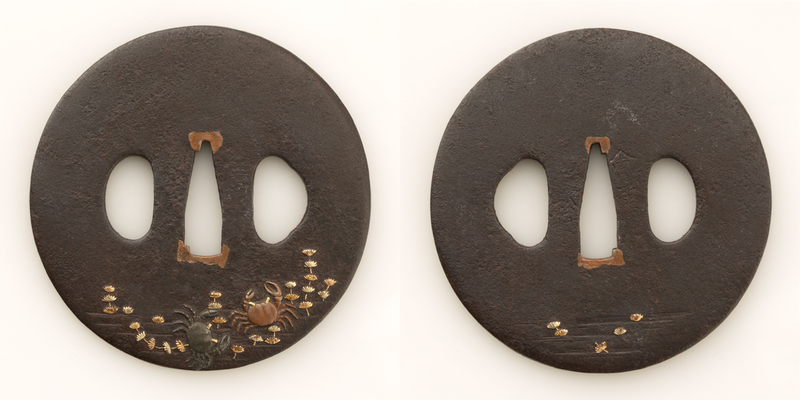 Two crabs and algae are conspicuously inlaid with colored gold such as "shaku-dô", "su-aka", gold and so on. The margin wider and complement ironiness. 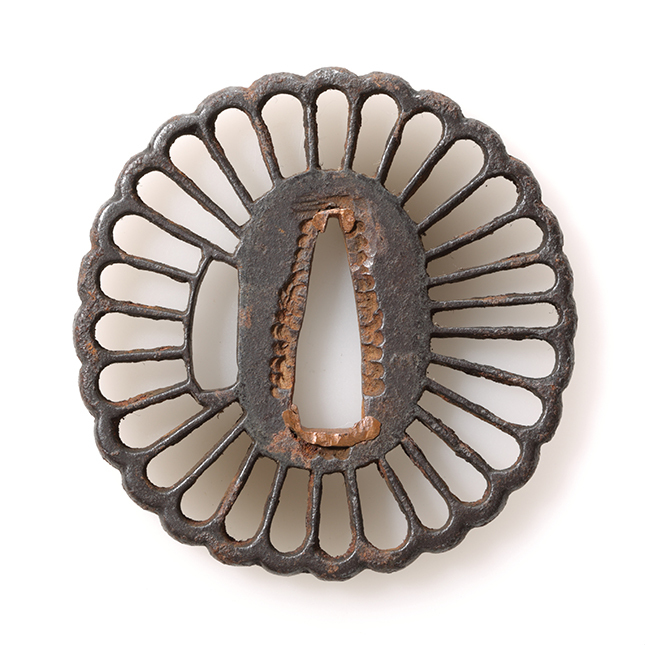 Matsumura is a metalworking group of Aizu Shôami school. They lived in Mutsu-no-kuni Iwashiro. There are Katsufusa, Katsunari, Katsukata and Katsuto. Motif : Nanako-ji mumon-zu "魚々子地無文図"
Mei ( signature ) :　"成龍軒栄寿"　"金象嵌落款"
Feature : Fine "nanako" is scattered on a blackish iron face like "shakudô" tsuba. Middle height finish with declining toward mimi edge. It can be seen that it is carefully made with a moderate design. Motif : Wild geese kari-gane-mon musubi-himo sukashi "雁金文結紐透"
Technique :　Niku-bori-ji open work "肉彫地透", gold inalay "金象嵌", niku-bori maru-mimi　"肉彫丸耳"
Feature : Natural molding of hard material iron engraving as if tying flexible strings. It is gorgeous spreading kari-gane-mon. 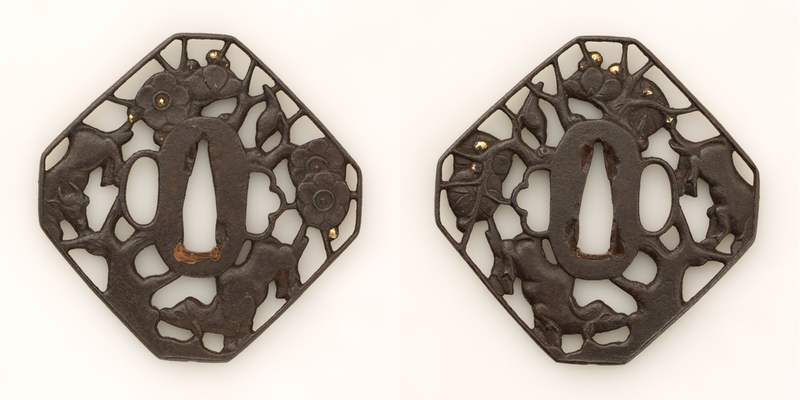 Motif : Plumns, bush warbler and cows "梅鶯牛図"
Form : Sumi-kiri kaku-gata "隅切角形"
Technique :　Niku-bori ji-sukashi "肉彫地透", ke-bori "毛彫", gold nunome inlay "金布目象嵌"
Feature : When spring east wind blew, make it a balmy even if no master of plum tree there. Kochi fukaba nioi okoseyo ume no haha aruji nashi tote haru na wasure so "東風吹かば 匂いおこせよ 梅の花　あるじなしとて 春な忘れそ". Tenmangû shrine, where this famous tanka poet creater SUGAWARA Michizane enshrined, is know as a place in connection for its associations with cows. Won't you have it as a charm for exam? Motif : Mumon hamidashi tsuba "無文喰出鐔"
Certificate paper : n/a Material : Copper "銅"
Technique :　Migaki-ji "磨地", kaku-mimi ko-niku "角耳小肉"
Hitsu holes : Single "片櫃孔"
Feature : Hamidashi tsuba which seemed to be used for a koshirae with thick kasane tanto. 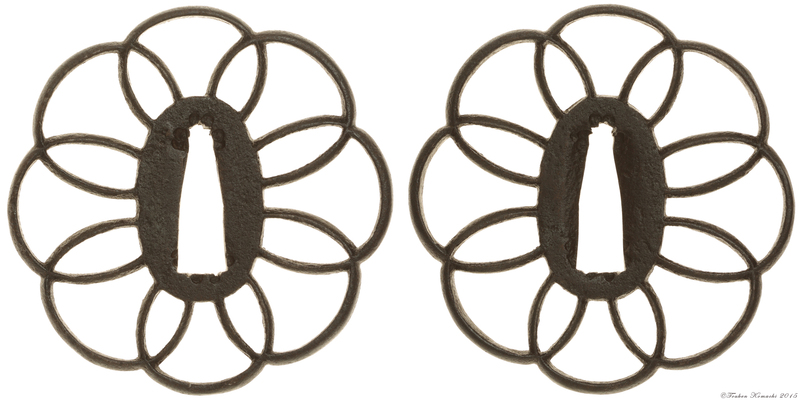 On black colored copper base, fine v-shaped patterns engraved. 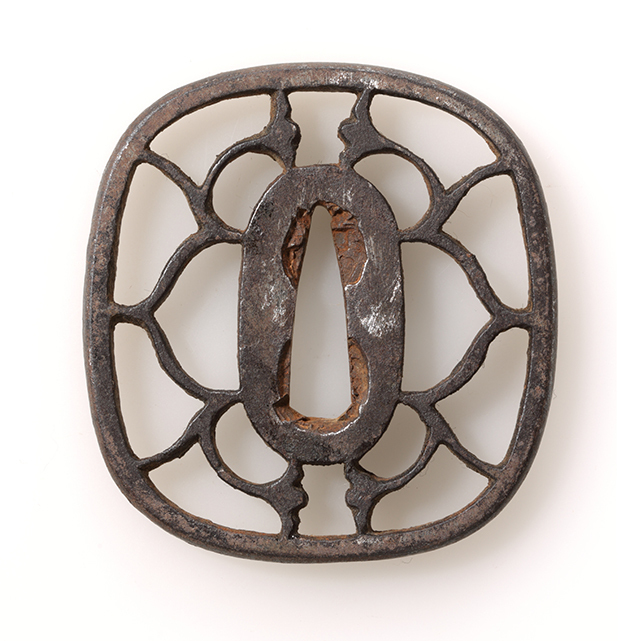 Close to edges, there are lines parallel to tsuba outline, in random, likely to be broken, engraved shallowly. Opposite side of hitsu-ana hole and nakago-ana hole, there are saya-dome-ana holes. Condition :　Excellent. On ura side, there is a little patina observed. 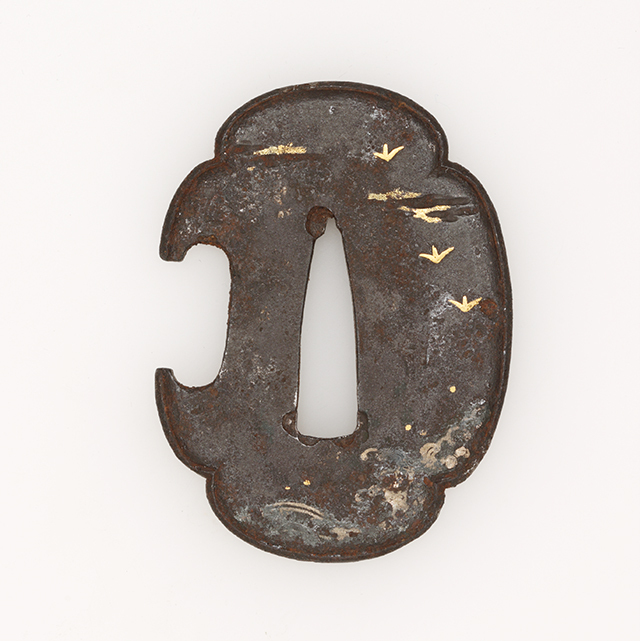 Motif : Cross (open work), waves and plovers Jyû-ji sukashi nami chidori-zu "十字透波千鳥図"
Form : Maru-gata "丸形"　migaki-ji "磨地"
Technique :　Kata-kiri ke-bori "片切毛彫"　ji-sukashi "地透"　gold, silver and copper inlay "金銀銅象嵌"　dote-mimi edge "土手耳"
Hitsu holes : two, one out of two filled "両櫃孔内片櫃孔埋(鞘止孔有)"　saya-dome-ana attached. are engraved by iro-gane (e.g. gold, silver and copper). Technique :　Taka-bori "高彫"　gold point inlay "金点象嵌"
Feature : A sequence of small patterned waves distributed in the center. They are surrounded by bouquets of chrysanthemum. Gold points inlay studded fine and whole. 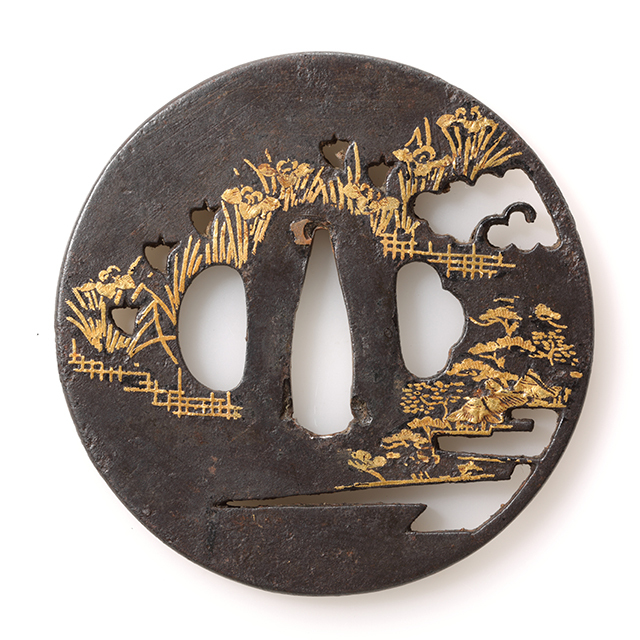 Tsuba created by skilfull and delicate technique of engraving. 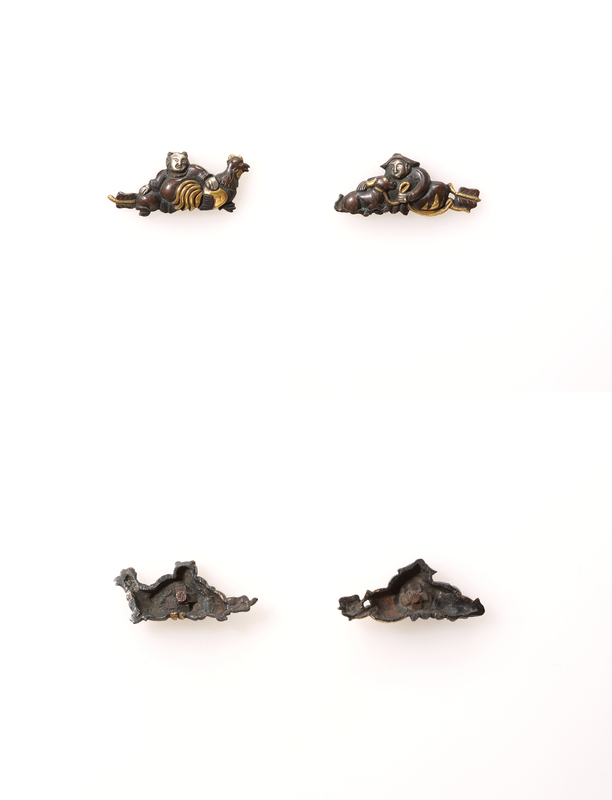 Motif Shells, kai-zukushi-zu ; "貝尽図"
Material : Shakudô "赤銅" gold, silver, copper suaka "素銅"
Hitsu holes : One hole kata-hitsu-ana "片Hitsu holes : "
with ko-sukashi. Thick edge cover kin-puku-rin. 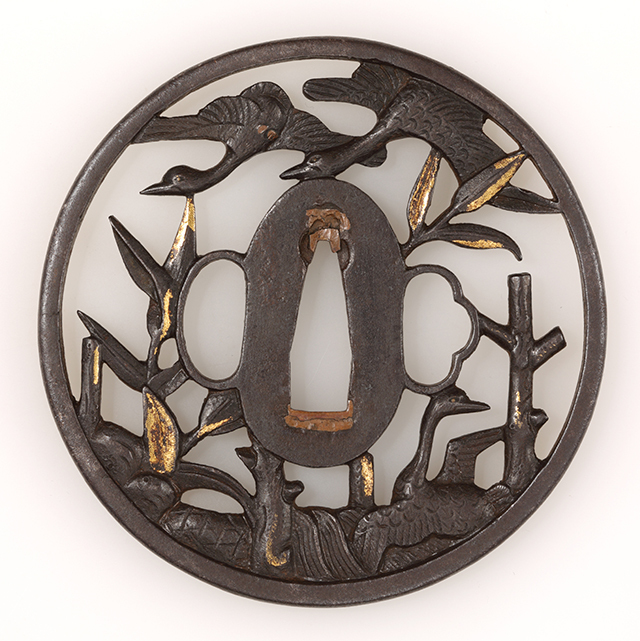 A gorgeous tsuba. Motif Paulownia patterns distributed, kiri-mon chirashi "桐紋散図"
Material : Iron, shakudô "赤銅"
Feature : A Japanese quince form (mokko-gata) in nearly squared. 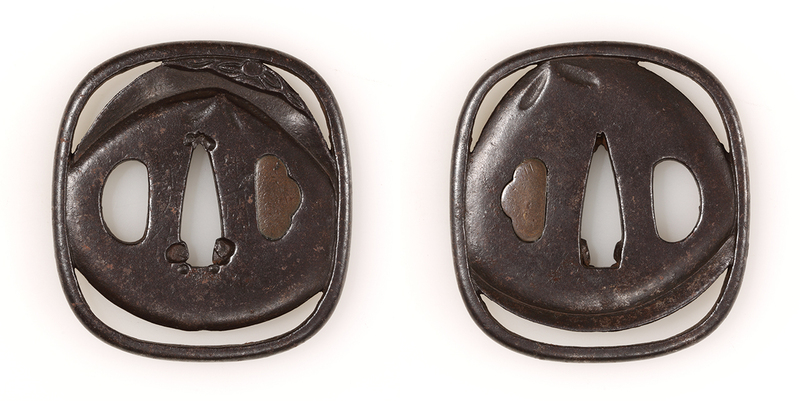 Iron base (tetsu-ji) has ripped edge (uchi-kaeshi mimi). Paulownia patterns (kiri-mon) generally distributed by hammer. By the change of angles and the degree of forces, it has succeeded to have rich expression. Motif Open work, sa-yû hishi kuruma sukashi, "左右菱車透"
Form : Round, maru-gata, "丸形"
Technique : Open work, jisukashi, "地透"
Hitsu holes : two ryô-hitsu ana "両Hitsu holes : "
Feature : An iron tsuba, outside of each left and right hitsu hole, there is lager lozenge next to smaller one. 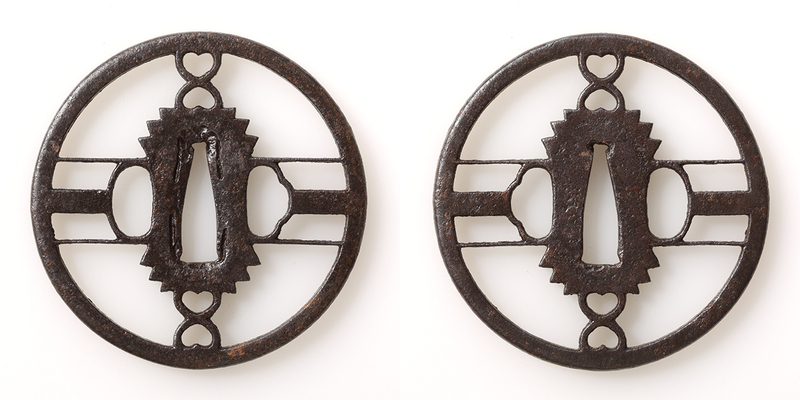 Spoke patterns are arranged by ji-sukashi open work. Straight lines part have almost even width. It is composed in sharp and tense lines. The thickness of edge is thicker than that of seppadai. Condition : A little dry suface iron. There is tiny chipped part. 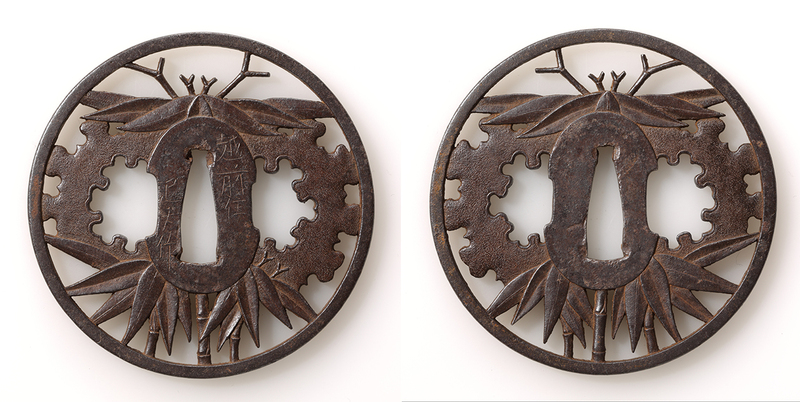 Motif Open work, Sasa-sukashi, "笹透"
Feature : Round shape, iron made into ji-sukashi, bamboo leaves and stem are expressed simply and strongly. An ancient poet in Nara period, Kakino-moto-Hitomaro, created a following poem. "Bamboo leaves sway gently in mountains, I think of my wife firmly, who left behind in my house". (Sasa-no-ha-wa miyama-mo saya-ni sayage-domo ware-wa imo omou wakare kinureba. 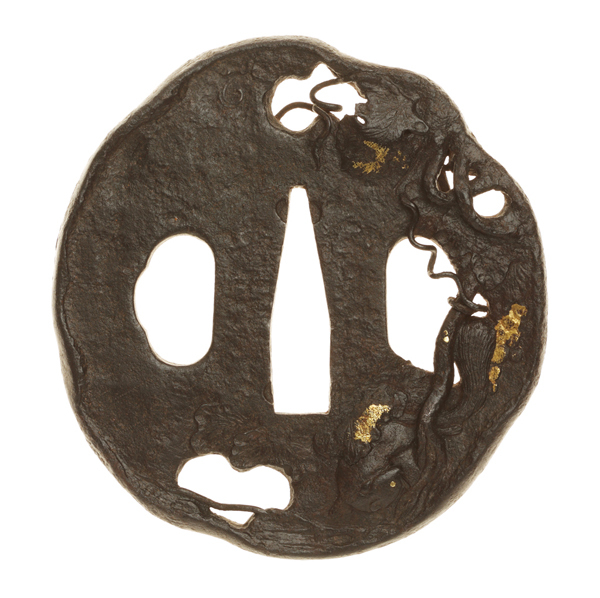 "笹の葉はみ山もさやにさやげども我は妹思ふ別れ来ぬれば"), It might be that this Tsuba was used by devoted samurais husbands like him. 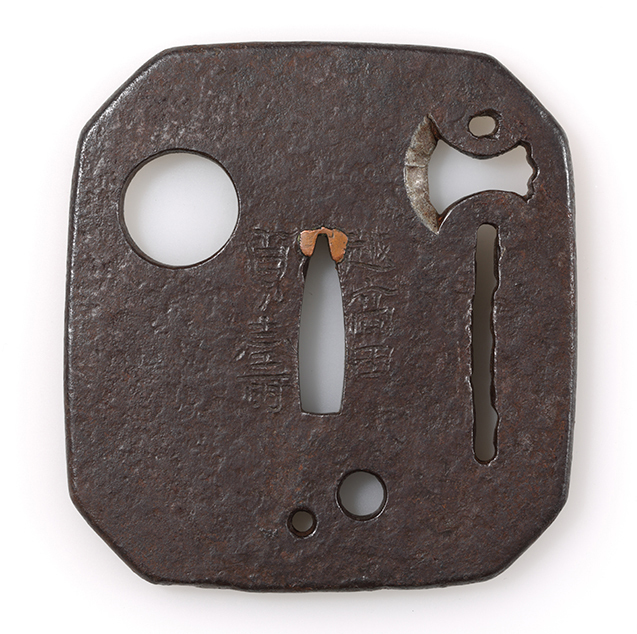 Motif Open work, shihô inome sukashi mokko-gata , "四方猪目透木瓜形"
ura : Shintô gotetsuren Myôchin Ôsumi-no-kami "神道五鉄錬　明珍大隅守"
Form : Japanese quince mokko shape "木瓜形"
Hitsu holes : two, ryô-hitsu-ana, "両Hitsu holes : "
itself. 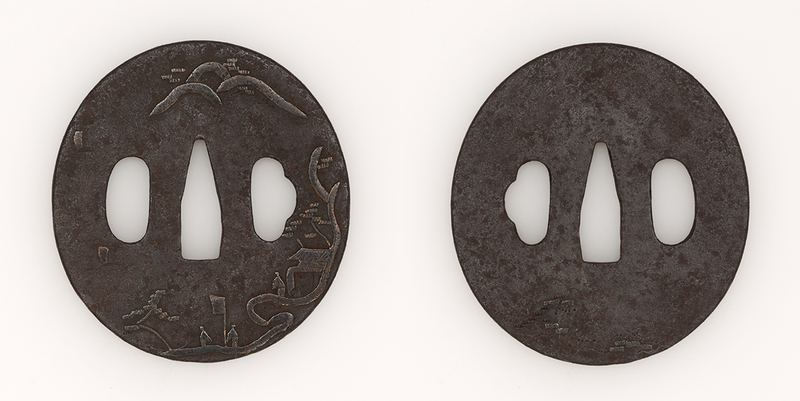 There is a small open work ko-sukashi at below left of Tsuba. Munemasa "宗正" had a family name Myôchin "明珍". He lived at Shônai, Dewa province. He worked around second half of Edo period. 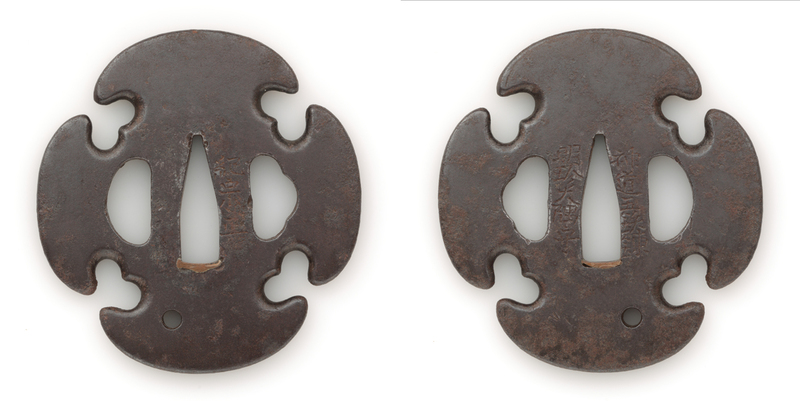 Motif　Eight bridges, Yatsu-hashi-zu, "八ツ橋"
Feature Good quality iron tsuba, expressed finely with sukashi pattern, combined with smooth and round surface, something swelled by water tension. The motif may be the dance of iris flower spirit. It is filled with refreshing energy. Condition There are some detached points on gold inlay. Feature　Red Oni who stand by Kibi-no Makibi is an incarnation of Abe-no Naka-maro who died in abroad, the Tang dynasty. It was said that Kibi-no Makibi was succeeded to decode encrypted story "Yaba Taishi" by the help of gods and Budda in the Tang dynasty, then introduced it Japan. It makes interesting contrast, calm expression of Makibi and grave expression of Oni. 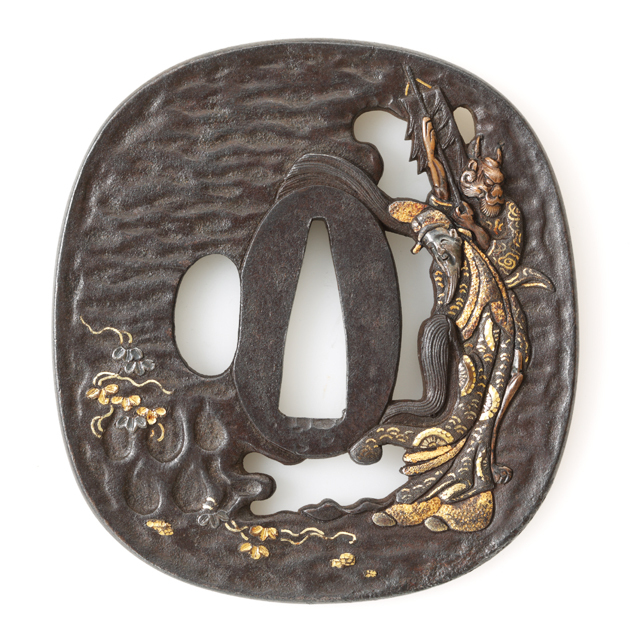 By advanced technique, craftsman was succeeded to create legendary world on the tsuba with a plenty of imagination. 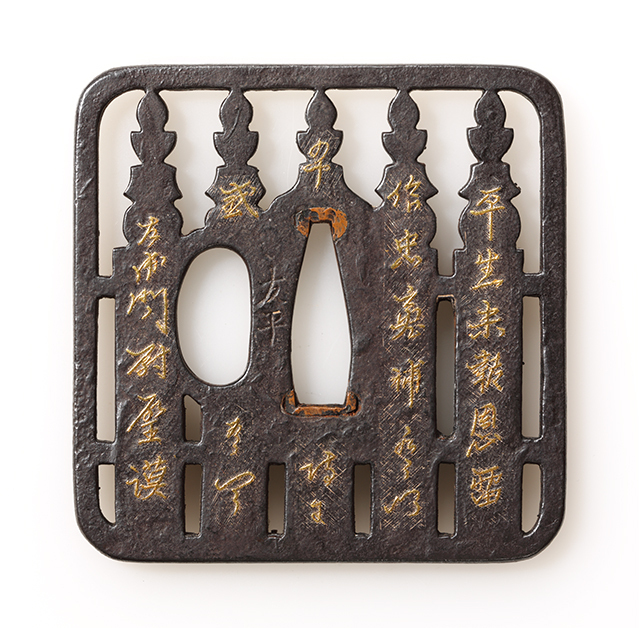 Material : Iron, gold, silver, "shi-bu-ichi", "su-aka", brass, "shaku-dô"
Feature Former poets, "Li Bai" and others creating the poets, facing the waterfall at "Lushan". This situation is the reason for the image. "観滝図" (enjoy the waterfall) was the pattern used repeatedly. 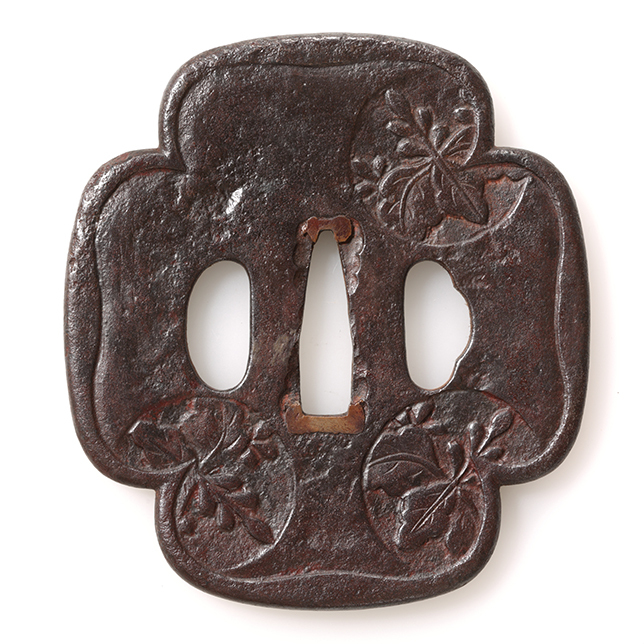 This tsuba used high quality irons, which was given suki-sage-hori. Surface change is so smooth. Magnificent working chisel. It attracts the refreshing beauty and scenery of the waterfall that runs the pure precipice. Use of several "iro-ganes" efficiently in detail. Plants such as pine or bamboo grass, smiling men of noble character, child bearing calabash, sailing boats are attracted strongly. In the world of unique color of iron, they add gay and exciting. 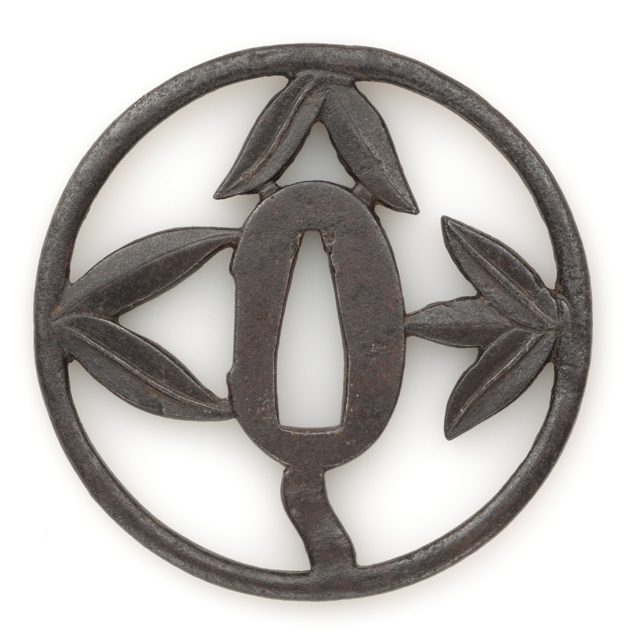 Feature Tsuba which explains an additional leaf of tsuru(tendril) and leaf by katagiri-bori on suaka-ji, which changed into the steady color by passed years. 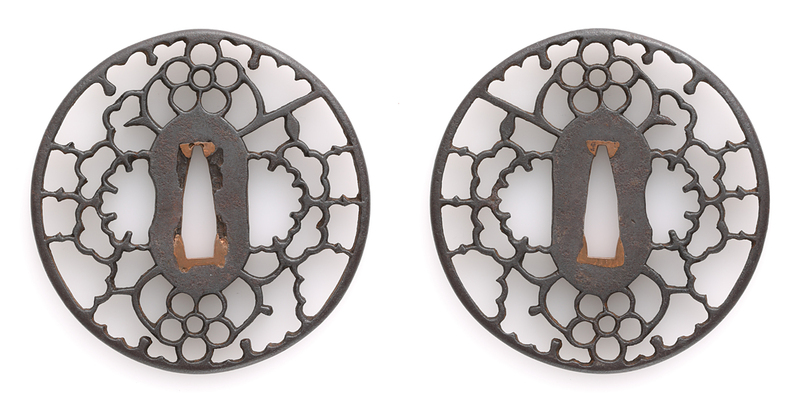 On addition to that, there are engraving of true circle sun in the center of tsuba on the two sides. It may wish accord or harmony. Conditions There are minute flaws. Trace of seppa observed. It might occur due to long mouting in koshirae. 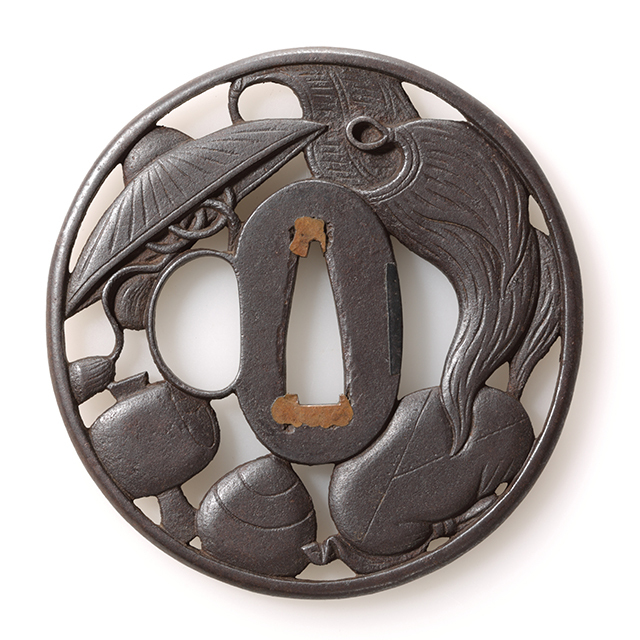 Feature Making a charming tsuba in the shape of round eggplant. Fresh cuticular of fruit is expressed in tetsu-migaki-ji in smooth. Calyx really looks like that as if it has thorns but no harm. 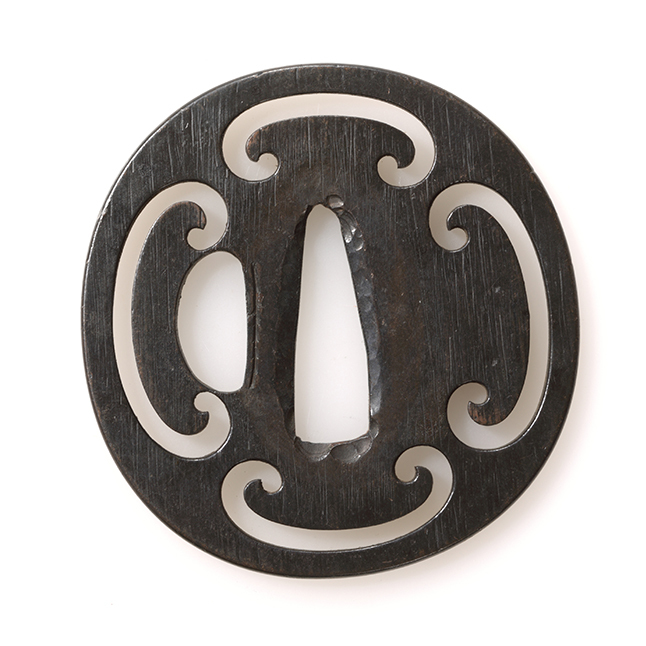 By care of soft cloth, such as "becchin", it is one of real pleasure, showing more gloss of black iron tsuba, not using other materials. 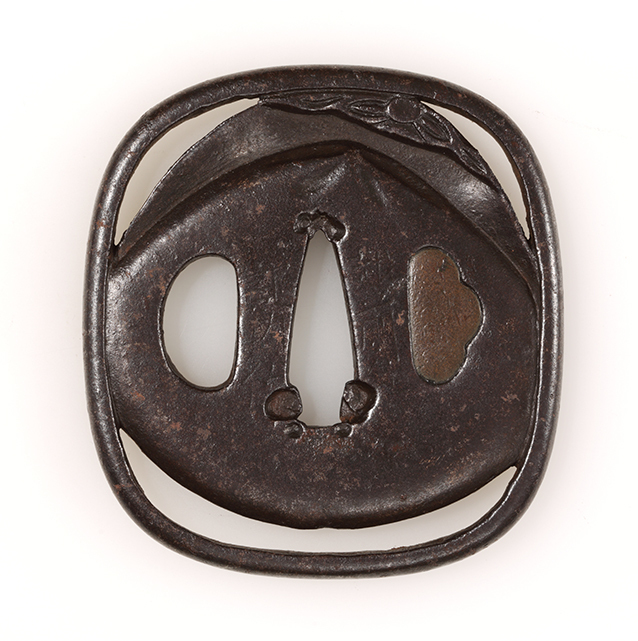 Depending on the care, the tsuba has potential to become more "delicious". Conditions There is few scratches on seppa-dai. 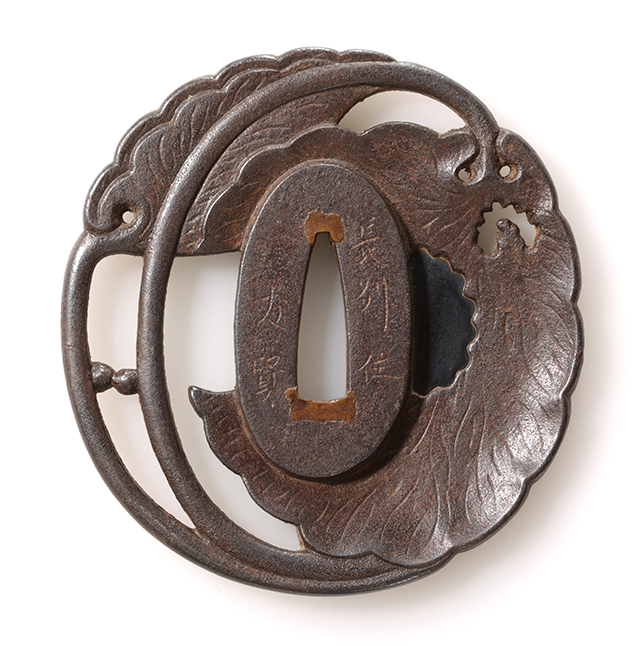 Feature The tsuba which has futatsu hiki-ryo mon sukashi as ji-sukashi, with round and thick iron ji(base). There appears spiral shape ji-mon both on omote and ura. It has mat and fine texture. It shows specific scene with the taste of iron rust in blueish calm tone and fine frosted surface. 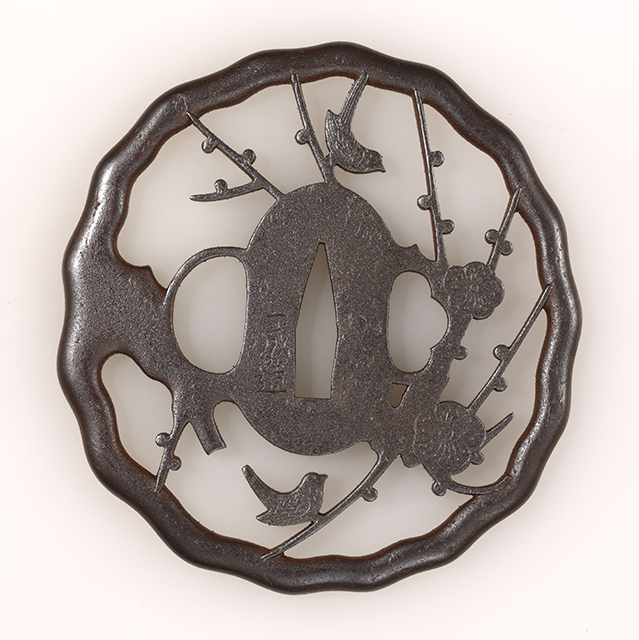 The tsuba of ji-sukashi on well grained iron base, the drawn motifs are : designed zuiun which is similar to shape of dragon, and, furins or bonshos, placed sýmmetry, up, down, left and right . 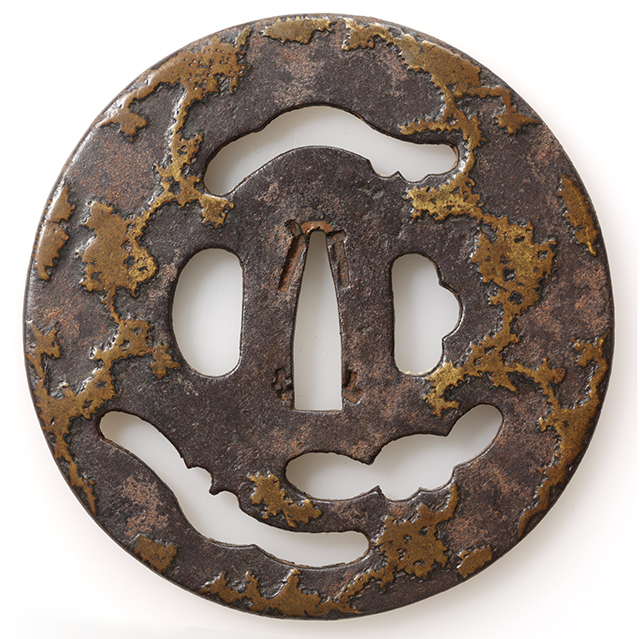 and the familiar sounds in daily life will inspire the samurai spirits who attach this tsuba to own cherished sword. 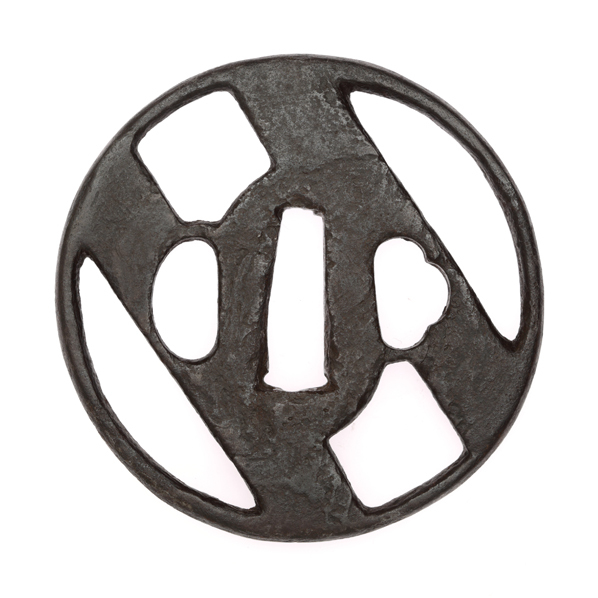 Feature Generous and specific Mokko Shape tsuba . 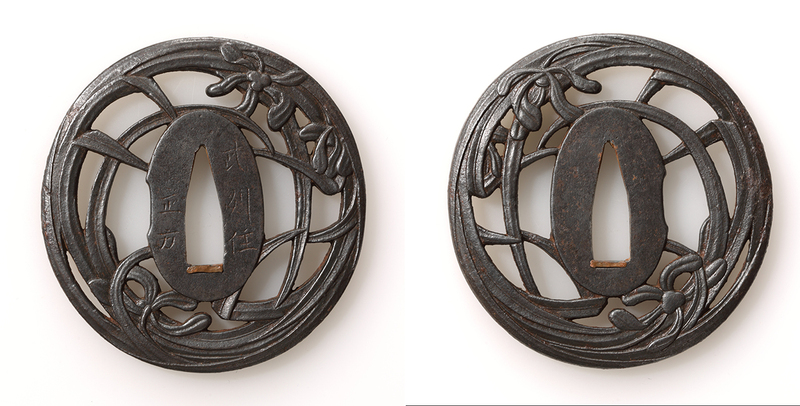 On total Iron -ji karakusa-mon Brass inlay is still attaching the gorgeousness even changed into current calm color. Conditions There is scratch, below left of ura(back)Hitsu hole, close of Mimi. 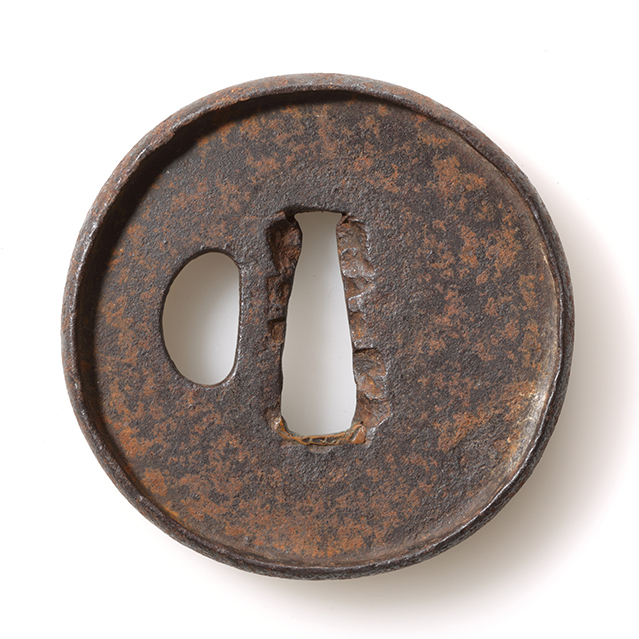 There is scartch on the metal of sukashi filling, of Omote(front) beside of left koka Hitsu hole. 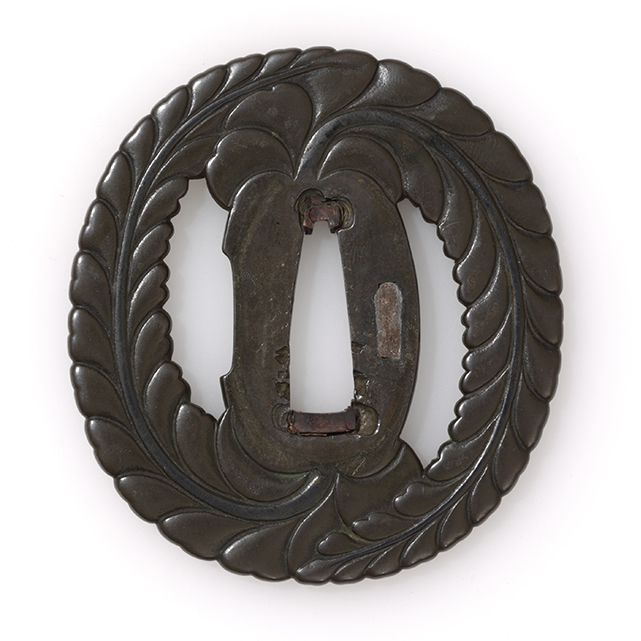 There are some detachments of Brass inlay. However, it becomes smooth and fit, as feel of passing times. 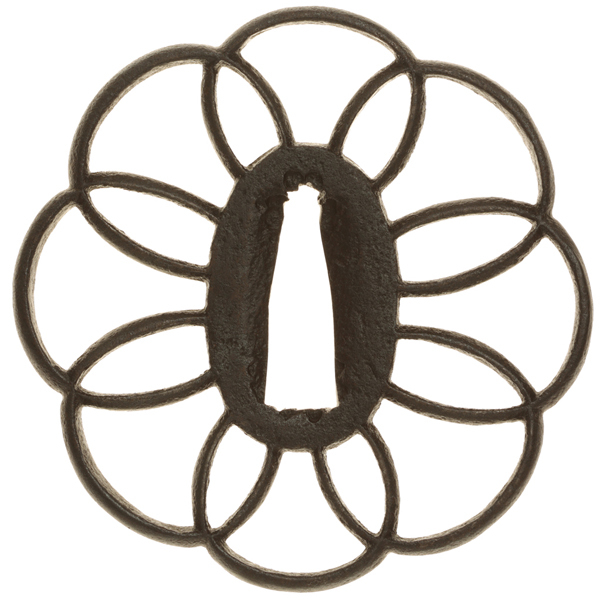 Feature : Sukashi with eight circles, even width, combined like flower, is large and strong but reducing the weight in its finish. The taste of color is well with charm. It has nice presence attached with koshirae. Period : Edo, first half. 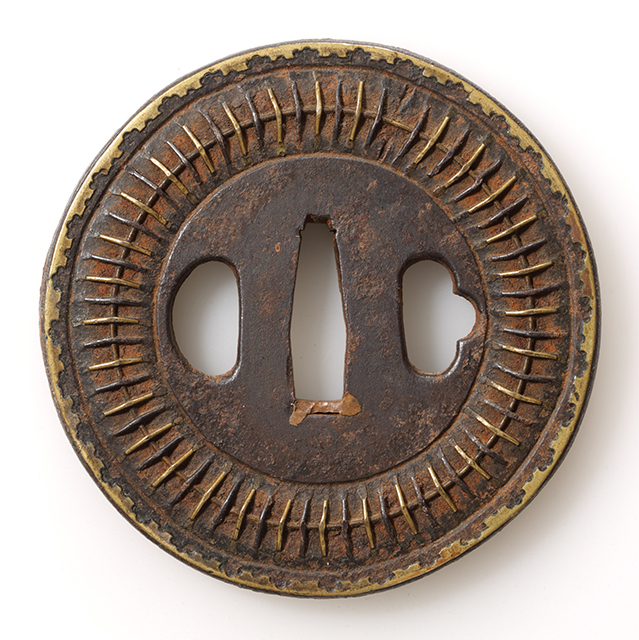 Feature : Hitsu hole which reminds us tea storage bowl, the shape of kawari-mokko is so specific. Not wither but elegant. 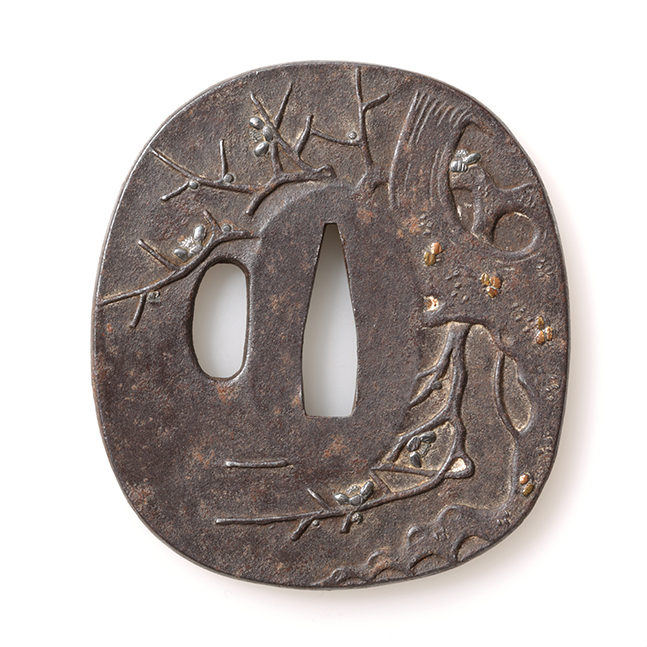 Higo tsuba which has well grained iron with the fine texture. Karakusa pattern, well balanced composition, it looks attractive with shining. 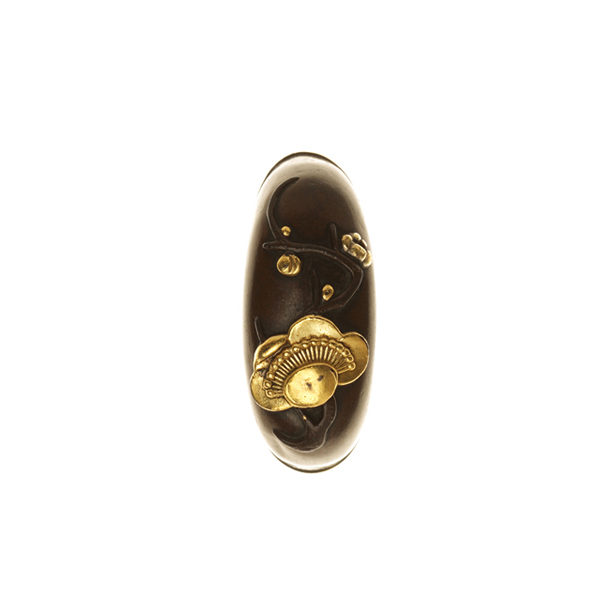 Feature : Chidori and waves which contrast of gold and silver is significant. 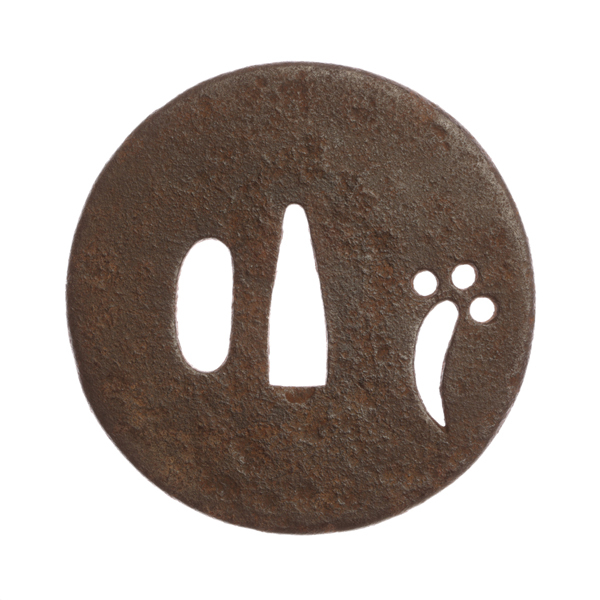 They are drawn on well grained iron. Conditions : There are a few scartches on the back nagakogohitsu. The rest remains excellent conditions. Feature : Squirrels are attractive. The dessin of them, flying and turn, are wonderful. Certificate paper : Not attached. 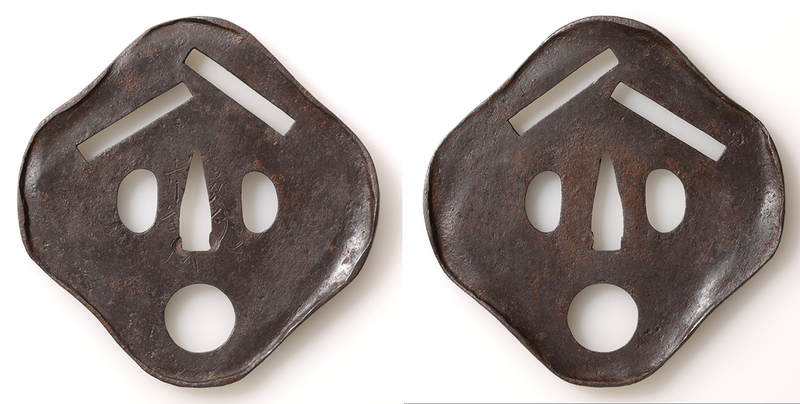 Material : Iron. Hitsu hole : two hitsu holes. Feature : On well grained iron, spider nest and plants are drawn by gold nunome inlay. 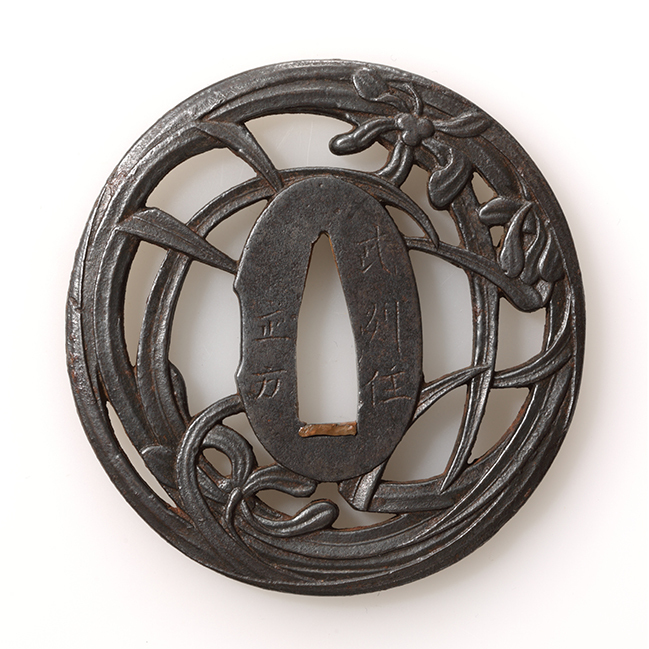 Splendid and massive tsuba. Feature : Radomly rayout hori makes some sense of moving. It makes fun. 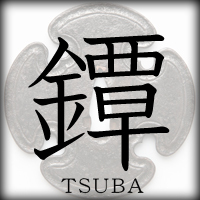 Tsuba which as simple taste. Kiri box : Not attached. Made by Touken Komachi tsubacase attached. Feature : On the profoudly massive feeling ita tsuba, wave motif come up palely. No excessive decorations as if sound of wave could be heard. Certificate paper : Not attached. 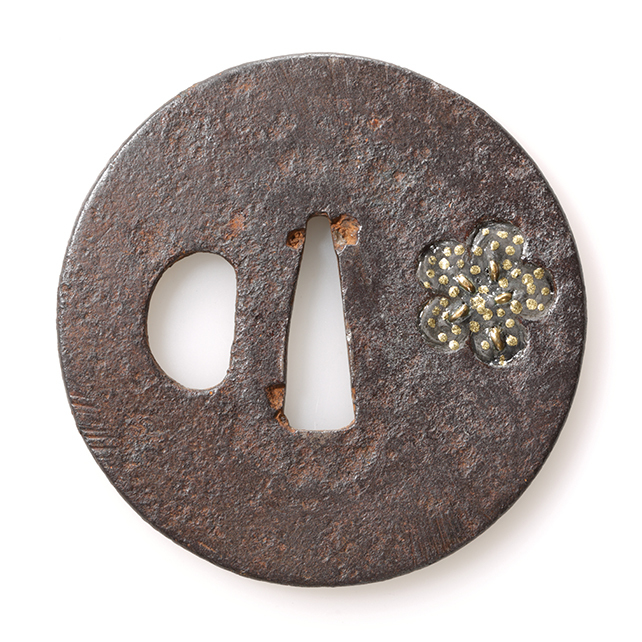 Feature : With paulownia cho-ji motif sukashi, plain taste iron tsuba. Thin and light. Item number : [ B380319 ] NEW!! 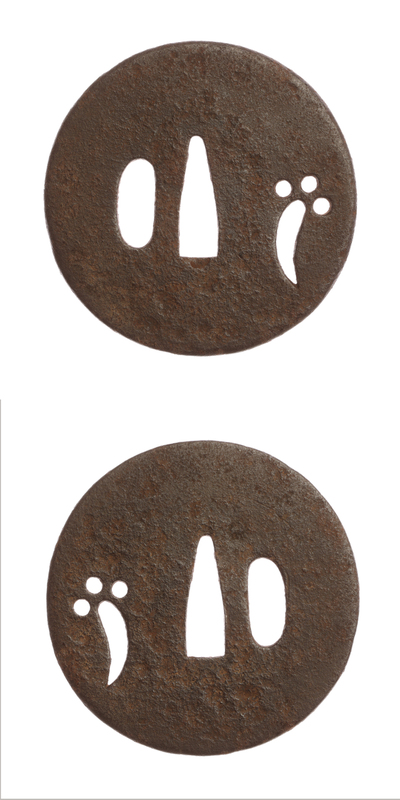 Motif : design of paulownia "桐文散図"
Shape : cross and a Japanese quince "十字木瓜形"
Feature : Applying tsuchi-me engraving on well grained iron. 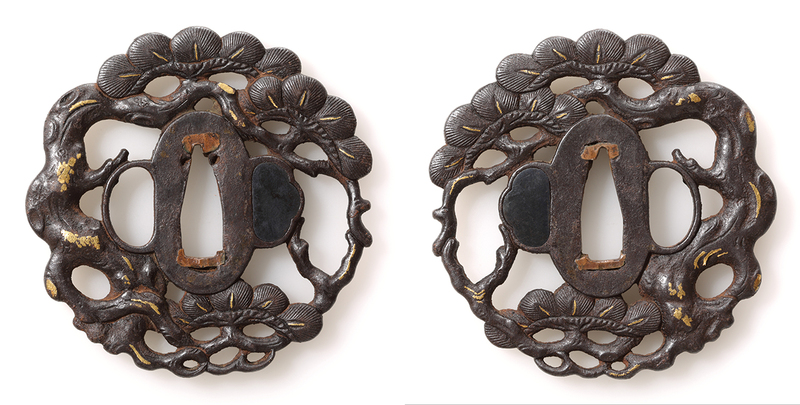 In graving round shapes, paulownia design crests are dsitributed, which looking different directions, by usu-niku-hori technique. Three on front, two in back. Item number : [ B370319 ] NEW!! Motif : design of waves "波図" hami-dashi-tsuba "喰出鐔"
Certificate paper : n/a Material : shakudô "赤銅"
Technique : hairlines ke-bori "毛彫"
Feature : Sufficient width, smooth shape, fine form hami-dashi-tsuba "喰出鐔". Design of waves are engraved on edge mimi "耳" part as well. Item number : [ B360319 ] NEW!! Motif : design of snow and bamboo grass "雪笹図"
Signature / artisan : "越前住紀内作"
Technique : reileif, openwork "肉彫地透"
Feature : Taking into considerations those different feel of materials , Bamboo leaves are expressed by migaki-ji technique, snow crystal part are ishime-ji technique. Impressibe tsuba in his own composition. Item number : [ B350319 ] NEW!! 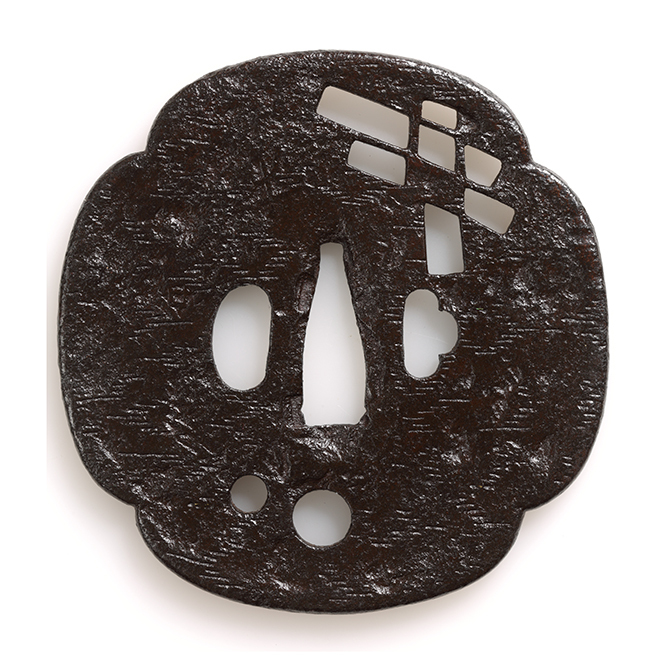 Motif : desing of plain-looking woman "お多福図透"
Signature / artisan : unknown signature "在銘"
Shape : design of an attractive girl despite her narrow eyes and flat nose ”お多福木瓜形"
Feature : Tsuba can be looked the face by the hole for kozuka "小柄櫃孔", for kô-gai "笄櫃孔", two rectangle holes in frown, one round hole and its outline. 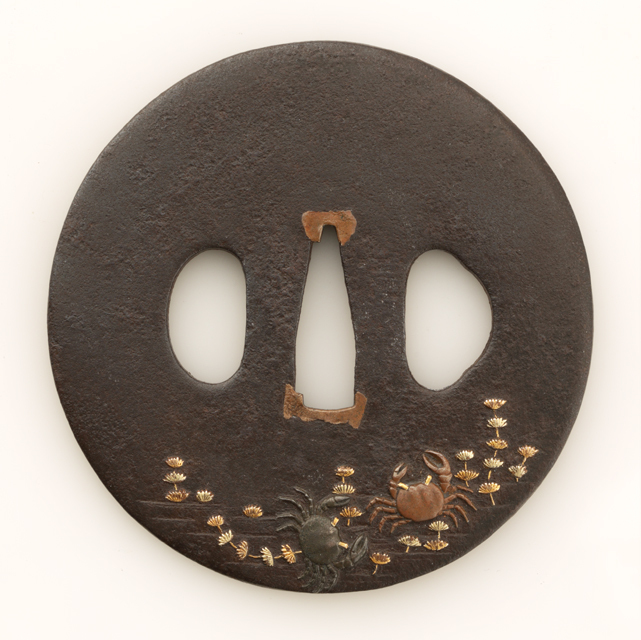 A large tsuba with sense of humor. Item number : [ B340319 ] NEW!! 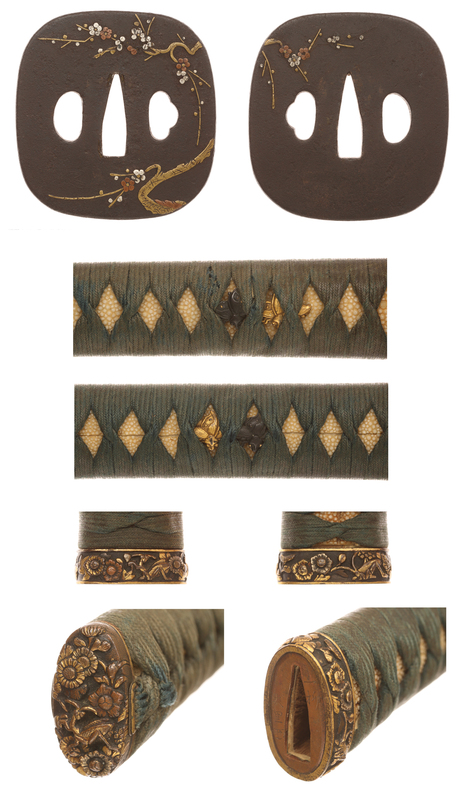 Motif : design of scenary "風景図"
Technique : texture inlay "布目象嵌"
Feature : It is difficult to see the exact design of scenary from remaining few gold inlay "金布目象嵌". 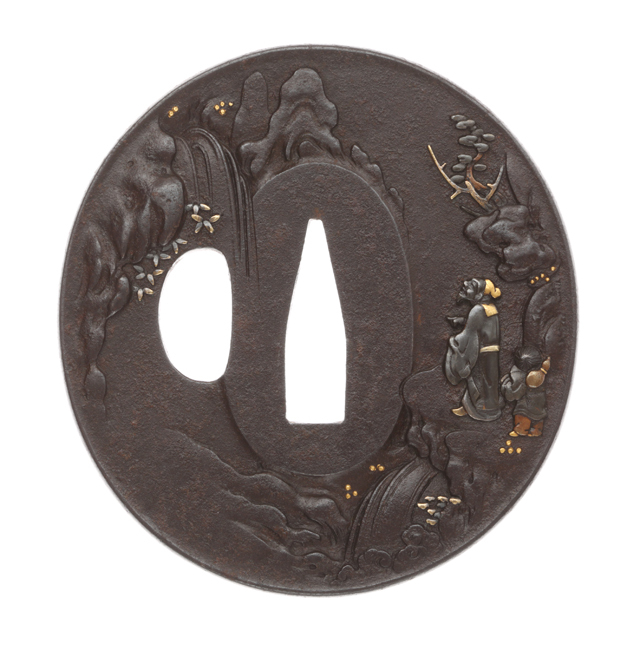 However, it is possible to see the tsuba used carfully regardless its aged appearance. Conditions : Some rusts and molderings. Item number : [ B330319 ] NEW!! 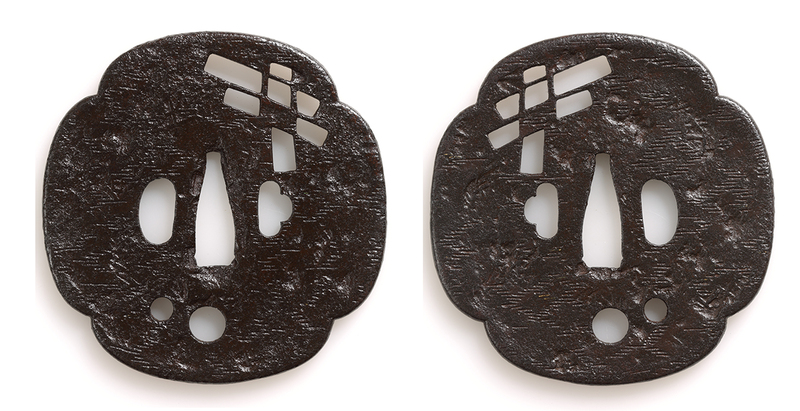 Motif : No texture sumon "素文" hamidashi "喰出"
Feature : Hamidashi tsuba made of shakudô with no texture. A little well-used ambience. Conditions : Some scratches and small flaws. Item number : [ B320319 ] NEW!! 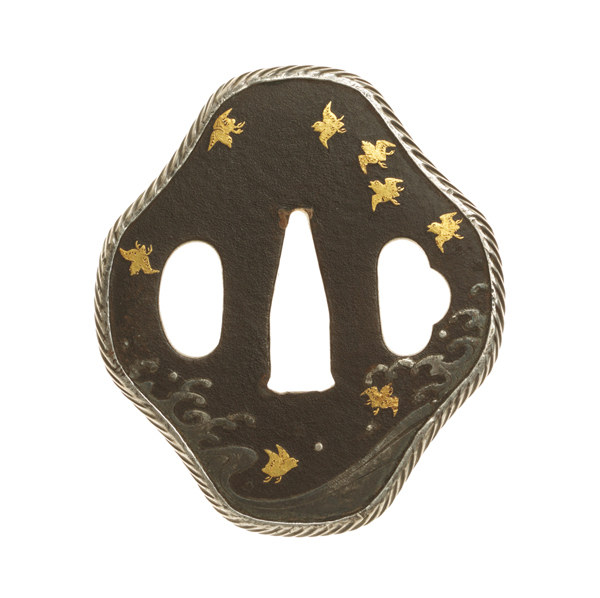 Motif : design of a man pulling fishing net at moon night "月夜網引図"
Technique : sue-mon zogan inlay "据文象嵌"
Hitsu holes : two ryô-hitsu-ana "両櫃穴 "
Feature : A man pulling fishing net at moon night, riding a boat on the river. Wearing a straw hat and a coat, hard to see his expression but something serious. Conditions : Scratches and detachment of inlay. Item number : [ B310319 ] NEW!! Motif : design of chrysanthemum "菊花透"
Technique : chrysanthemum open work "菊花透"
Feature : Hitsu hole's shape has specific form. 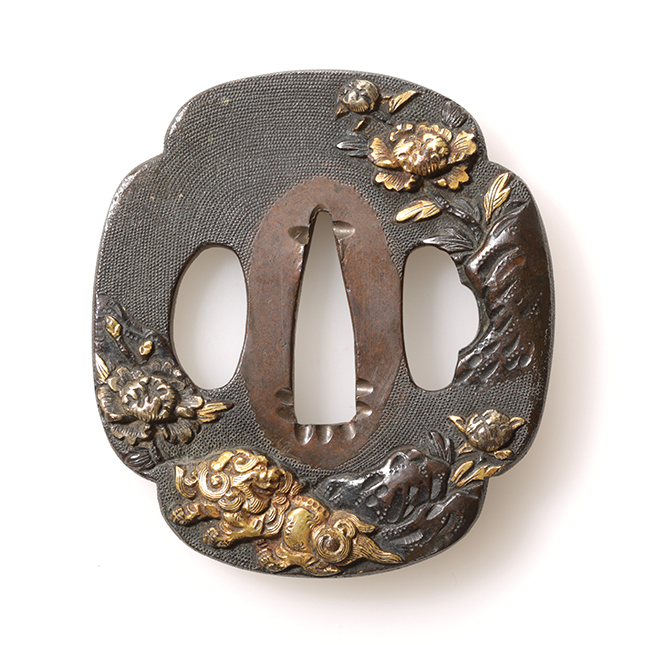 A smaller than usual size tsuba of chrysanthemum open work. Conditions : Red rust observed but it can be improved by polishing. Item number : [ B300319 ] NEW!! 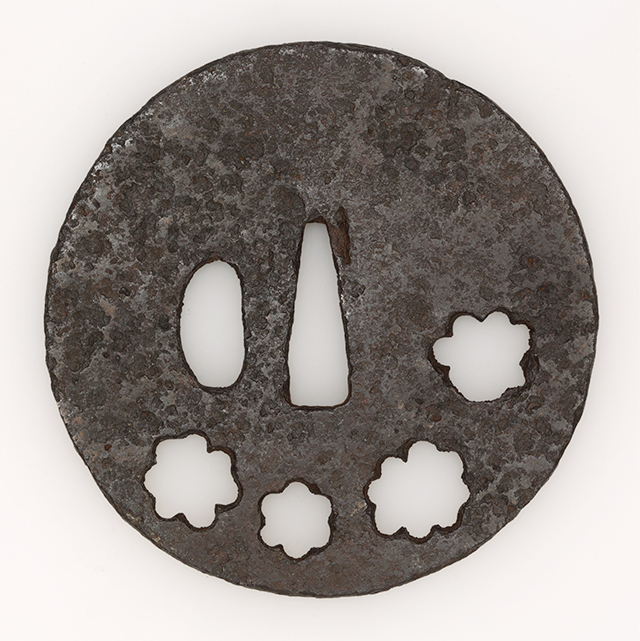 Motif : design of small flower "花小文"
Technique : mallet pattern "槌目地", small open work ko-sukashi "小透"
Feature : Inside of ume bloom shape ko-sukashi, half-transparent grey resin material fluid are filled, and expressing pistil of flower by brass wire. Gold colored many dots are distributed on the surface. An eccentric tsuba. Conditions : Some rusts observed but it can be improved by polishing. Item number : [ B290319 ] NEW!! 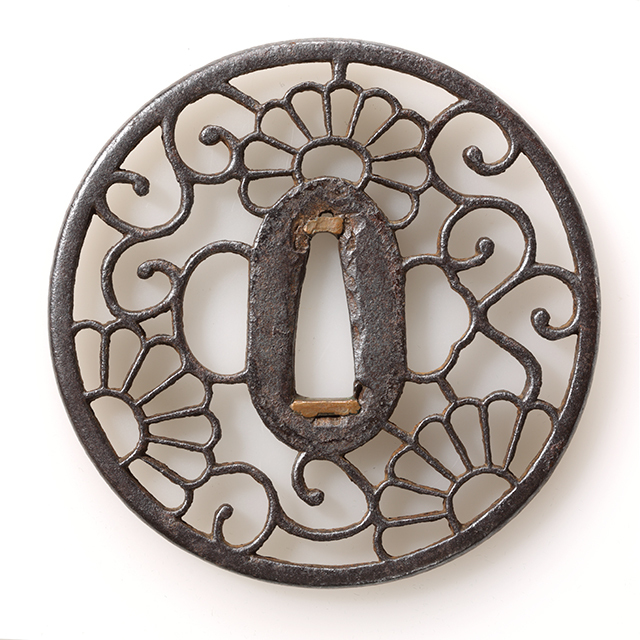 Motif : No texture sumon "素文"
Technique : mallet pattern "槌目地"
Feature : It looks like ancient armorer tsuba, high edge , round, mode of iron. Really it looks sturdy. Item number : [ B280319 ] NEW!! Motif : no texture, vertical lines by file"素文縦鑢"
Technique : vertical lines by file "縦鑢"
Feature : Modest gloss and calm tinge are well harmonized tsuba. On edge mimi, relatively wide pitch slash lines engraved. Conditions : Some scratches on edge mimi. Item number : [ B270319 ] NEW!! Motif : design of chrysanthemum "枝菊図"
Certificate paper : n/a Material : Iron　gold, su-aka "素銅"
Technique : nunome zô-gan inlay "布目象嵌"
Feature : Being thick iron tsuba. 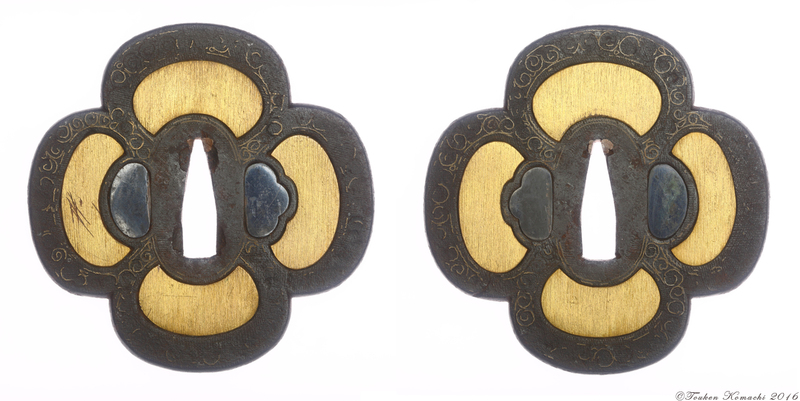 Design of chrysanthemum is expressed using gold and suaka in nunome zôgan inlay. Item number : [ B260319 ] NEW!! 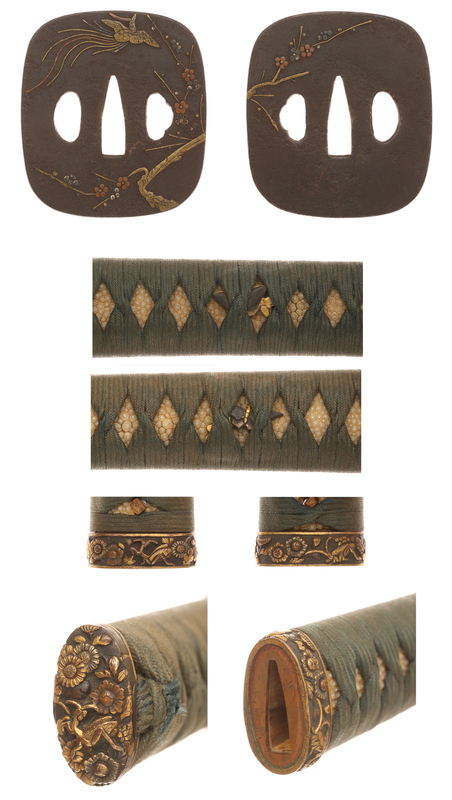 Motif : Design of mountain road scenery "山道図"
Technique : sue-mon zô-gan inlay "据文象嵌"　amida-yasuri file "阿弥陀鑢"
Feature : Crimped surface amida-yasuri engraving and suemon zIogan inlay which express mountain road. Each design is different on the front and the back. Item number : [ B250319 ] NEW!! 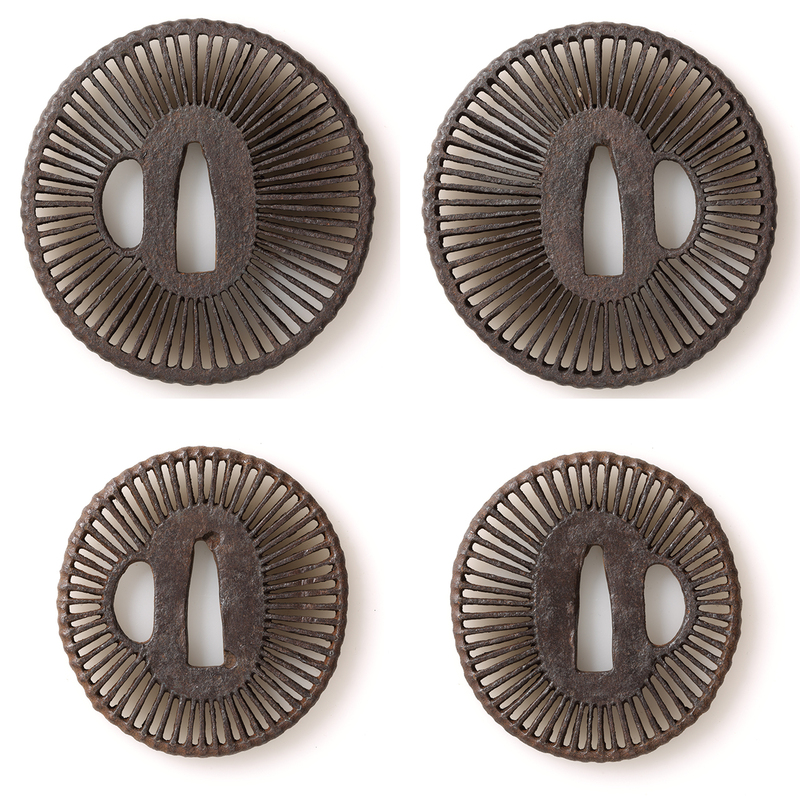 Motif : Amida-yasuri file "阿弥陀鑢"
Technique : Amida-yasuri file "阿弥陀鑢"
Feature : Small size ita-tsuba with fine radially lines, called amida-yasuri file. Item number : [ B240319 ] NEW!! 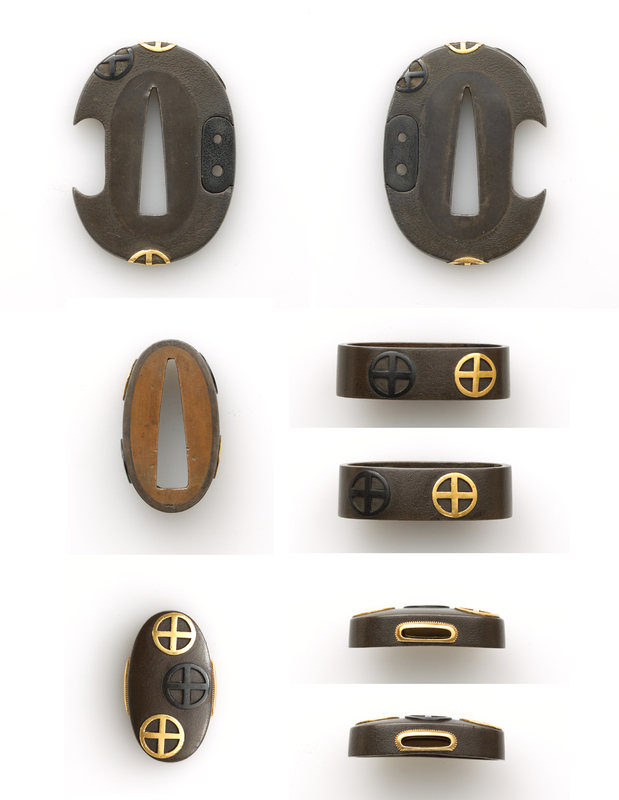 Motif : design of thunder "雷文透"
Feature : Simple open work tsuba with impressive design of thunder running slantways. Item number : [ B230319 ] NEW!! 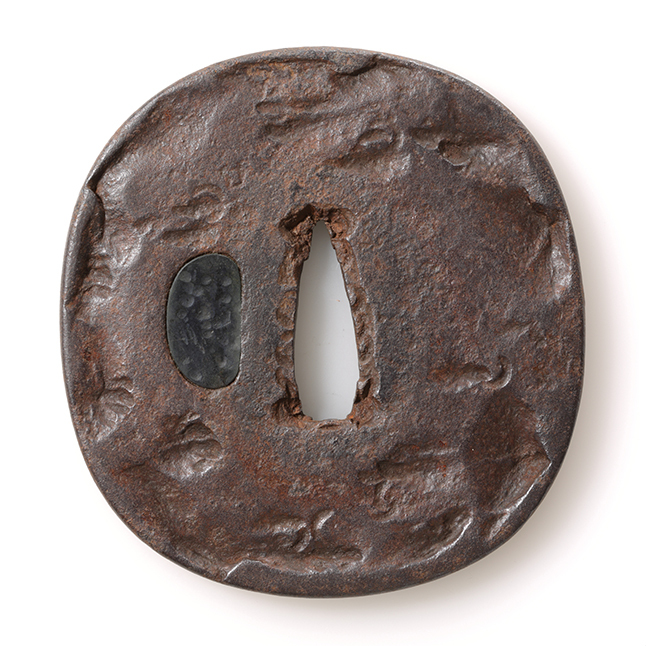 Shape :　mud flap shape aori-gata "泥障形"
Hitsu holes : one out of one hole filled "片櫃孔埋"
A tsuba, casually engraved lines, strong feeling or iron is stressed. Not by design but by material feeling charms. Simple and sturdy. Conditions : There is a few small rusts. Item number : [ B220319 ] NEW!! 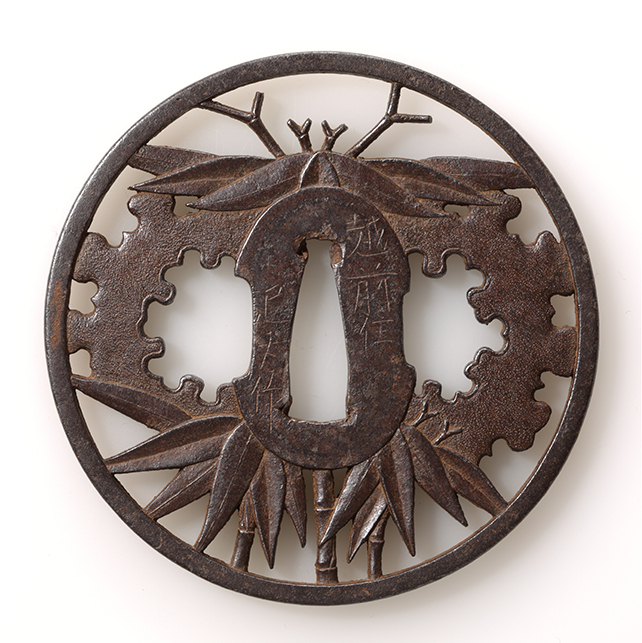 Motif : design of old pine tree "老松透"
Technique : engraving and open work niku-bori ji-sukashi "肉彫地透"
Feature : With distinctive character, elegant old pine tree expressed in its form, engraved by open work. 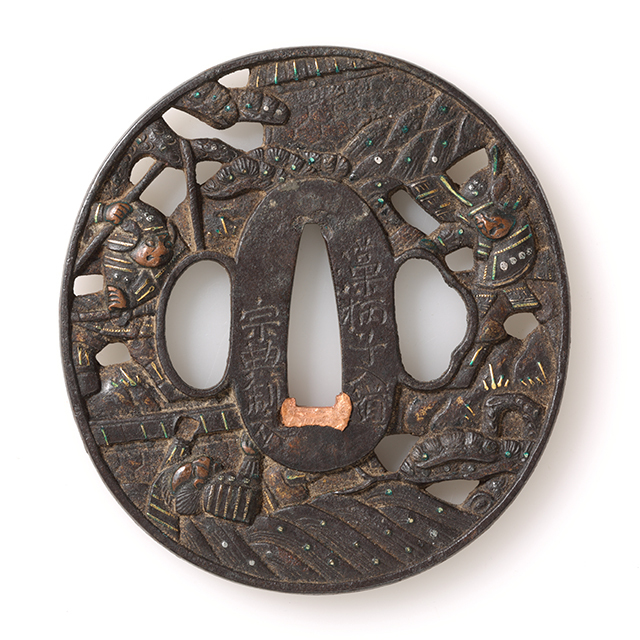 A tsuba filled with will of create. Item number : [ B210319 ] NEW!! 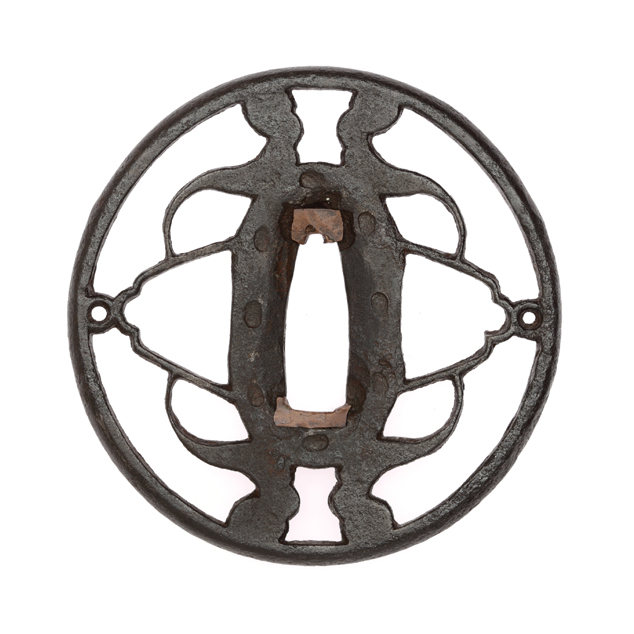 Motif : design of reel "糸巻透"
Shape : mud flap shape aori-gata "泥障形"
Feature : Design of reel, which close to water chesnuts shape, are made by openwork. in hitsu holes, patterns like fish tales are put diagonally facing oppsite directions. Conditions : Rusts observed generally. Item number : [ B200319 ] NEW!! Motif : design of enumeration treasures"宝尽図"
Feature : Straw raincoat, a sedge hat, a mallet, a hô-ju "宝珠" and a large cloth bag distributed in good balance, using niku-bori, ji-sukashi openwork technique. Item number : [ B190319 ] NEW!! 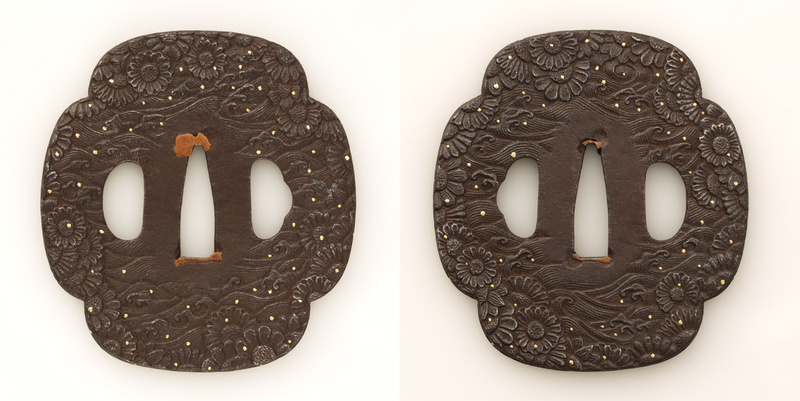 Motif : design of iris "菖蒲図"
Technique : hira-zô-gan inlay "平象嵌"　ko-sukashi openwork "小透"
Hitsu holes : two "両櫃穴"
Feature : On iron base tetsu-ji, by gold hira-zogan inlay and kyo-sukashi open work, scenery of iris blooming in the garden expressed. Conditions : Some detachments of gold inlay. Generally excellent. Item number : [ B180319 ] NEW!! Motif : design of geese and armor "雁鐙透"
Technique : open work ji-sukashi "地透"
Feature : On design of armor, design of geese connection are expressed simply and strongly. It may improve the gloss condition by polishment. Item number : [ B170319 ] NEW!! 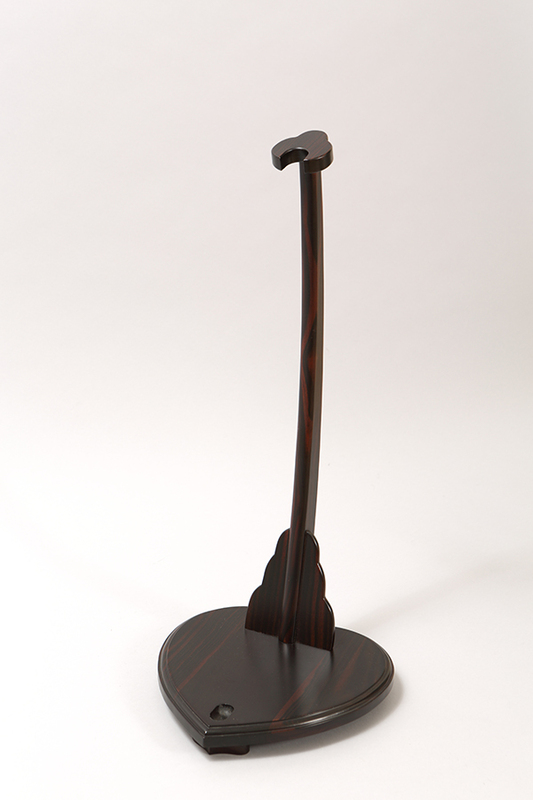 Motif : design of Japanese pampas grass "薄図"
Technique : nunome-zogan inlay "布目象嵌"
Feature : On glossy polished iron base tetsu-migaki-ji , engraving like zen-calligraphy called ensô "円相". Around edge, design of Japanese pampas grass expressed by nunome-zôgan inlay. 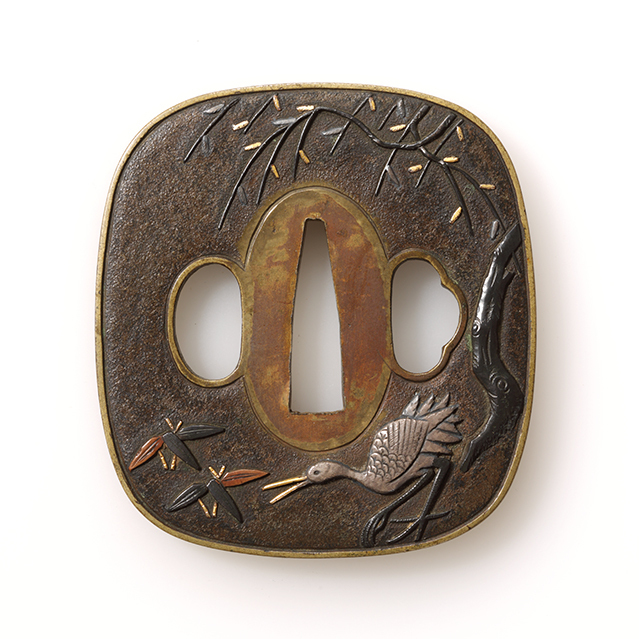 A tsuba with elegance. Conditions : Some scratches and small rusts. Item number : [ B160319 ] NEW!! Motif : design of peony and lion "牡丹獅子図"
Shape : Japanese quince mokko "木瓜形"
Technique : nanako-ji "魚々子地"　taka-bori "高彫"　iroe "色絵"
Feature : Small size shakudô tsuba. Peony and a child of lion are expressed by taka-bori technique. 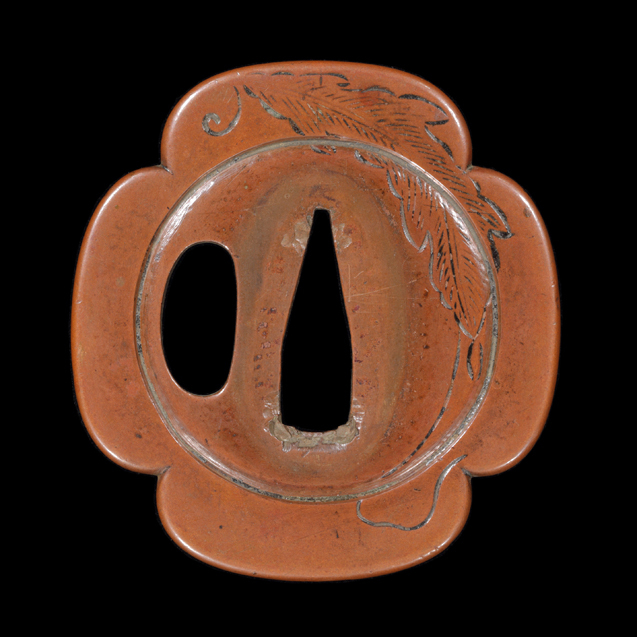 A tsuba with gorgeous kin-iroe. Item number : [ B150319 ] NEW!! 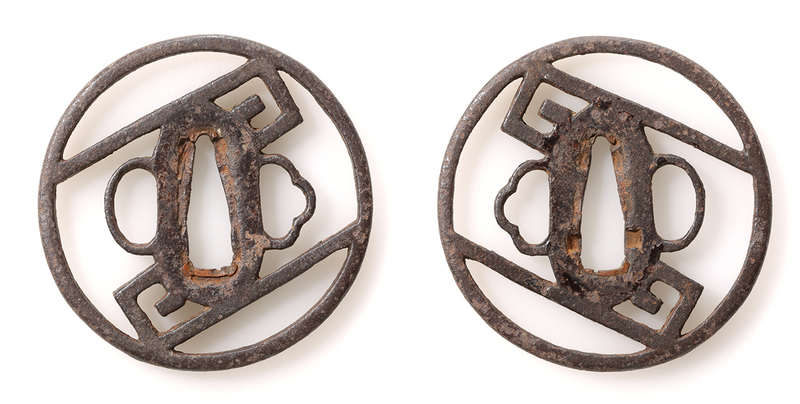 Motif : design of slop basin for Japanese tea ceremony efugo "餌畚透"
Shape : octagonal (shape) "八角形"
Feature : Octagonal ita-tsuba. 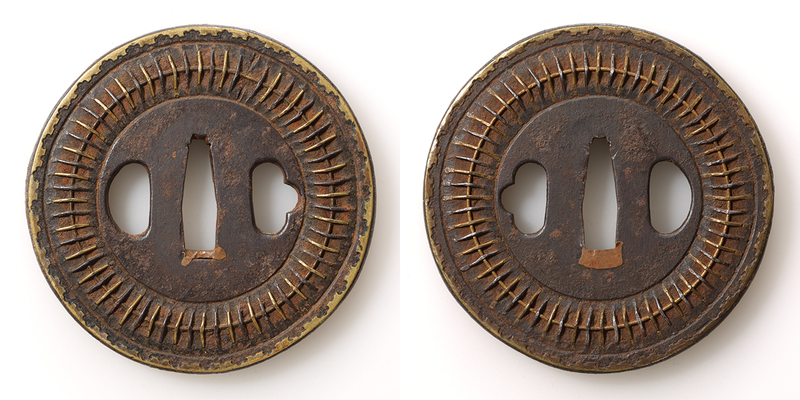 Both hitsu holes have open work design of slop basin for Jananese tea or tea jar as large open wroks. Upper part, there is design of water chestnut openwork. 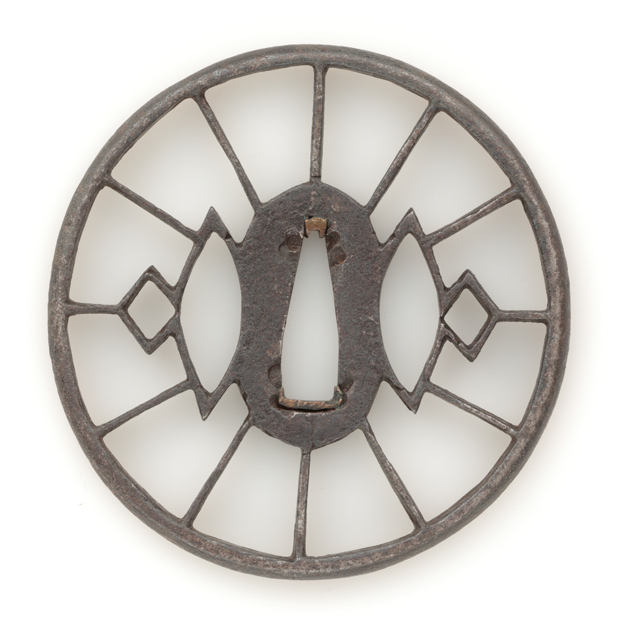 Lower part, there is a design of connected circles openwork. Conditions : Pale rusts observed. Item number : [ B140319 ] NEW!! Motif : design of Japanese apricot tree "梅樹図"
Technique : usu-niku-hori engraving "薄肉彫"　sue-mon zô-gan inlay "据文象嵌"
Feature : Old ume tree with dignity, its branches are expressed by usu-niku-hori engraving technique. Conditions : Some pale rusts. Item number : [ B130319 ] NEW!! Motif : design of Japanese silverleaves "石蕗透"
Signature / artisan : Chô-shû-jyû TOMOTAKA "長州住友賢"
Feature : Glossy big leaves of Japanese silverleaf (Farfugium japonicum) and dew drops. A little worm-eaten trace show the vital force, including undrawn insects. 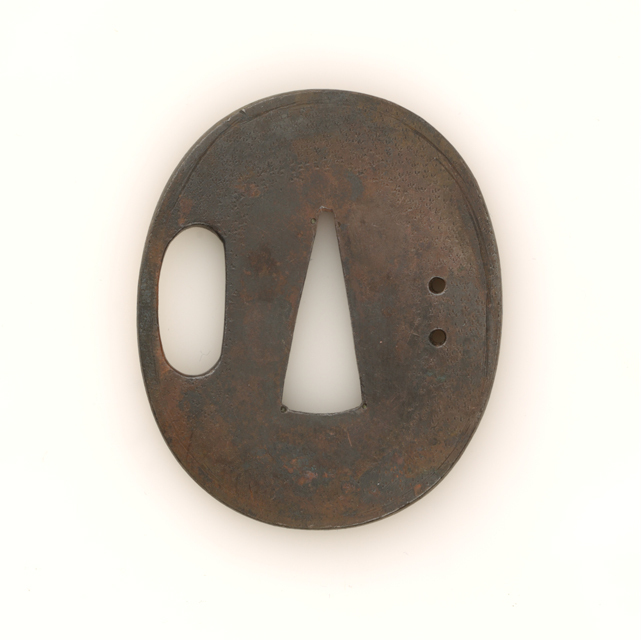 Tomokata "友賢" was a tsuba-smith of Ogi, Chô-shû province in late Edo period. Item number : [ B120319 ] NEW!! Motif : design of four directional branch leaves "四方蕨手透"
Certificate paper : n/a Material : shaku-dô "赤銅"
Technique : ko-sukashi "小透"　vertical lines by file "縦鑢"
Feature : Vertical file lines on shakudô base, it has openworks toward four directions. 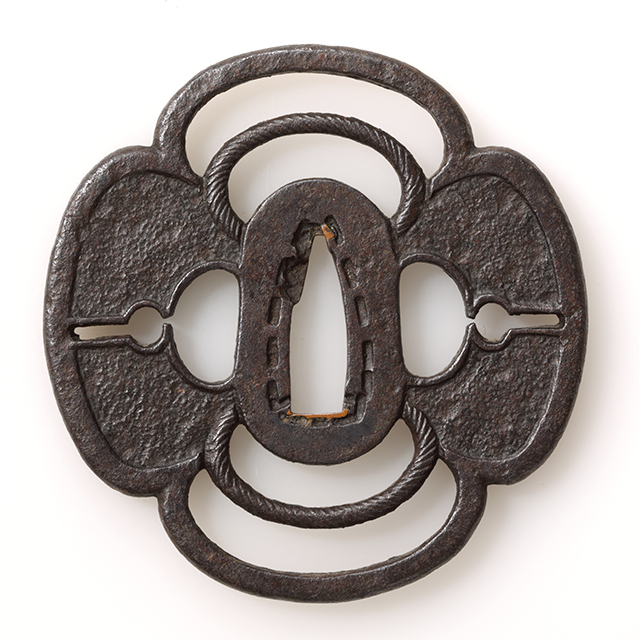 Design of bracken shaped grips are made as openwork. 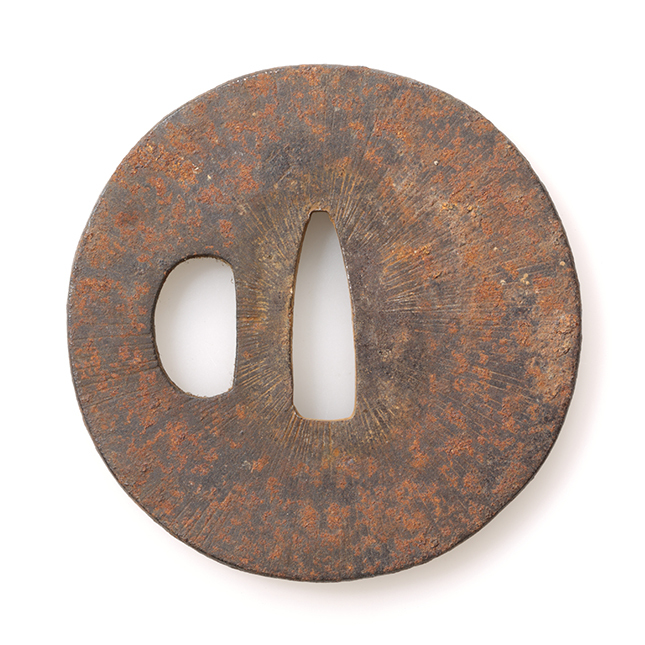 Thin small tsuba. Item number : [ B110319 ] NEW!! Motif : design of landscape "山水図"
Shape : Japanese quince mokko shape "木瓜形"
Feature : Design of china's scenic beauty place is expressed by usu-niku-hori engraving. Once projecting oneself into the man who rides on the boat, one can be healed by sublime nature view. 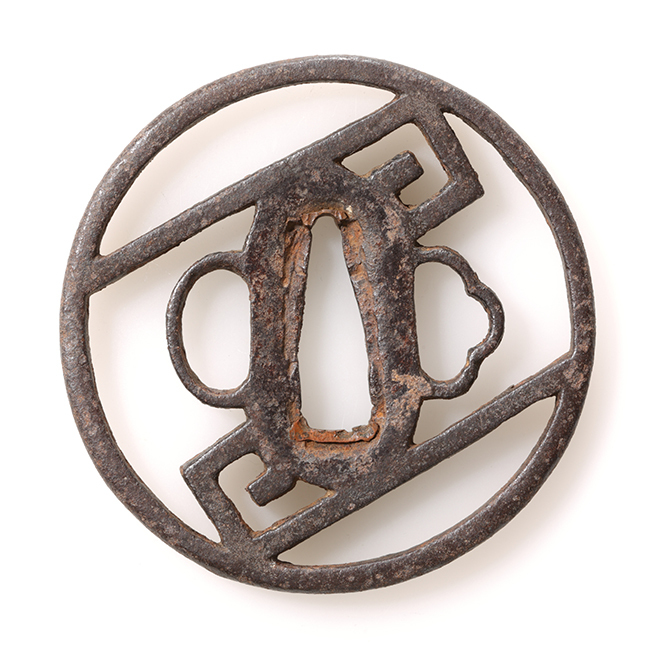 Conditions : Pale rust but it can be improved by maintenance, polishing. Item number : [ B100319 ] NEW!! Motif : design of chrysanthemum and star "菊花星透"
Shape : 15 sides chrysanthemum "十五辺菊花形"
Feature : 15 sides chrysanthemum and same number star design are made by open work. It looks solid. Conditions : Pale rust. Partly, prominence rusts observed. Item number : [ B090319 ] NEW!! Motif : design of clove "丁子透"
Shape : sloping edge "撫角形"
Feature : Design of clove or palmetto patterns are expressed by openwork. Conditions : Small rust but it can be imporved by maintenance. Item number : [ B080319 ] NEW!! Motif : design of geese and butterflies "雁繋蝶透"
Feature : Making butterflies’ tactile organ design into connect of geese design. Interesting design which reminds the movement of butterfiles' shape and movements. Item number : [ B070319 ] NEW!! 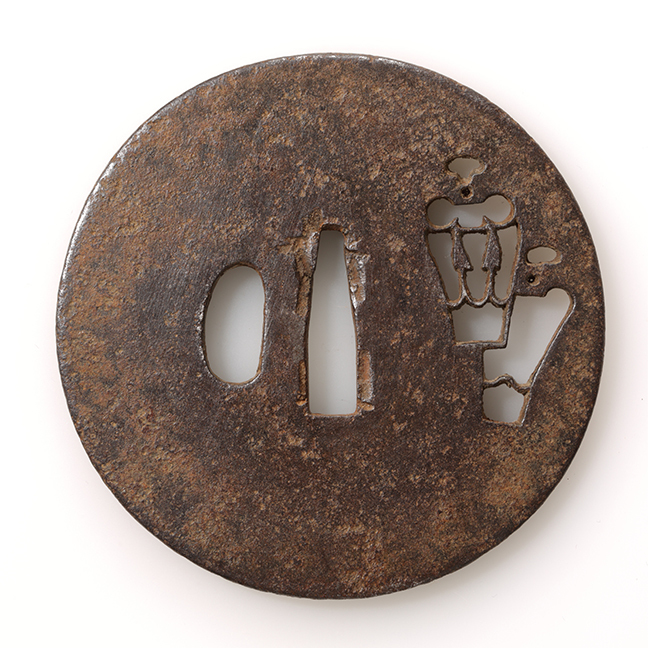 Motif : design of tea pot "茶壺小透"
Feature : Well grained thin tsuba. Item number : [ B060319 ] NEW!! Motif : design of orchid "蘭図透"
Signature / artisan : Bushû-jyû MASAKATA "武州住正方"
Technique : niku-bori ji-sukashi openwork "肉彫地透"
Feature : Flowers and leaves of orchid are made into round tsuba design with open work. MASAKATA was second generation of Bushû Ito family. He lived at Kanda-Shirogane-chô, Edo. He used flower of orchid, bamboo and other leave as his motives. Back to top of the page　/ Order by using form mail is here . Item number : [ B040319 ] NEW!! 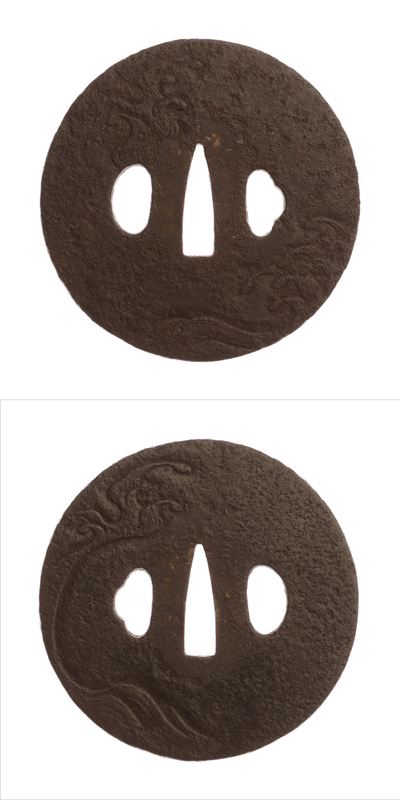 Motif : design of Zhang Fei / Guan Yu Chô-hi Kan-u "張飛関羽図"
Signature, metier : Ô-MORI Terumasa "大森英昌"
Material : shaku-dô "赤銅", su-aka "素銅"
Technique : katachi-bori "容彫", sue-mon "据文", gold iroe "金色絵"
Feature : Ô-MORI Terumasa was born in Hoei 2(1705). He was a pupil of YOKOYA Sô-min. He became independent during Kyô-hô era. He was a founder of Ô-mori school. And he lived at Senken-chô, Edo. Ô-mori school became one of influential school in YOKOYA school since second generation Hide-hide and third generation Hide-mitsu were both outstanding Tsuba-smith. This was made by Ô-mori Terumasa, who was good at design of character. From the novel "三国志演義", he used two main characters as his motif, "張飛" and "関羽". Both of them worked for "劉備", vowed bonded-brotherhood . They are expressed precisely as brave and fearless commanders. Description filled with the sense of speed, such as 関羽's long mustache divided into two, right and left like flame. It can be missed that the imagination makes some sense of humor. Item number : [ B050319 ] NEW!! 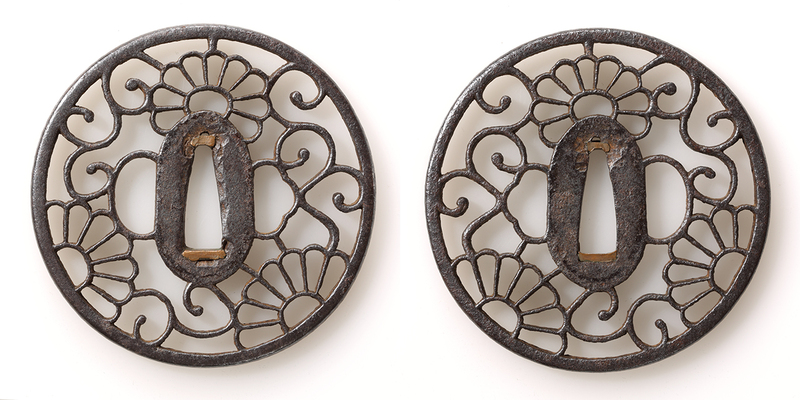 Motif : design of old Chinese story characters "孟嘗君食客図"
suddenly work in extraordinary scenes. Origin from such legend and history "史記・孟嘗君列伝", the guard, coq, fox and a thief are made into the motif. 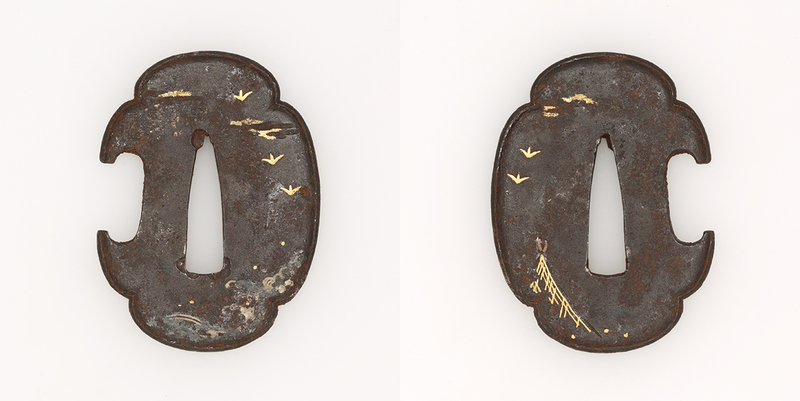 They expressed and engraved into menuki. Calm and round engraving touch is its character. Item number [ B100818 ] NEW!! Period :　Edo, very end of. Certificate paper :　Hozon tôsôgu paper (NBTHK) Material :　Shaku-dô "赤銅", su-aka "素銅"
Technique :　Katachi-bori "容彫", kin iroe "金色絵"
Feature : Cane and hag mask, casually released Nô-mask straps. 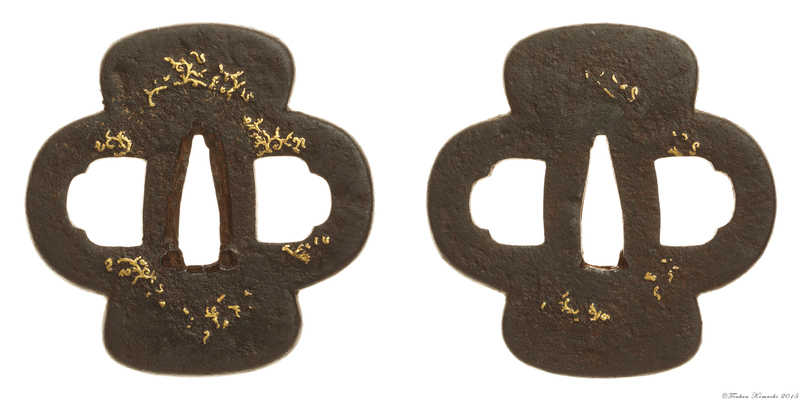 A pair of menuki, which convey us a lingering sensation of Nô theatre scarlet maple leaves Momiji-gari "紅葉狩". 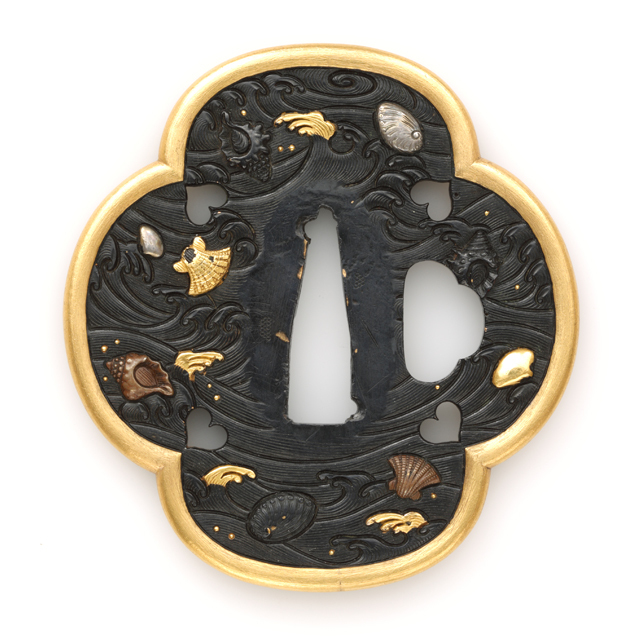 Imaging an extermination of demon by TAIRA no Koreshige, wishing ones lovable sword have breaking evil, there might be smart samurai who chose the menuki with such motif. The expression of hag are so impressive viewing from any angles, it even feels full of life. Certificate paper :　n/a Material :　Shaku-dô "赤銅"
Technique :　Katachi-bori "容彫", kin-gin iroe "金銀色絵"
Feature : Delicate expression cherry blossom flower fastened in the hair attached glossy deep black colored gourd menuki which reminds joyful party at spring field. Motif :　Bees Hachi-zu "蜂図"
Feature : Lifting the feathers and bends the chest and abdomen bend into Japanese hiragana character "く". Sharpening all senses by stepping on feet. The eye of a bee figure looking at the target. 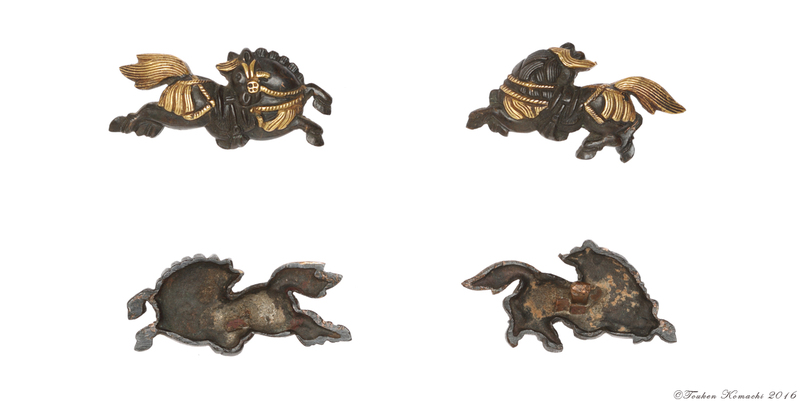 Motif :　Horses uma-zu "馬図"
Technique :　Katachi-bori "容彫", suemon-zô-gan inlay "据文象嵌", kin-gin-iroe "金銀色絵"
Feature : Excellent fine horses with Renzen-ashige "連銭葦毛" pattern that run with a dignified frame. Muddy and saddle are also magnificent and gorgeous. Motif Cross in a fern shida-ni jyû-monji-zu "歯朶に十字紋図"
Certificate pater　NBTHK Hozon tôsôgu papter( issued on 14th April Heisei 11(1998)) Material　Shaku-dô "赤銅"
Technique　Ishime-ji "石目地", katachi-bori "容彫", gold kin iroe "金色絵"
Feature : At the beginning of new year, they are attached to shime-nawa rope kazari decoration or kagami-mochi. Ura side is white shiro, so that they are also called ura-jiro. 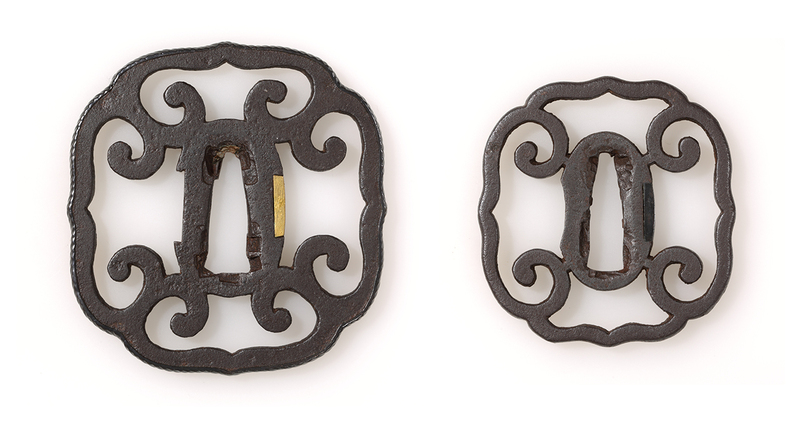 Replacing them symmetrically, it is symbolizing happy couple or the prosperity of one's offspring. A design, cross in the circle, surrounded by fern. It seemed that those were ordered and created for commemorating sword koshirae, celebrating the happy event. Conditions　There is a little scratches on ki-iroe. 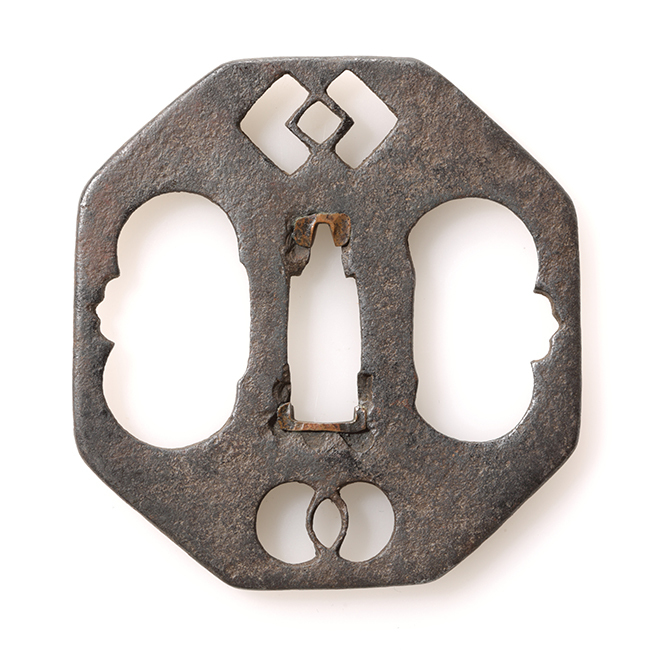 Feature Design of kakure-mino(cover), which consists of mino, kana and kozuchi, is expressed by elegant engraving. Strings of mino, mokume pattern of kochi(mallet) and woven patterns of braided hat are engraved by no futher detailed ke-boris with reality. According to the notice of NBTHK Hozon-tosougu appraisal result was pending, "It requires the study on creation period". 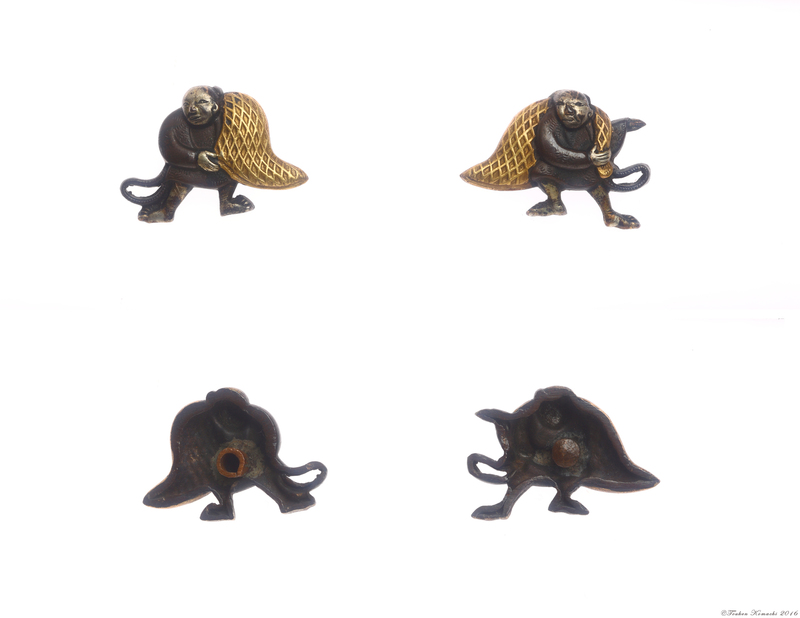 The menuki which has unknown pleasure. Feature The volume distinction is given to shaku-do-ji which has warm in color. The motif of canes and surplice, which made by the beauty of form, drawn by the contrasts of lines and curves. The tip of canes have nodes, handle of canes are decorated fine chisel drawing circles. Very elaborate finish with kin-iro-e on some parts, "rusu-moyo" which shows they are owned by high priest or nobleman. Sometime, the theme is not the person but the mind which is common for whom seeking the enlightenment by austerity. 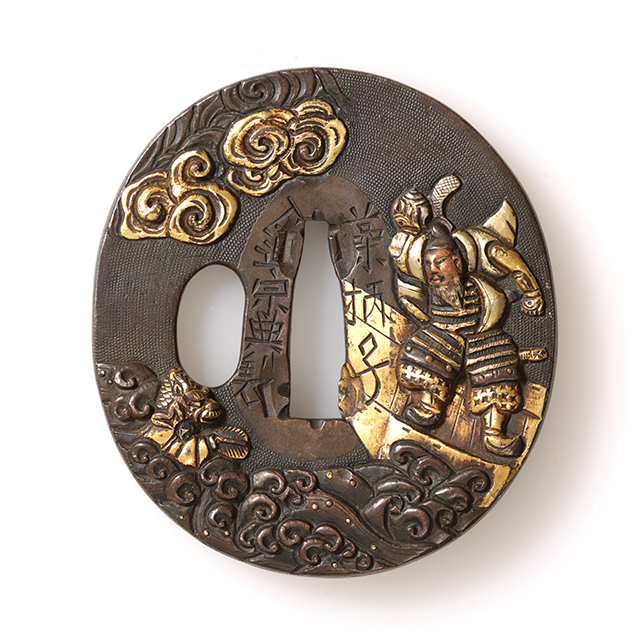 The menuki which has refreshing atmosphere. a feeling of speediness, glossy coats are expressed ingeniously. They are heartwarming. Feature Full of fishes in the nets, they jump around inside ot them, it causes the unevenness of fisherman's poids balance. They try to recover their balance opening the legs wide. This motif is so cute and interesting. When on hand, they are so light contrary to their appearance. Conditions There is a portion, a little de-colored, but in general, it is excellent. 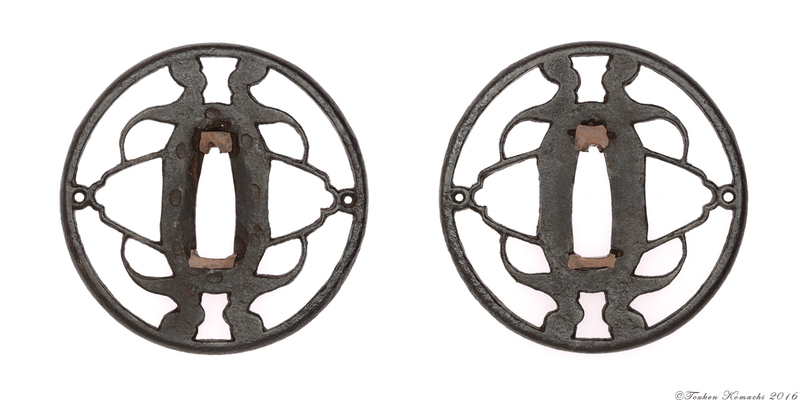 Feature : It is taken from the look of some reels which stored the line in rich and orderly. 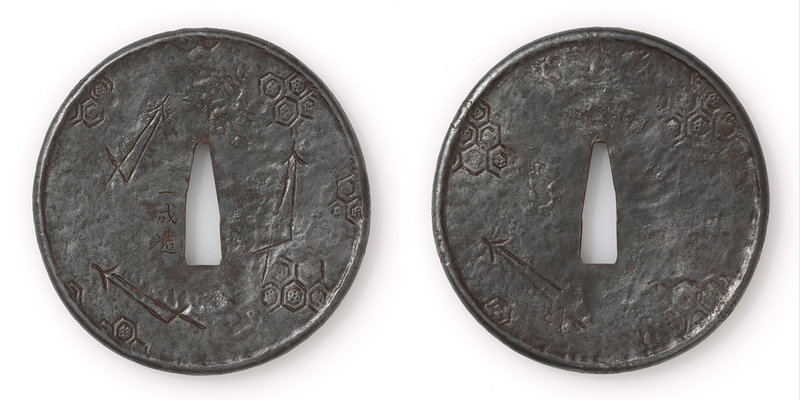 The menukis are attributed to Kyo kanagu-shi. It has attractive shining which comes from extra fine lines of drawn and composed strings. Conditions : There is a part which the gold colour has been changed, but it has natural feeling of material. 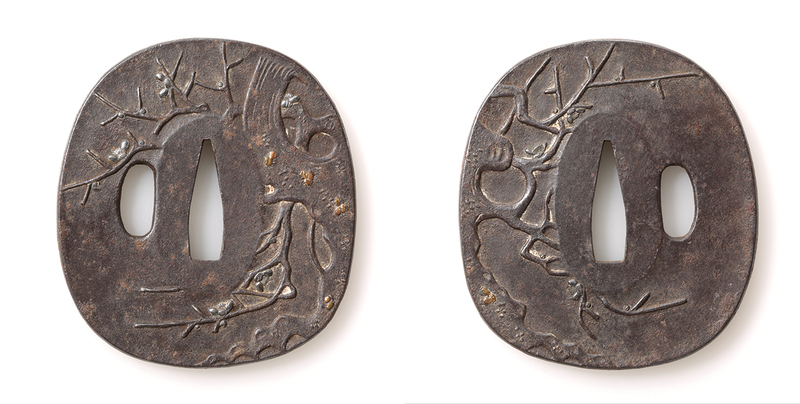 Grape motif with a plenty of feeling of mass, embossing on shakudo, it is gorgeous menuki attaching kin-iroe. 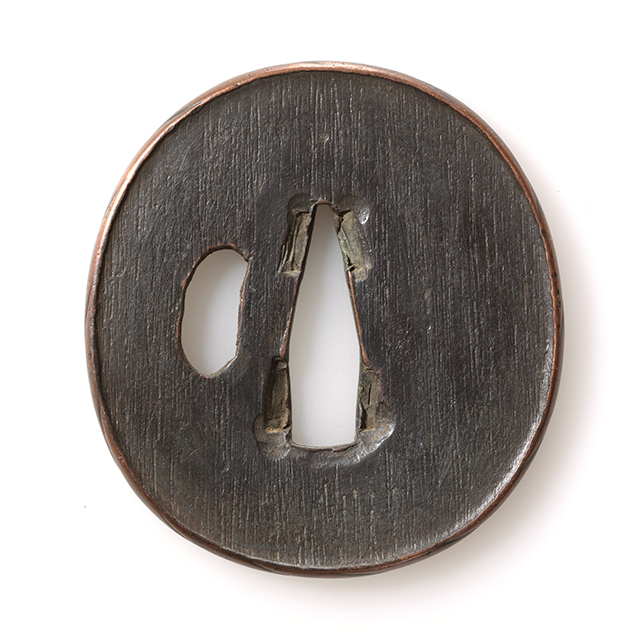 Friction caused by hand in years, naturally peeled off kiniroe part show the jigane, where warm black color exist. It has good color contrast between black and gold. Spreading the branch out wide, and come to fruit so much, the grape symbolize the richness and prosperity, they are cultivated in Japan as well from 12th century. 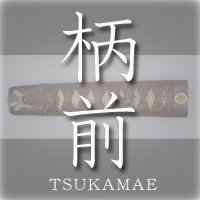 In kanji, it has same sound as Budo, so that it often used as swords attachments. 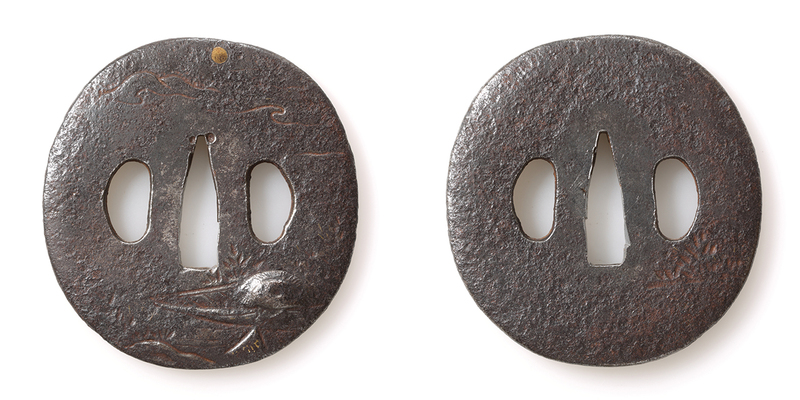 Feature : The menuki's motif represent the measure, used for medicines or tiny items. The balance, plate and weight are set into one, in gourd shape box. Smooth shakudo enhance the beauty of clean shape. 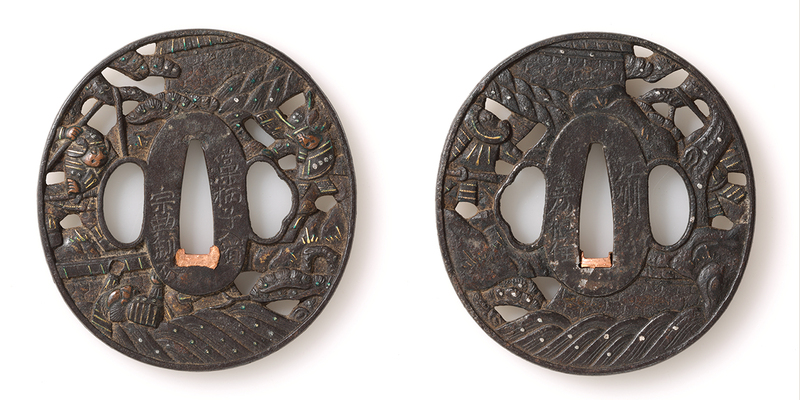 At the holder part, there is a kiniroe, the one axis of cover has shakudo, the other has suaka inlay. 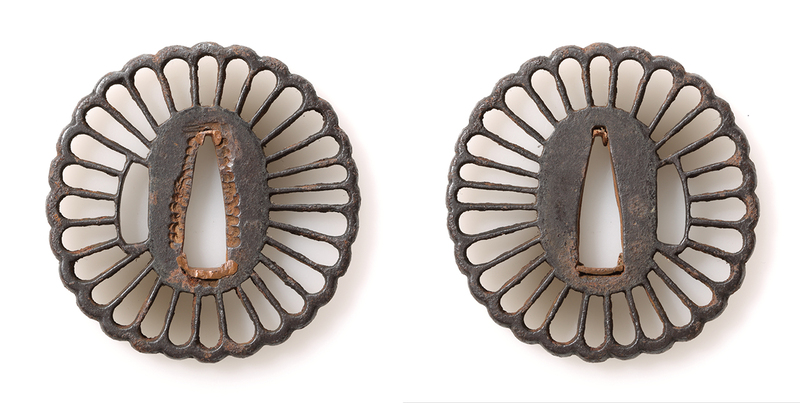 These tiny decoration makes a kind of accent and interesting preIronence. 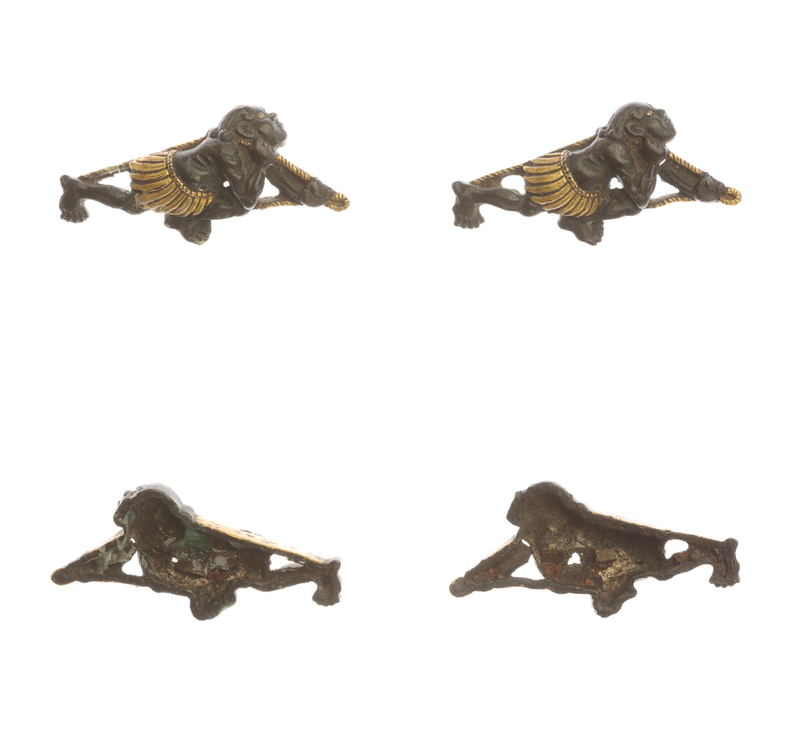 Menuki which covered by the book "The beauty of sword fittings vol.2"
Feature : Muscular fishermans who pull the net. hori express deep shaped faces and round hairs, which resemble to Greece mythology, Poseidon, who controls the sea. Item number [ B030219 ] NEW!! Motif :　design of horse Uma-zu "馬図"
Certificate paper :　n/a　 Material :　Shaku-dô "赤銅" gold kin "金"
Technique :　Shakudô-nanakoji "赤銅魚々子地"　Kin-mon-takabori-suemon "金文高彫据文"
Feature :　ISHIGURO Masatsune was the founder of the Ishiguro school that flourished from the late Edo period to the Meiji period. He studied engraving under KATO Naotsune of Yanagawa Naomasa's school. 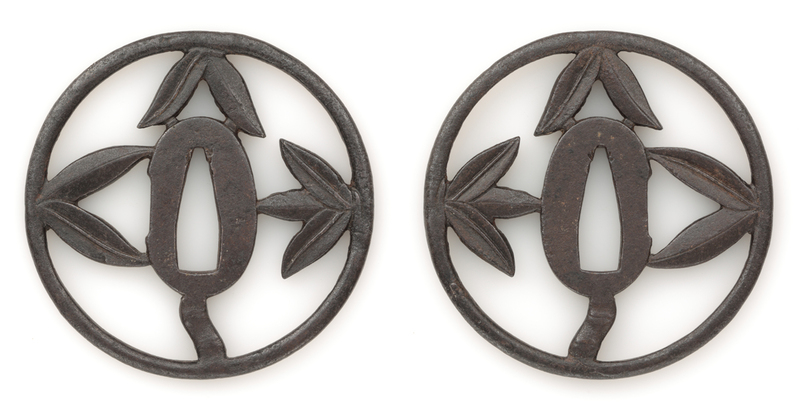 Not only the inheritance of the Yanagawa school style, he set a unique brilliant style such as "flowers and birds" and "birds of prey" as a subject, it has been highly regarded as metalwork representative of the Edo culture in Bunka and Bunsei period. 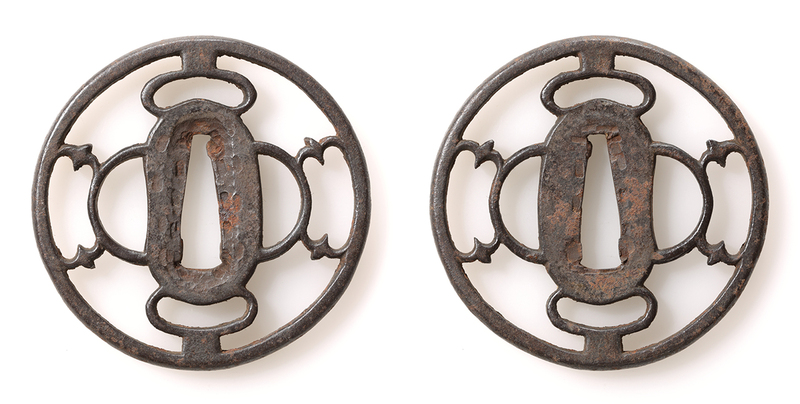 This work draws each target pose of horse which different from movement in fuchi "縁" and kashira"頭" respectively. 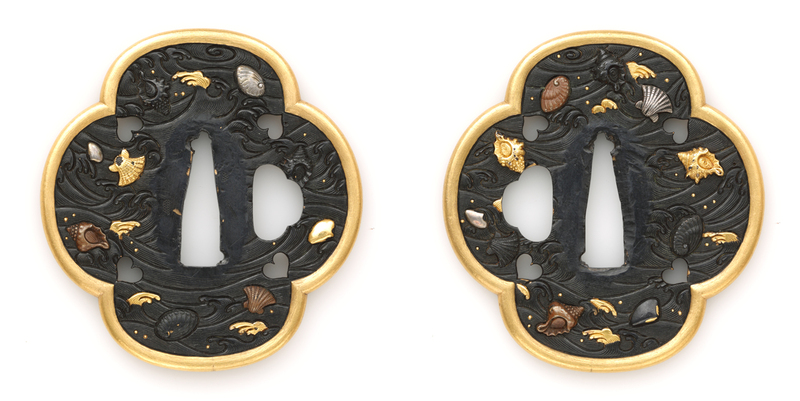 The shine and glow of gold are made into a background of a single black color which represented by precise nanako-ji. And the silhouette is high emphasized in its height. Masatsune closely observed the horse with merciful eyes. It can be seen from the appearance of the entire horse and its details. Technique and sensitivity are harmonized in a high dimension. The moment when he was moved by a living horse is expressed brilliantly, as if he fixed it on the work. It is gentle and powerful. Everyone seems to awaken the fresh sense that is hidden behind the heart. 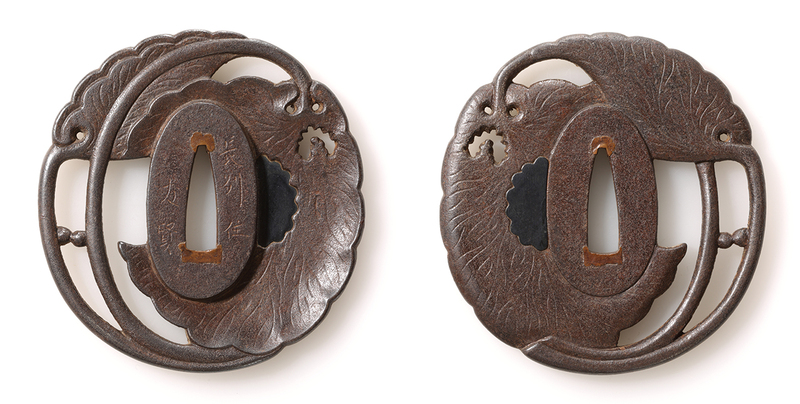 This pair of fuhi-gashira is one of excellent work of ISHIGURO Masatsune. 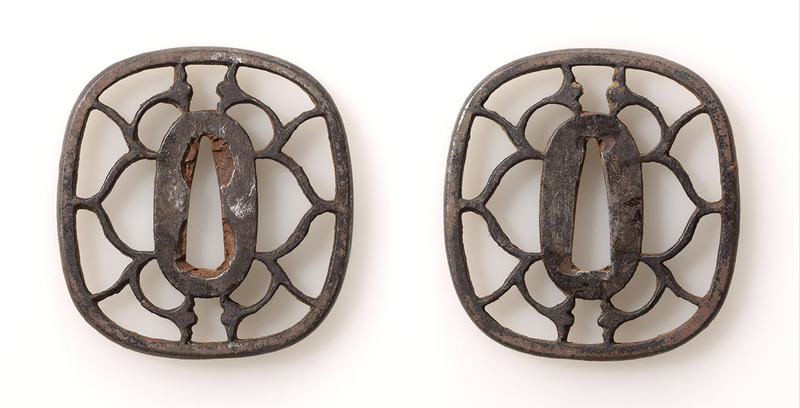 Originally, metal fittings made as pair of fuchi-gashira. However, kashiras have been taken apart, so that they remain as hanare-buchi, fushis only. 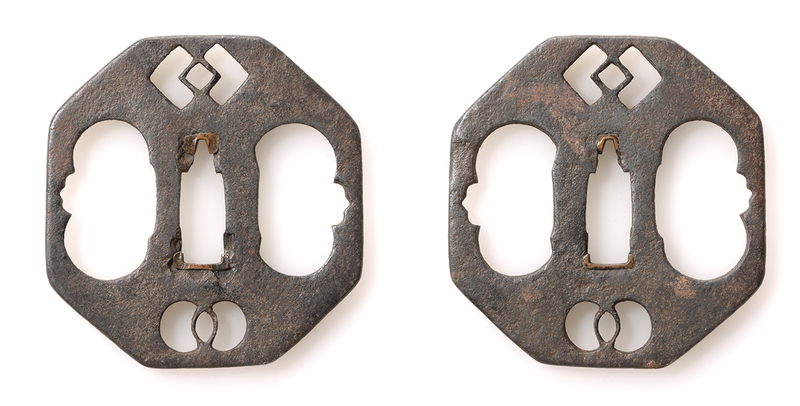 They can be used for koshirae making, using tsuno for kashira. They can be appreciated as they are. KUWAHARA Yôjirô wrote a essay titled On fuchigashira, a pair and apart "縁頭の取り合せ物と離れ物" in Shôwa 14(1939). 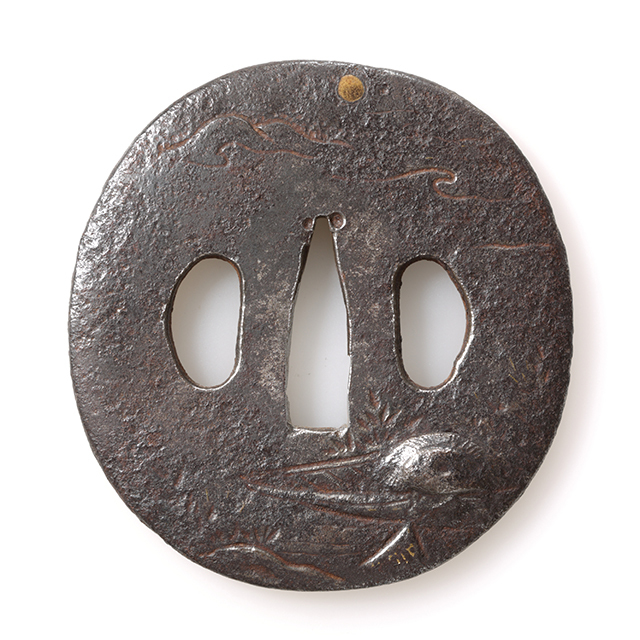 He mentioned that there were cases just making fuchi only, using tsuno for kashira in order to concentrate the expence. 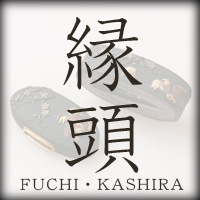 So that fuchi become elaborate and beautiful work. He pointed that some separated items "離れ物" should be valued highly. Item number [ B490319 ] NEW!! 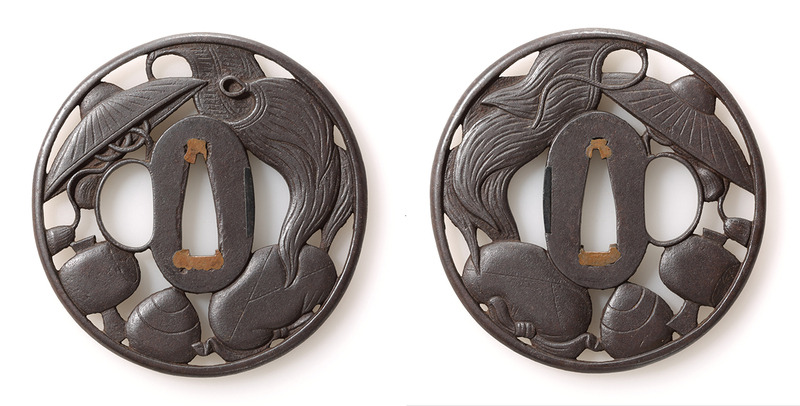 Motif : design of lion and a Japanese peony "獅子牡丹図"
Technique :　Taka-bori "高彫"　gold-iroe "金色絵"　silver inlay "銀象嵌"　nanako-ji "魚々子地"
Feature :　Design of bamboo, flowing water and lion, and on fuchi, flower of Japanese peony are expressed by taka-bori technique. Conditions : Some scaratches and detachment of color. Item number [ B010918 ] NEW!! 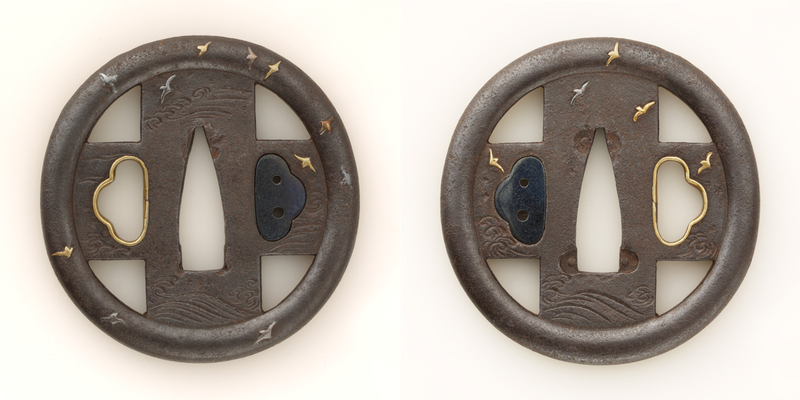 Motif :　Samurai in battle fields Musha kassen-zu "武者合戦図"
Technique :　Taka-bori "高彫"　Iroe "色絵"
Feature :　Kashira, samurai rides on the horse, expressed by shakudô nanako-ji. Fuchi, wave patterns base expressed by shibu-ichi, then looking straight in the face, samurais battling in-between waves. 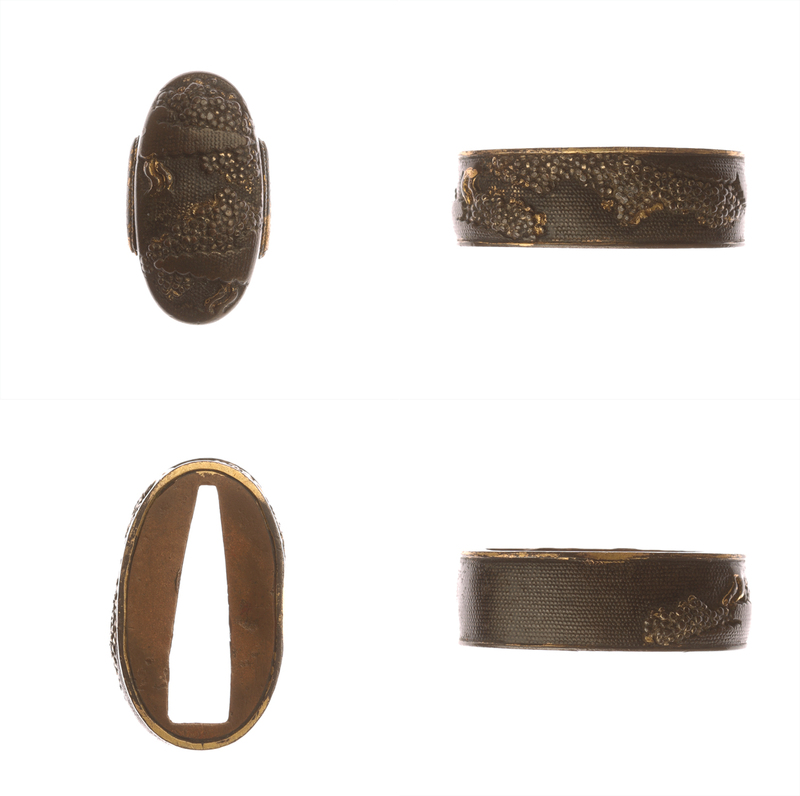 Perhaps, fuchi and kashira were created by different metiers, but there was coordination combining those two by ones taste. 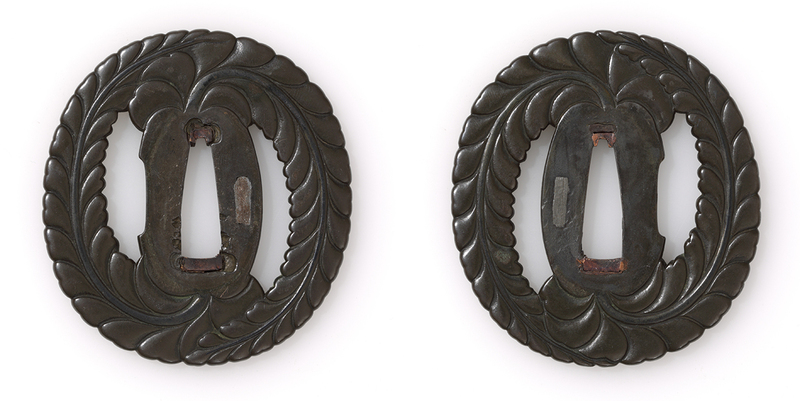 It can be said that a pair of fuchi-gashira, connected by the key words, "dynamic samurais". Such selection by past devotee was one of appreciation point. Item number [ B020918 ] NEW!! Certificate paper :　n/a　 Material :　Shaku-dô "赤銅"
wearing full armors, hanging tachi with shiri-zaya and bow and arrows. He silently turns his mind. Cherry blossoms in full bloom. A very fine horse with saddle tied to tree which can not wait his master standing up and neighing. In the silence, such scenery comes to real with very fine chiseling technique. 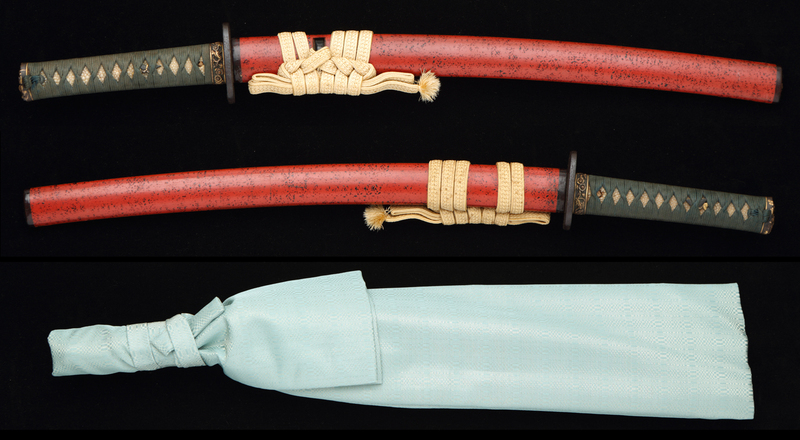 Motif : Horsetail tsukushi "土筆図"
Mei ( signature ) : signed as Jyo-chiku "如竹(花押)"
Certificate paper :　n/a　 Material :　Shaku-dô "赤銅"　Su-aka "素銅"
Technique :　Taka-bori "高彫"　kin-iroe "金色絵"
Feature :　On the background, which is not glared texture made of fine chiseling, pure and innocent lavable horsetail and freshly budded bracken appearance are expressed both emergingly and imposingly . Very carefully made fine works. It was regret that the signature might be given later. Motif : Salmon and mouse shake-nezumi-zu "鮭鼠図"
Price : JPY 155.000- -> JPY125.000-　(the fees of shipping and insurance not included in the price)　PRICE DOWN! Feature : Mouse which concentrate into biting salmon in grotesque face with a little strength gone. The other side, a mouse getting a piece of salmon. They are expressed in realistic way. TAKAHASHI Yuichi draw a picture titled in Salmon "鮭" in realistic western painting technique at the beginning of Meiji period. 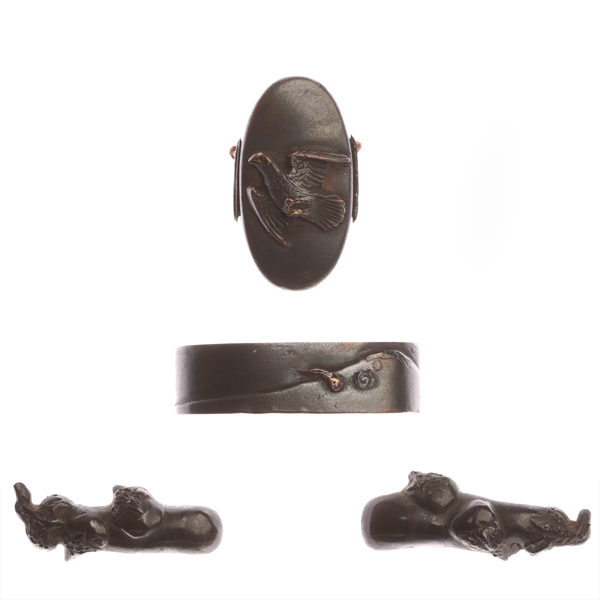 It was considerable that this pair of fuchi and kashira was created a Japanese metal craft man of metal work who acquired realistic vision or inspired by him. The mouse is on the offesive attitude toward salmon, which remind the rescue story of Ô-kuni-nushi-no-mikoto in the Records of Ancient Matters Kojiki "古事記". It may be a too penetrating insight that it feels a conflict between adoption of western foreign culture and nationalism. Motif : Ayu in flowing water ryû-sui kô-gyo-zu "流水香魚図"
Mei ( signature ) : Katsumitsu "勝光"
Price : JPY 188.000- -> JPY 158.000-　(the fees of shipping and insurance not included in the price)　PRICE DOWN! Technique :　Nanako-ji "魚々子地"　Taka-bori "高彫"　Kin-iroe "金色絵"
Feature : Movement that fishes turning their direction near water surface. They overlapped swirling ryû-sui-mon "流水文". It expressed vividly. The contrast between the gold color of smooth surfaced main motif and the deep black colour of very fine nanako is clear, too. 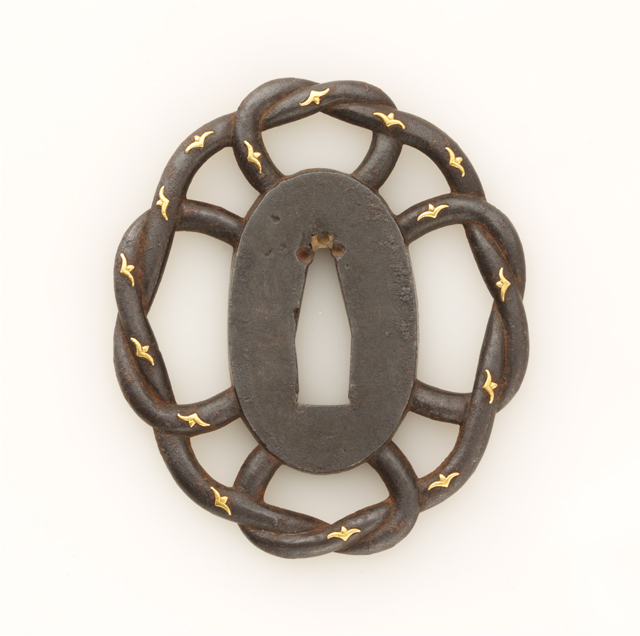 Motif : Cross in circles distributed Maru-ni jyû-monji chirashi-zu "丸に十文字紋散図"
Material : Shibu-ichi "四分一", gold, shakudô "赤銅"
Technique : Ishime-ji "石目地", taka-bori "高彫", sue-mon inlay zôgan iroe "据紋象嵌色絵"
Tsuba Hamidashi-gata "喰出形"　Kaku-mimi ko-niku"角耳小肉"
Feature : A pair of Tsuba and fuchigashira for wakizashi in shorter length (ko-wakizashi). It has been distributed cross in circle pattern created in sue-mon zo-gan techinic. One out of two holes was filled with shakudo. There are saya demount preventing holes. 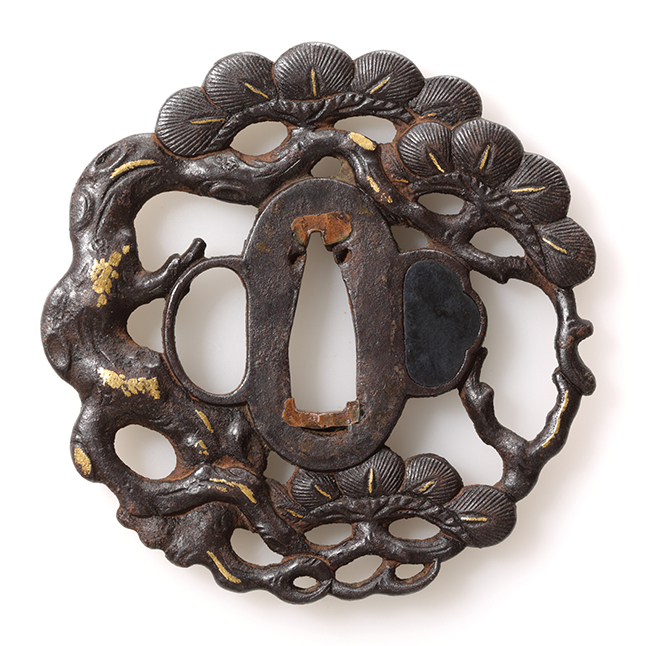 Samurais in Satsuma clan admonished themselves using swords easily tied kurigata and Tsuba down by strings or steel wire. This work has been attributed to Chishiki school. It has come from an ancient place name of Chishiki in Izumi city, where famous as cranes come. First generation Kanezoe was rural samurai of Izumi around Kanen 寛延. From second generation Kanetake, they lived near Kagoshima catsle. Till end of Edo period, they had fifth generation Kaneoki. There were many pupils as well. 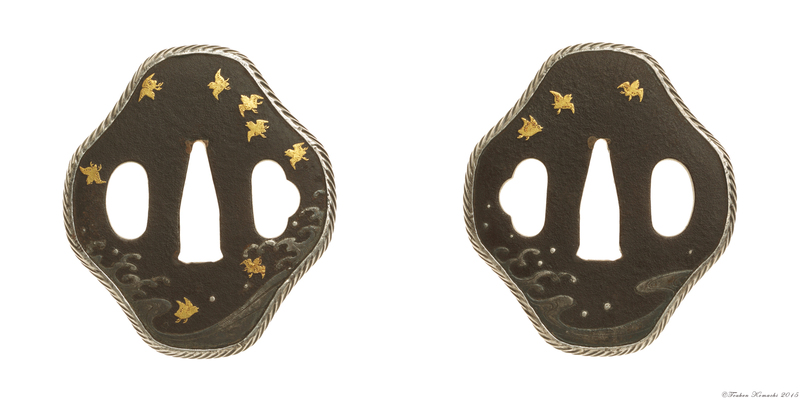 Feature : Fuchi-gashira, which take the motif from strong and brave dragon flying in the clouds. Condition : Scratches, detach of kin-iro-e observed. Feature : Lucky motif, combination of Mt. Fuji, hawk and egg plant. 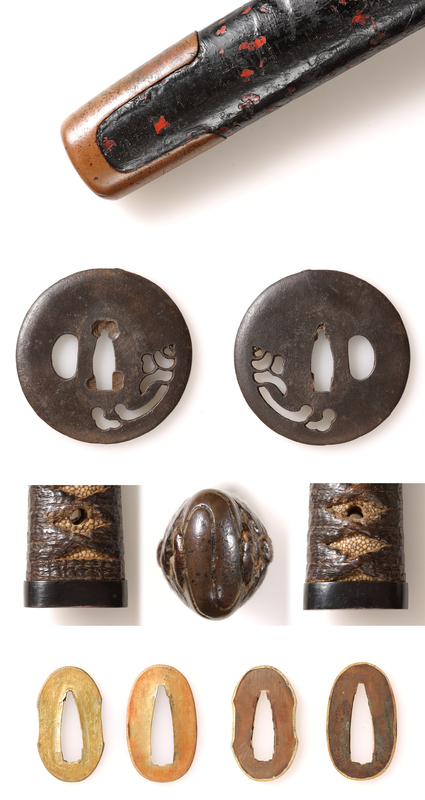 A set of ko-dougu. Kiri box : Not attached. Feature : Fuchigashi which the emotion of seeing full bloom mountain cherry blossom can be felt. 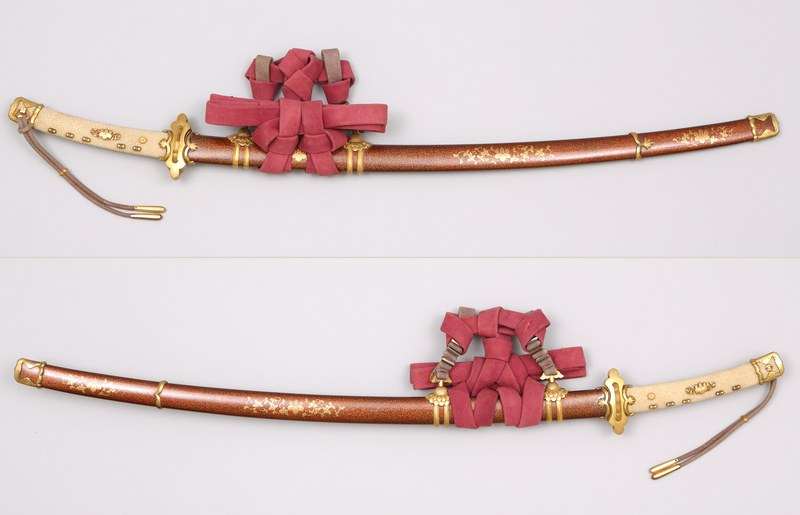 It is recommended to make koshirae of small katana with pink tsuka-iot. Conditions : Some scratches on kiniroe. Item number [ B480319 ] NEW!! Motif : design of wave and dragon "波龍図"
Certificate paper : n/a Material : su-aka-ji "素銅地"
Feature :　From cruelly rolling waves, dragon comes to appear. Design of dynamic dragon is so bold. Conditions : There are some sense of useness, such as scratches. Patina is obvious. There is shallow crack at the edge of insertion. Item number [ B470319 ] NEW!! Motif : desing of a man on the horse and a man on the dragon "馬上龍上人物図"
Feature :　When a horseman crosses the bridge, looking at the river, a person on the back of a dragon comes up with a huge water splash. A strange design. Conditions : There are some sense of useness, such as scratches. Item number : [ B010319 ] NEW!! 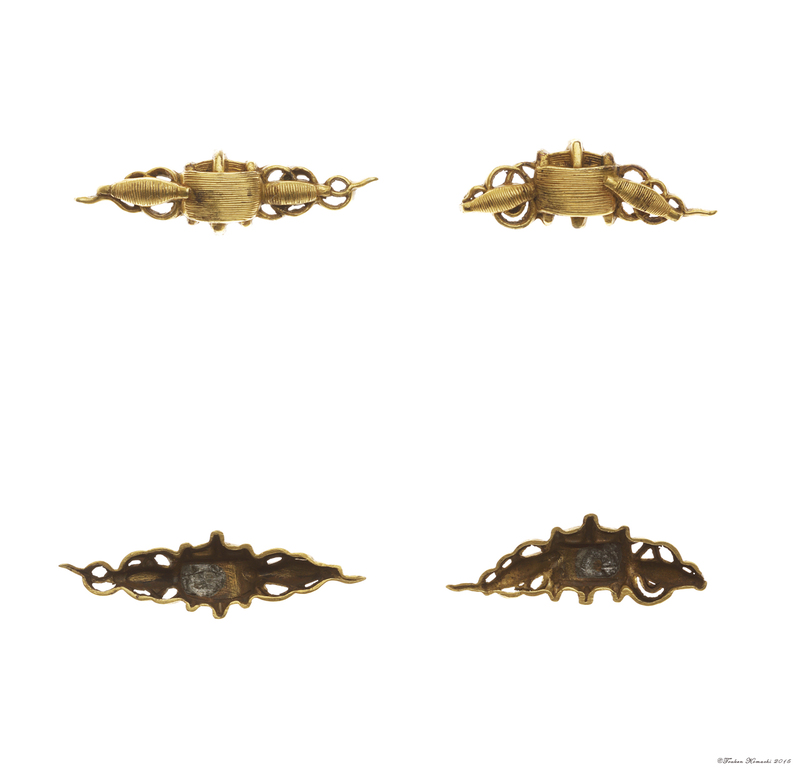 Motif : design of matchlock "火縄銃図"
Certificate paper : n/a Material : suaka-ji "素銅地"
Technique : taka-bori "高彫"　gold kin-iroe "金色絵"　nanako-ji "魚々子地"
Feature : Shakudô made cap attached kozuka. 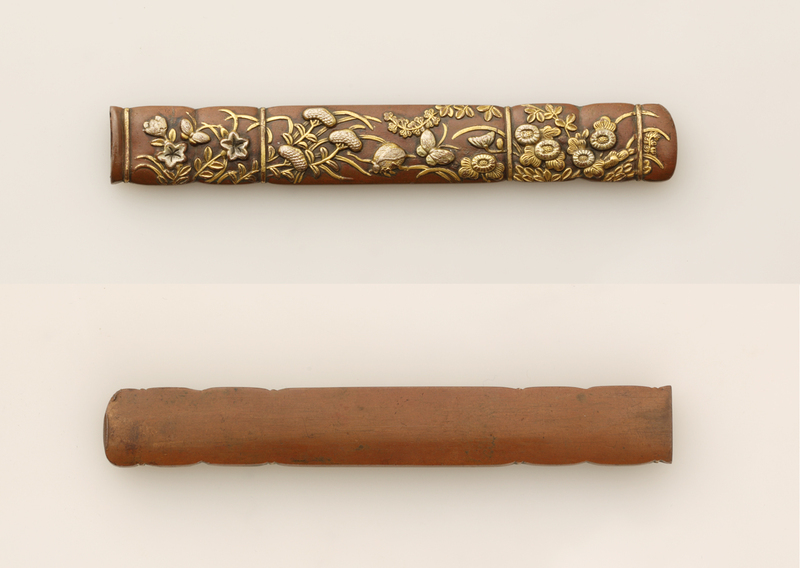 Design of matchlock and gun powder holder are highly expressed in the centre. As bacground, gourd and nets are made one step lower. Part by part, kin-iroe are ditributed. Spectaculor scenary shows spirit and attitude facing a battle. Item number : [ B020319 ] NEW!! Motif : design of enumeration of names of shells "貝尽図"
Feature : One by one, each shell has different shape. In total seven, they are arranged rhythmical style. Highly expressed, each shell has its presence. Item number [ B031218 ] NEW!! Motif : Design of puppies ko-inu-zu "仔犬図"
Technique :　Taka-bori "高彫"　gold-silver iroe "金銀色絵" nana-ko-ji "魚々子地"
Feature : Violets blooming spring field. Chubby puppies are playing. Observing in more detail, on projecting object, stump or rock, moving the feet front and rear, holding the upper half of body. Using both front feet, doing something in silent manner. Perhaps, getting the good taste snack, he tried to hide it instinctively. 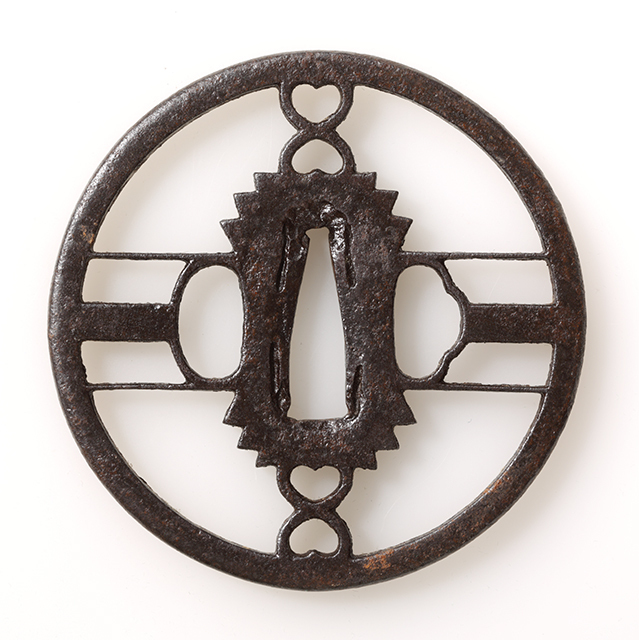 This design may have some influence from Tokugawa shôgunate Tsunayoshi's life preserve policy. To support weaker spcial positions positively, and it may show samuraî society's some disturbance against civilian cotrol politics. Condition :　Excellent except there is tiny detachment of gold iroe, outline of face side nanakoji. Item number [ B011018 ] NEW!! Motif : Horse tying rope kizuna-gawa "紲革図"
Signature : Hashimoto Mondo-no-suke Nobu-masu "橋本主水佑信益作"
Certificate paper : NBTHK Hozon tôsôgu paper (issued on 7th Dec. Heisei 29(2017)) Material : Suaka-ji "素銅地"
Feature : Kozuka, which has high taka-bori engraving, drawing kizuna-gawa "紲革", fine nanako-ji as back ground. 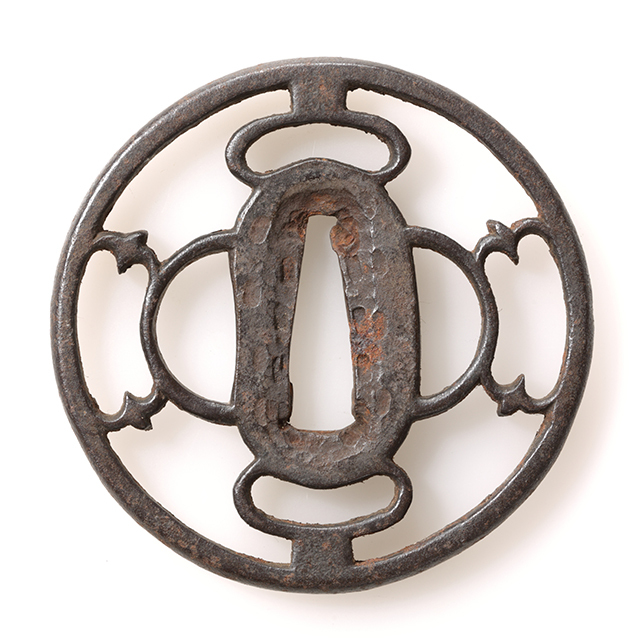 Kizuna-gawa "紲革" is a kind of horse riding tool. Tying horse to pole. Suaka-ji has been changed moderately by aged deterioration. It shows warm atmosphere. Item number [ B021018 ] NEW!! Motif : Flying chinese phoneix with three tails San-bi hô-ô hishô-zu "三尾鳳凰飛翔図"
Feature : On deep black colored shakudô-ji, well organized fine nanako are spreading. 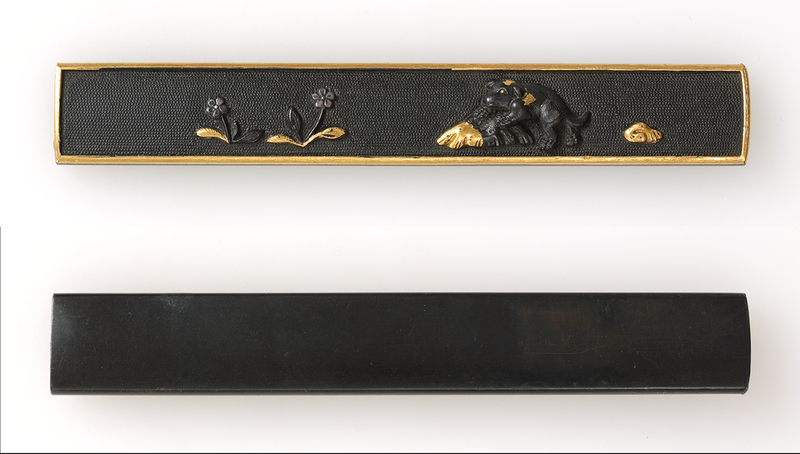 A kozuka which flying three chinese phoneix images are drawn elegantly and admirably. Motif : Autumn leaves and insects "秋草虫図"
Technique :　Taka-bori "高彫"　gold iroe "金色絵"　ke-bori "毛彫"
Feature : On suaka-ji, by taka-bori kin-iroe technique, autumn grasses such as chrysanthemum, Japanese bush clover, bellflower, cockscom, awn, insects such as cricket are composed bustling manner. Motif : Flat-bottomed boats Takase-bune-zu "高瀬舟図"
Technique :　Taka-bori "高彫"　Kin-iroe "金色絵"　Ke-bori "毛彫"
Feature : Two boats and ripples expressed very simply. When one find the resemblance between the shape of waves and boats, the marvelous sensesiblity coming as if the boats start shaking and departing. Condition :　Left half of omote, the wave patterns become pale. It may due from very careful actual using. Feature : The shape is integrated with ha(cutting edge) and tsuka, making moro-ha(double edge). 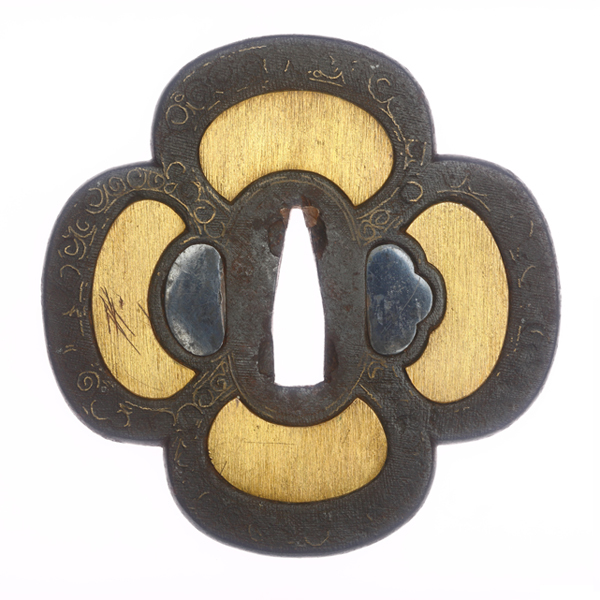 It is gorgeous gold attached motif of kiri(paulownia). Conditions : There is tiny rust at the edge but rest is excellent. Item number : [ B030319 ] NEW!! 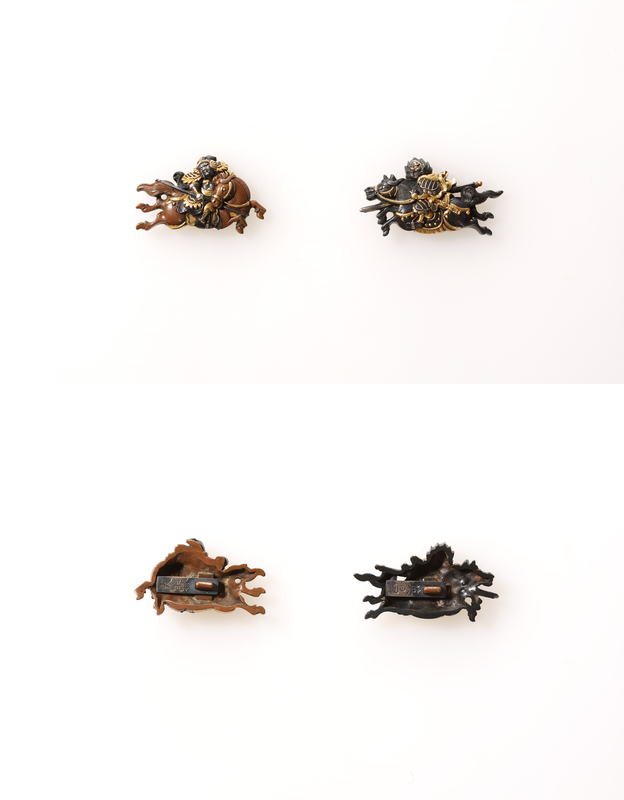 Motif : design of bees "蜂群図"
Technique : migaki-ji "磨地"　nanako-ji "魚々子地"　taka-bori "高彫"
Feature : A group of bees, their heads, chests and bodies are in line with center. Those parts arranged in convex shape. Controlled bees show something mysterious and coercive power. Kô-gai with original idea. Conditions : A few scratches. Excellent in general. Motif A toad hermit Gama sen-nin "蝦蟇仙人図"
Technique　Migaki-ji, "磨地"　Sukidashi-kebori "鋤出毛彫", inlay zôgan-iroe "象嵌色絵"
Feature　A kô-gai, a toad hermit Gama sen-nin who is accompanied with a chinese goblin, blue-frog-god, are expressed by inlay-iroe. Using seductive suaka base space, portrayal expression of motif is specific. Conditions　There is a few scratches but excellent in general. 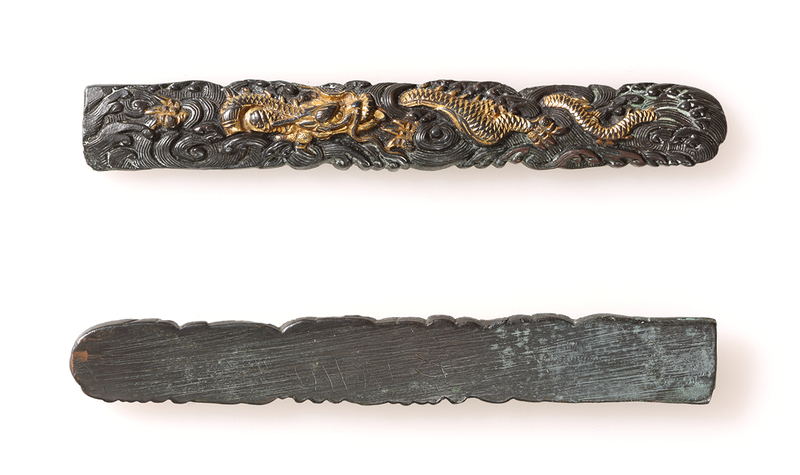 Motif Kozuka and kô-gai, a pair. Futa-tokoro-mono. 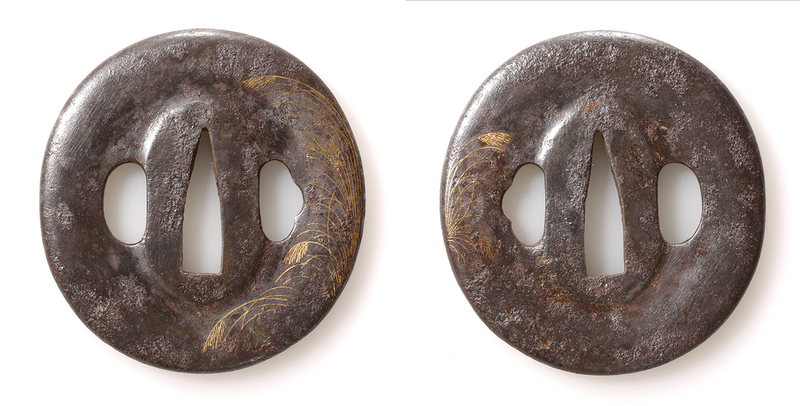 Ume-uguisu-zu, "梅鶯図"
Technique　Gold and silver colored, kin-gine-iroe "金色絵"
Feature　A bush warbler uguisu, which perch on full blooming plum tree, monopolize the eyes of peoples. 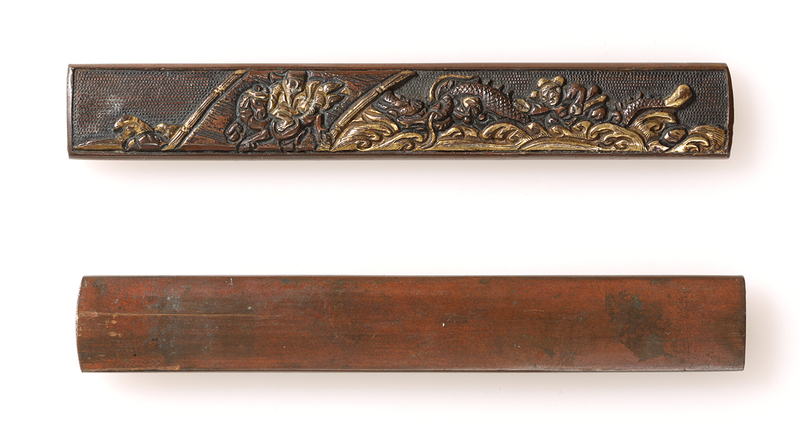 Such early spring scenery are expressed on a pair of kozuka and kô-gai. Conditions　There are some detachments of silver iroe and scratches. 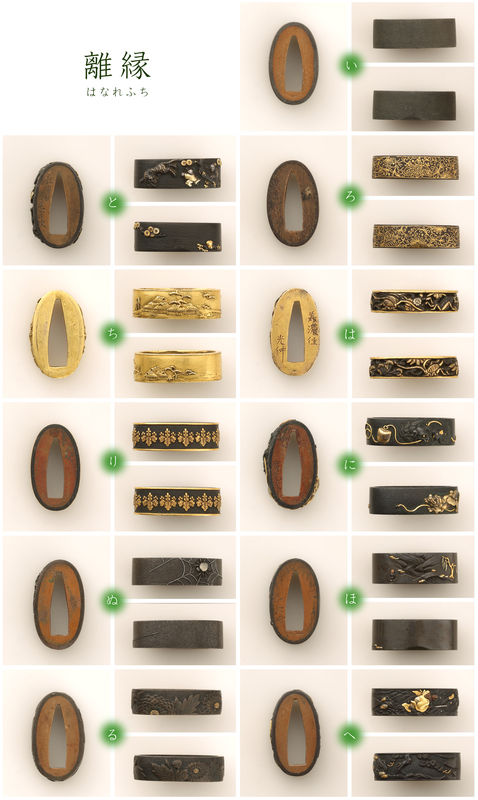 Material　Copper, shaku-do, "赤銅地"　gold colored, kin-iroe "金色絵"
Technique　Nanako-ji, "魚々子地"　Suemon inlay, "据文象嵌"
Feature　A kôgai, on very fine shakudo nanako-ji, which has dynamic draong motif expressed by suemon zogan inlay. Conditions　Plating on base metal could have later enhancement. It maintains excellent conditions. Item number [ B021218 ] NEW!! 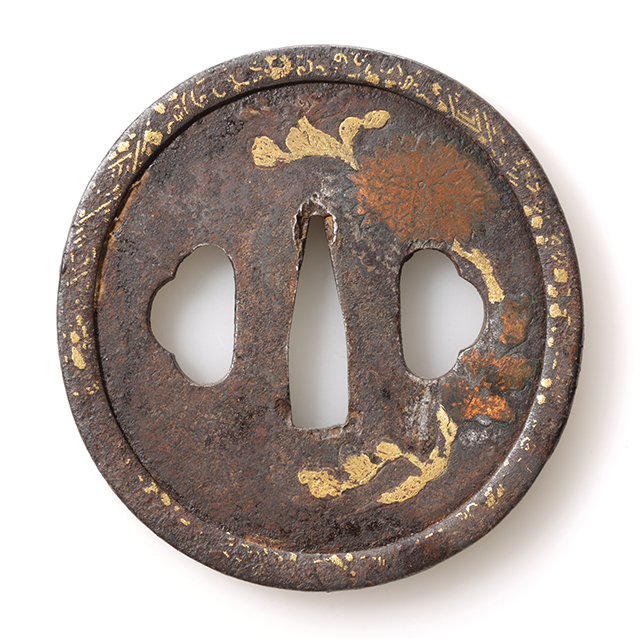 Title: A tsukamae tsukamae "柄前"
Period : Reportedly Muromachi period. Feature : This handle is made of a long, flat long threaded thread of natural, durable vegetable material. As a technique, the edge of the thread is overlapped slightly one end of the previous winding, and it is tightly tightened steadily without any gaps. As a way to suppress the ends of this thread, it has been forming part of a switch to a thick threaded thread of linen. As a result, it has been raising the strength by applying lacquer to the whole. 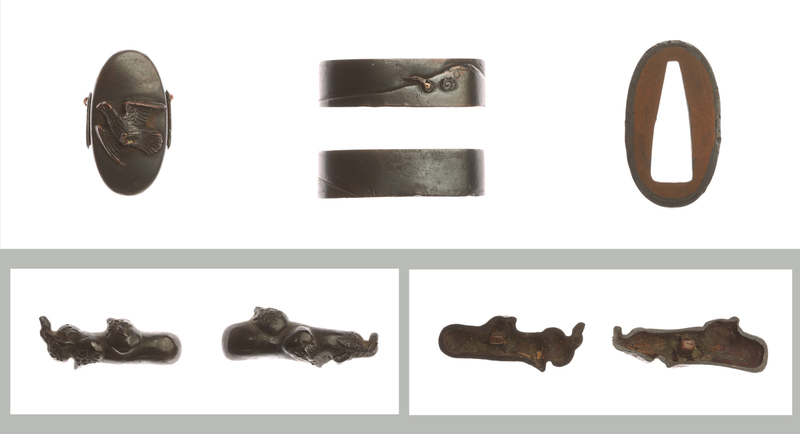 Kabutogane iron shows the old-fashioned slightly thinner angulated form. 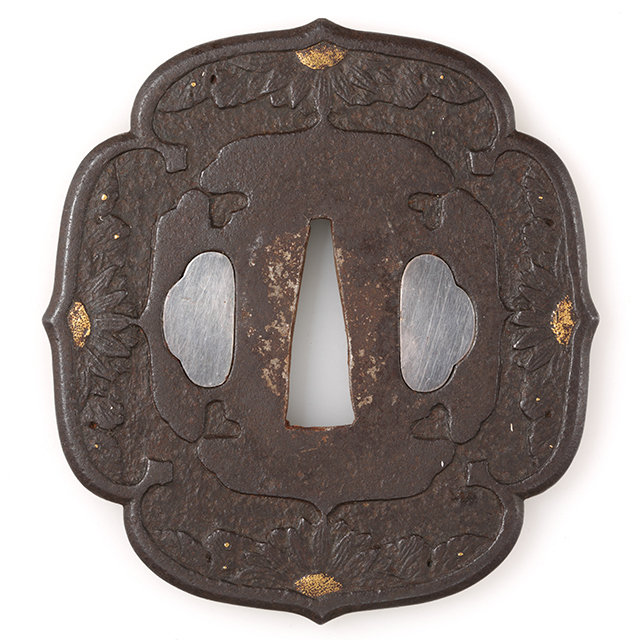 The edges of the brass ground are distinctive shapes that carve sideways two rustic lines. The severe dragon's large consciousness also has an impact. Conditions : Fuchi lacks the bottom plate. There is no mekugi. Signature / artisan : unknown. Price : JPY 65,000- -> JPY 50,000- (shipping and insurance fee not included ) PRICE DOWN! Feature : Tuska for wakizashi. 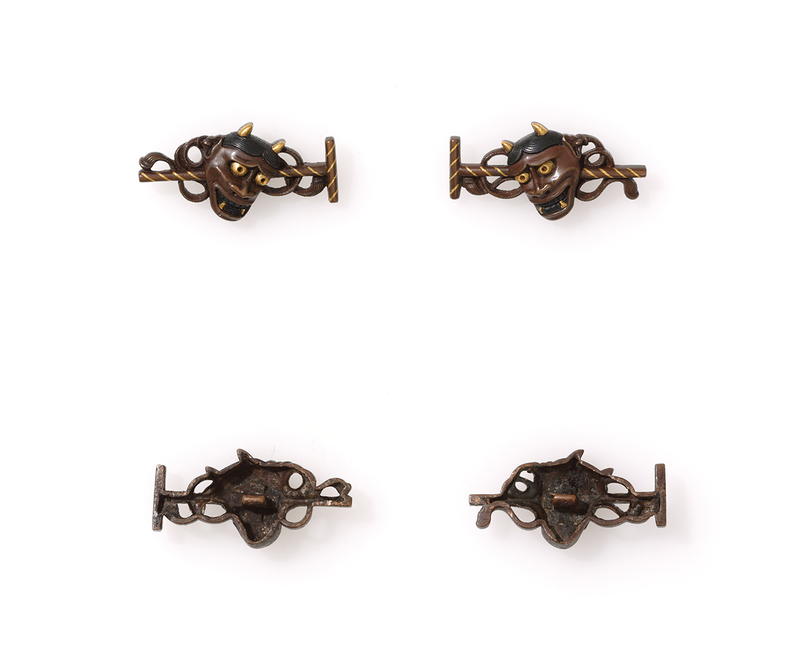 Minohori taste autumn flower motif metal fittings ensembled. Conditions : Tsuka ito has a little fray. Total conditions are very fine. Item number [ B390319 ] NEW!! 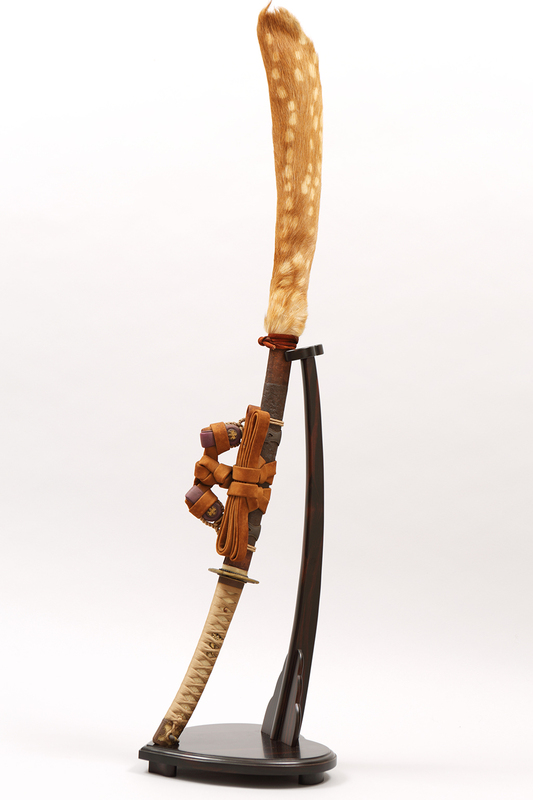 Description Tachigoshirae for Shôwa grand Imperial ceremony "昭和御大典太刀拵"
No real blade inside. 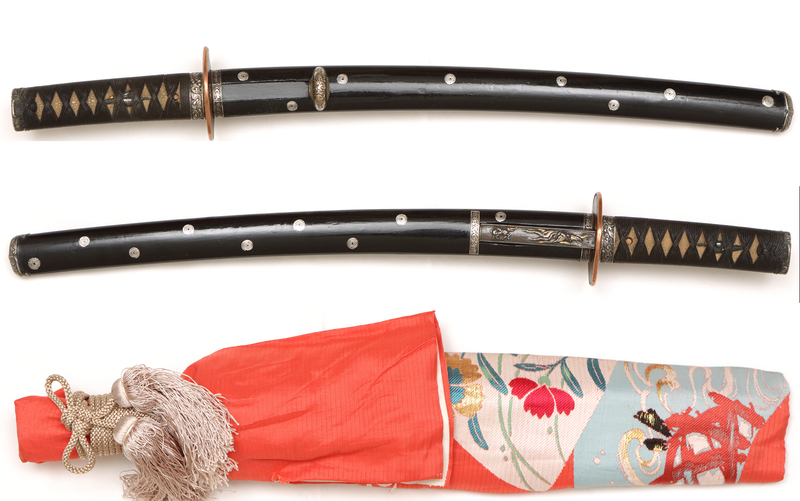 Instead, wooden swords, called "tsunagi" are stored. In Shôwa 3(1928), at Emperor Hirohito's Shôwa Imperial grand courtesy ceremony Shôwa Ten-nô go-tai-ten-no gi "昭和天皇御大典の儀(即位の礼)", servers, such as Imperial families, Prime Minister TANAKA Gi-ichi, Minister of the Interior MAKINO Nobuaki, grand ceremony chief master KONOE Fumimaro, it was said that one of them put on this tachi-goshirae. 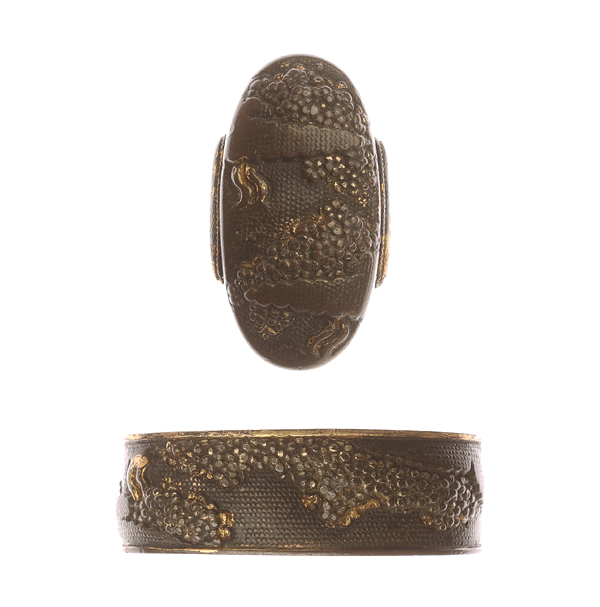 Magnificent gold kin-nashi-ji-nuri-zaya has been decorated by paulownia-arabesuque design pattern gold lacquer. 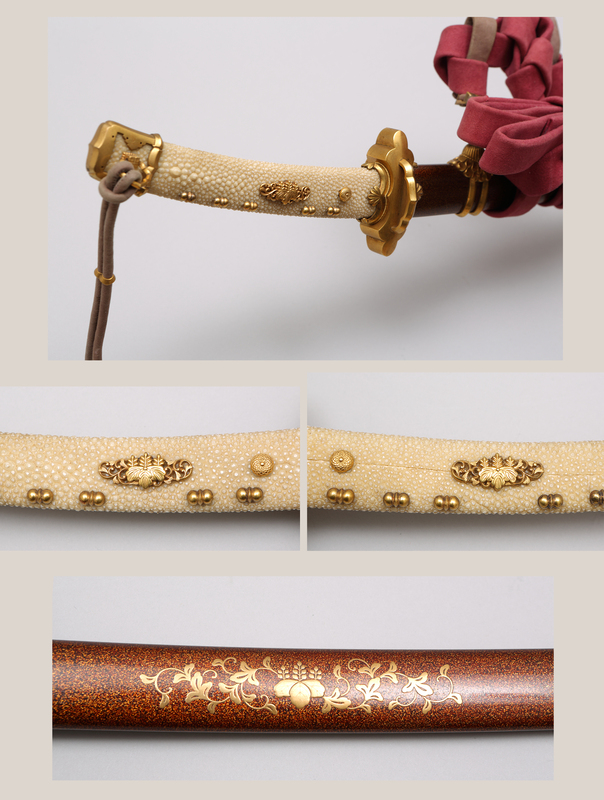 Fine shape surface grains skins shiro-same "白鮫" are covering the hilt tsuka, which have gold-copper metallic paulownia arabesque design menuki. 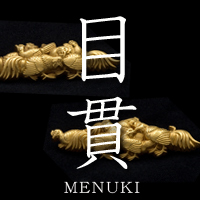 Mekugi has chrysanthemum crest. 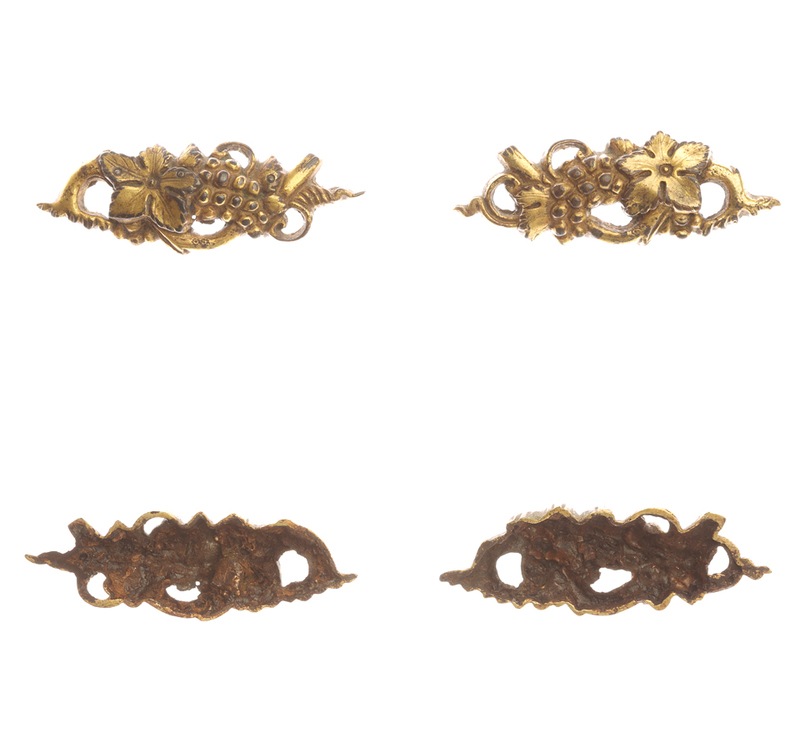 Clasp part and seki-gana part have gold-copper made palmette decoration. It adds graceful taste. Item number [ B420319 ] NEW!! 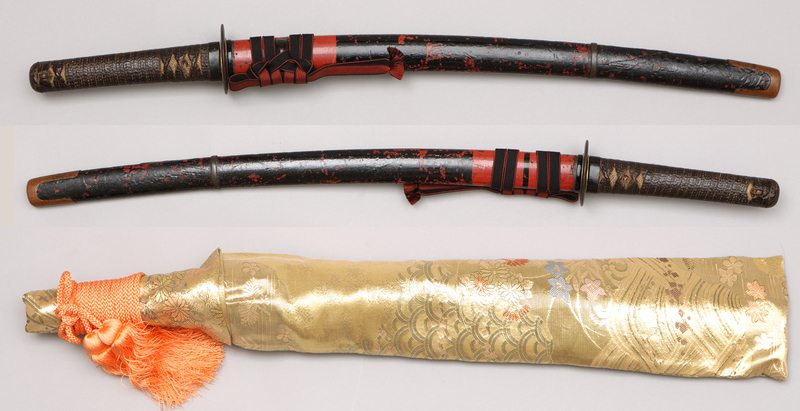 Description : Vermilion and black lacquered wakizashi koshirae "朱黒塗鞘脇差拵"
No real blade inside. Instead, wooden sword, called "tsunagi", is stored. 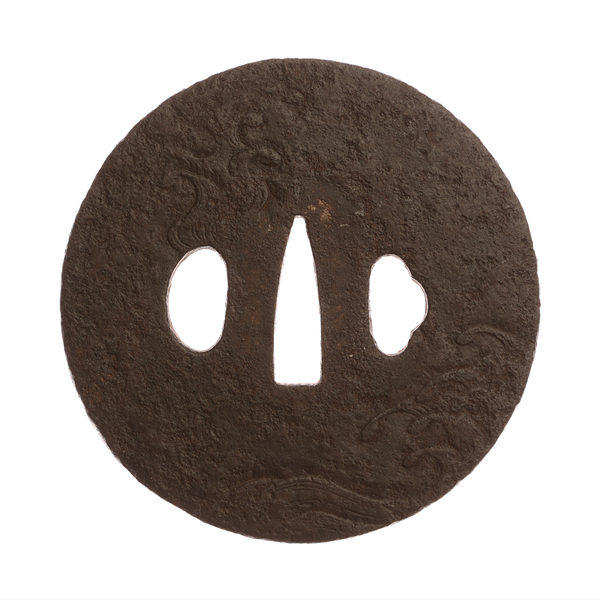 Iron small size openwork tsuba "鉄地小透鐔"
Study wakizashi koshirae, the casual finish of vermillion and black exudes a good taste. Item number [ B410319 ] NEW!! 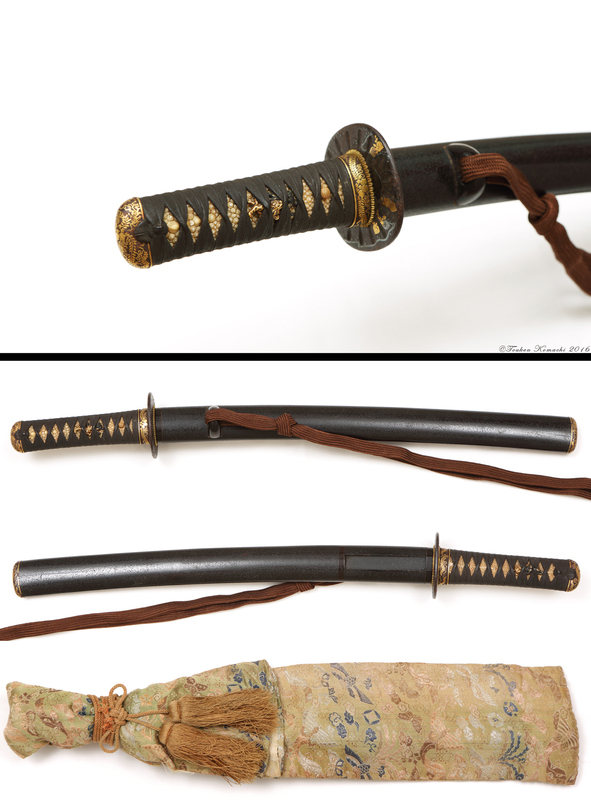 Description : kuro isime-nuri-zaya wakizashi koshirae "黒石目塗鞘脇差拵"
No real blade inside. Instead, wooden sword, called "tsunagi", is stored. There is no sense of unity. But looking at each one, it is a wakizashi-koshirae that fun metal fittings are collected. Conditions : There are rubbing and small scratches on the sheath. Tsunagi-tsugi technique is used for siro-same of tsuka. 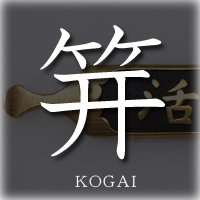 No kô-gai "笄" attached. Item number [ B400319 ] NEW!! 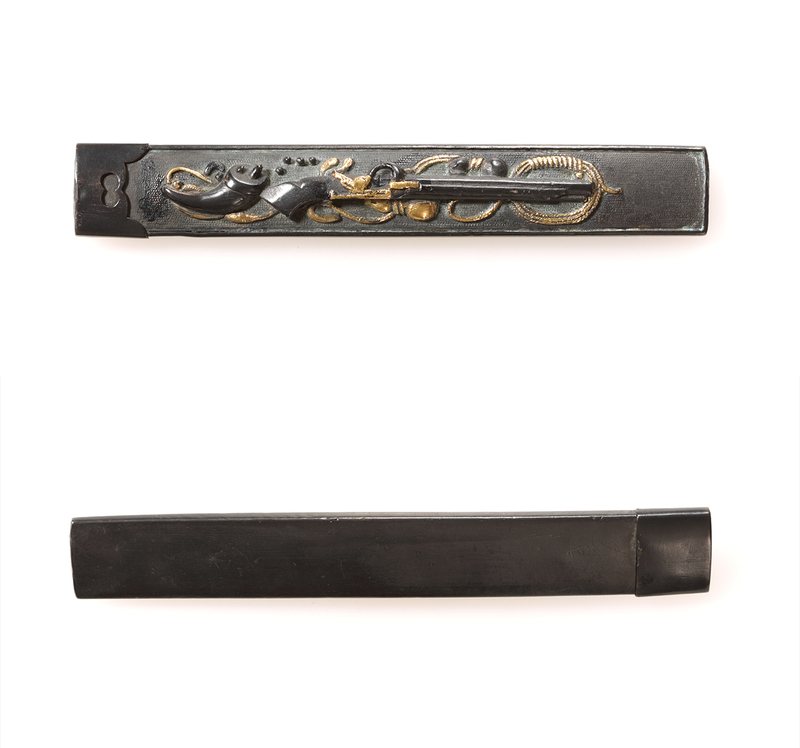 Description :　Black lacquer, worm-eaten pattern painted sheath, wakizashi koshirae "黒漆虫喰塗鞘脇差拵"
Fuchi "縁": azumaya landscape view "四阿風景図". Kashira "頭" : countryside house landscape "田舎屋風景図". 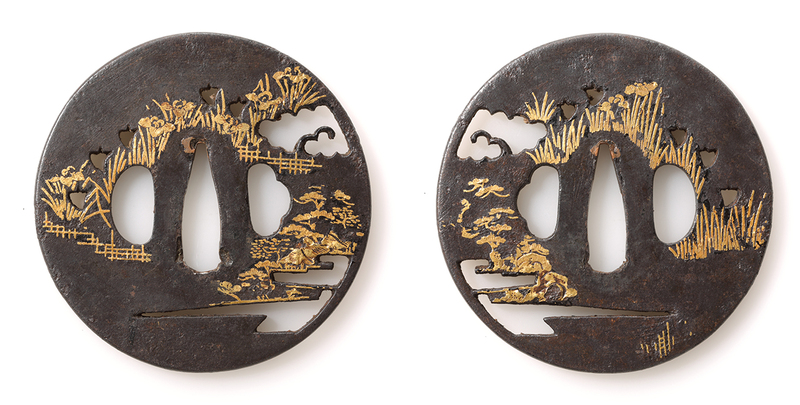 Menuki "目貫" : Kawafune landscape view "河舟風景図". 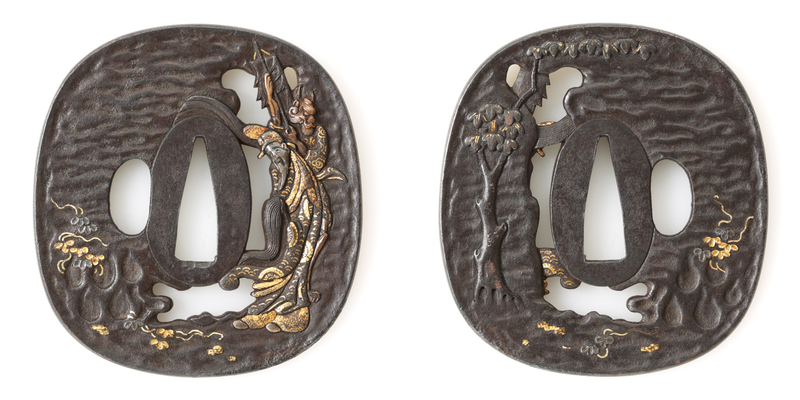 Tsuba"鐔" : gem chasing two dragons openwork "珠追双龍透" Kozuka"小柄" : the figure of the tower "楼閣人物図". 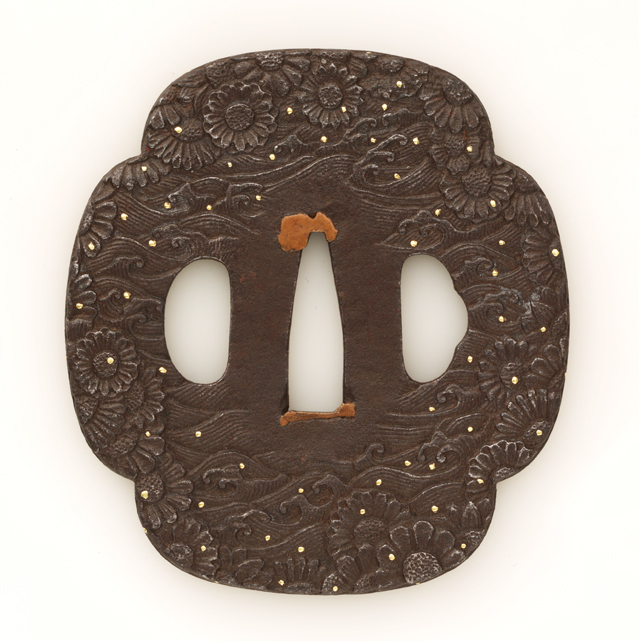 Nanban-tsuba "南蛮鐔" as the center item , it has been packaged in the sword fittings in which the landscape as the subject. 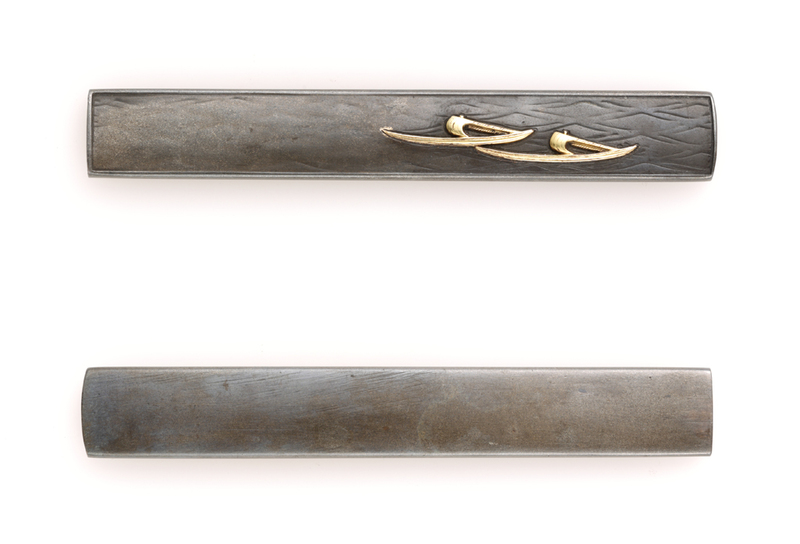 A wakizashi koshirae. Conditions : There are rubbing and small scratches on the sheath. 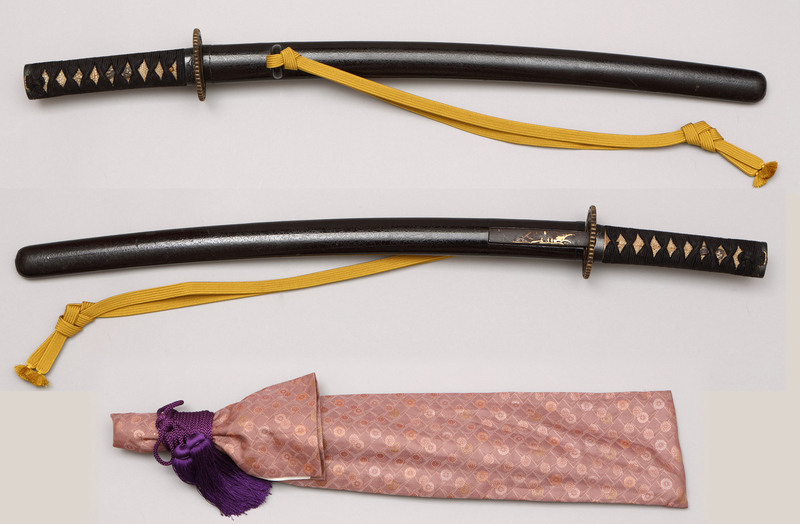 Description Dai-shô koshirae "大小拵" Kairagi togidashi-zaya dai-shô uchigatana koshirae "梅花皮研出鞘大小打刀拵"
Mei ( signature )　tsuba : "長州萩友章造之"
No real blade inside. 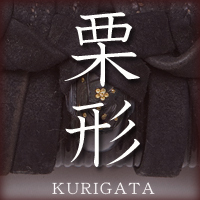 Instead, wooden swords, called "tsunagi" are stored. 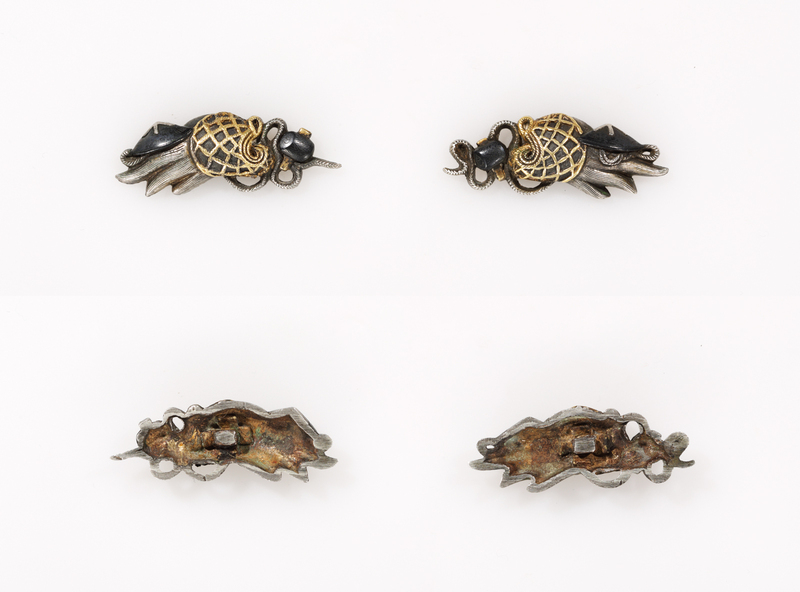 shakudô nanako-ji "赤銅魚子地"　takabori-iroe "高彫色絵"
Menuki : (L)design of three tigers "三匹虎図"　(S)design of a celestial nymph "天女図"
shakudô-ji "赤銅地", katachi-bori "容彫", iroe "色絵"
Kozuka : (S)design of Chô-ryô "張良図"　no signature shakudô-migakiji "赤銅磨地"　taka-bori "高彫"　iroe "色絵"
dai-shô tsuba : design of lion dropping child in the valley "児落獅子図"　signature : "長州萩友章造之", tate-maru-gata "
竪丸形", tetsu-migaki-ji "鉄磨地", suki-dashi taka-bori "鋤出高彫", (L) no hole "無櫃孔" (S) one hole "片櫃孔"
Tomoaki was a sword guard tsuba smith of Hagi, Chôshû clan. He was man around second half of Edo period. 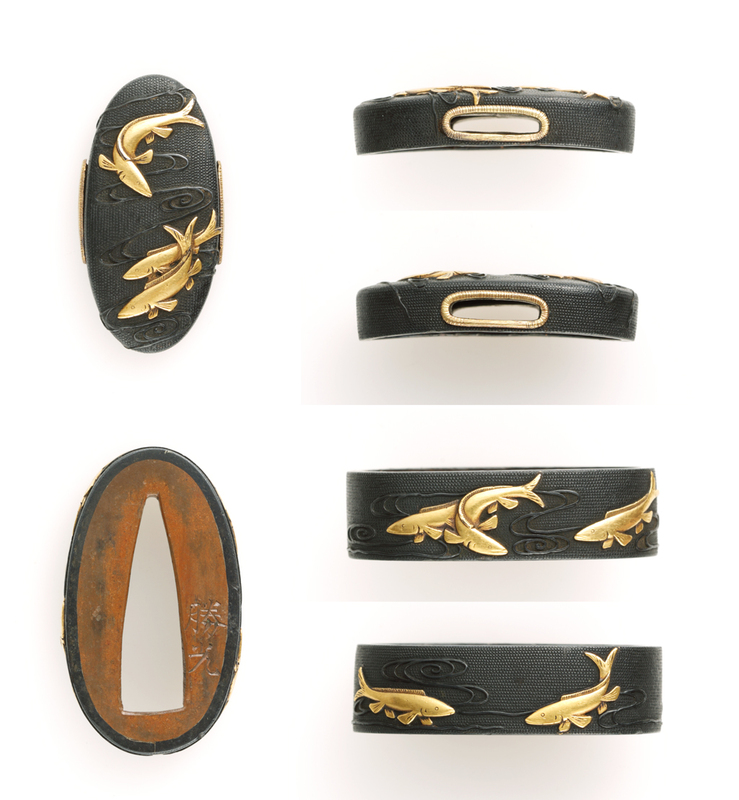 Kairagi togidashi-zaya "梅花皮研出鞘" is lapping shark skin around saya, putting lacquer, and sharpened. The pattern of which similar to blossom of plum tree, called hana-kairagi "花鰄", are so magnific. Item number [ B101218 ] NEW!! 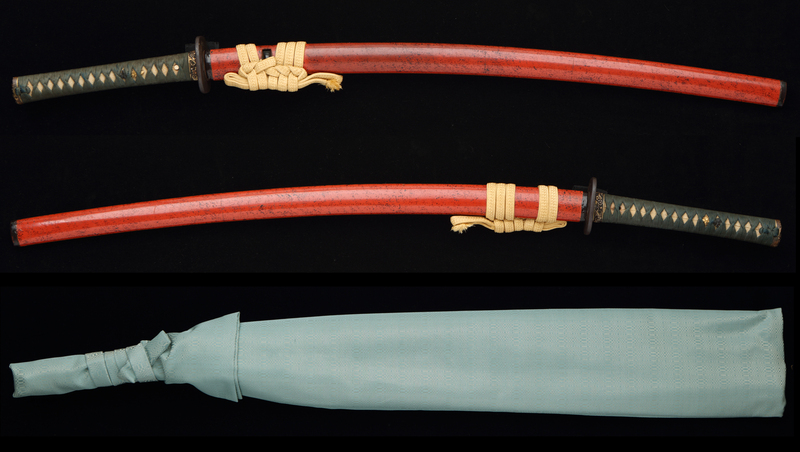 Feature : Ô-katana (for sword) is a blackish red lacquer coat, and ko-gatana (for wakizashi) is a black painted silver swirl literature. The taste of the coated sheath varies. 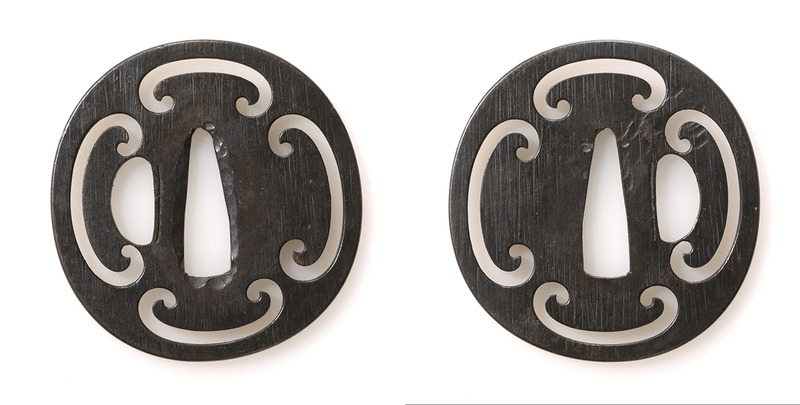 Design of awn iron tetsu-ji tsuba and design of clouds pattern silver metal fitting ensemble share a series of fittings. 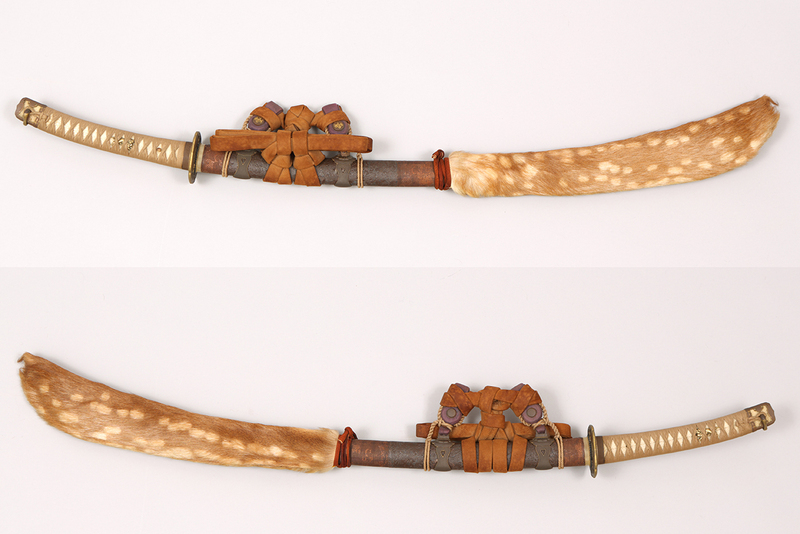 Condition Tiny dent and scratches on shô-tô(waizashi)sheath. Other part are excellent. No kôgai inside in kô-gai-hitsu hole of shôtô sheath. Item number [ B030918 ] NEW!! No real blade inside. Instead, wooden sword, called "tsunagi" is stored. 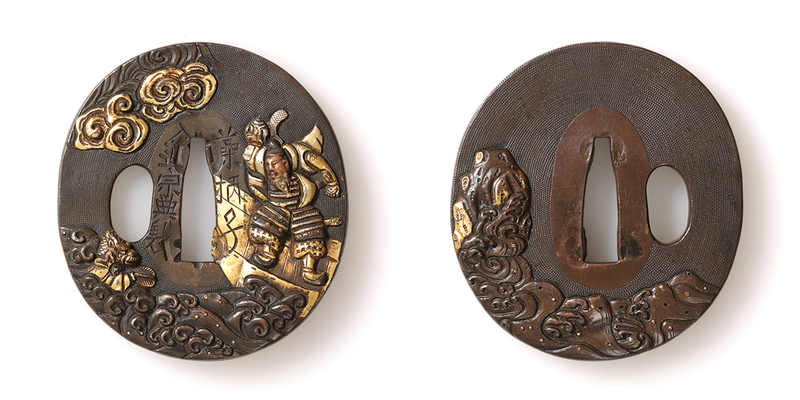 Menuki "目貫" : Lion shi-shi "獅子", Fuchi-gashira, seme-gane and kojiri "縁頭"・"責金"・"鐺" : Suaka Nanako-ji "素銅魚々子地"
On Obi-tori kanagu metal fittings, suaka nanako-ji base, inome-sukashi and pawlownias are given as kawa-mon leather patterns. 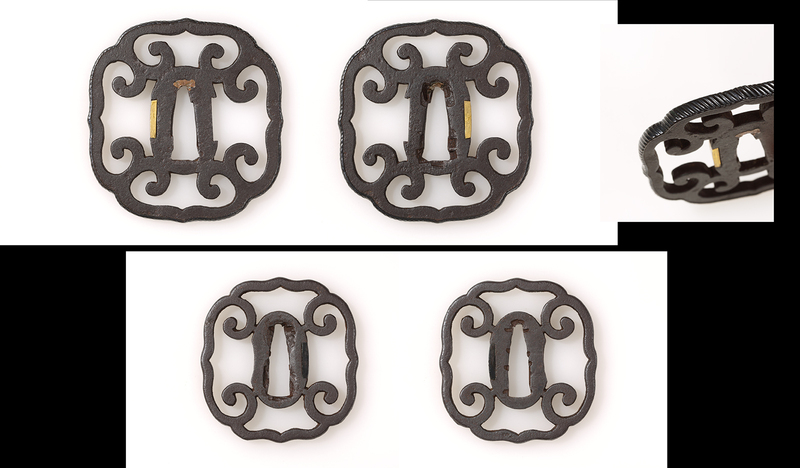 Mat, thick and specific painting was done around obi-tori portion, which may looks like black iron plate. Sturdy finish nishiki-zutsumi-zaya. Fur of deer made shiri-zaya with beautiful dots attached. Tachi with nishiki-zutsumi was also called gyo-butsu-zukuri since Muromachi Shogunate used it. 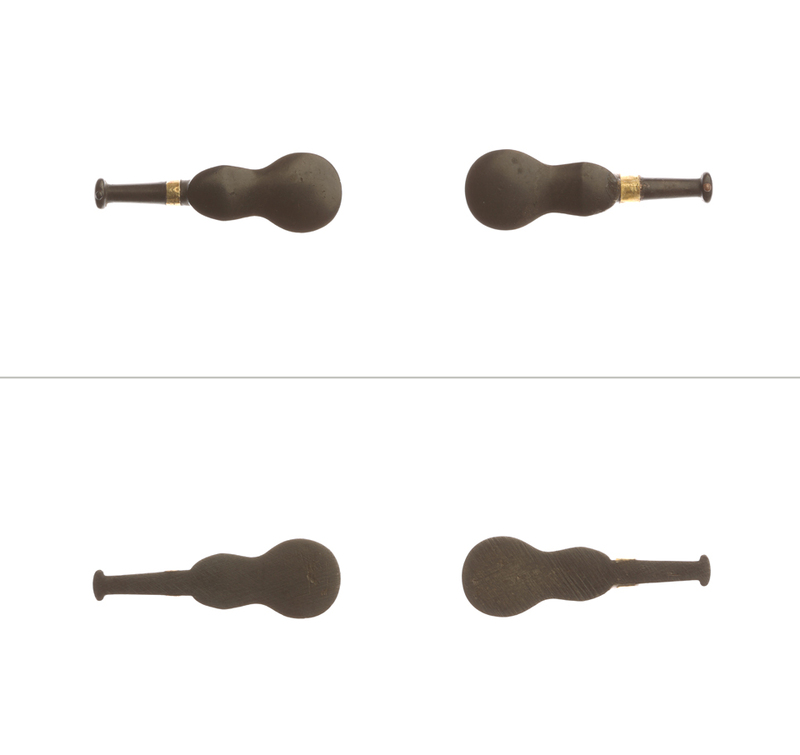 This nice feeling tachi-goshirae is ebony made holly-hook leave shape tachi holder attached in order to enjoy room decorating. Condition :　There is a little detached part of nishiki-zutsumi but it is not remarkable. 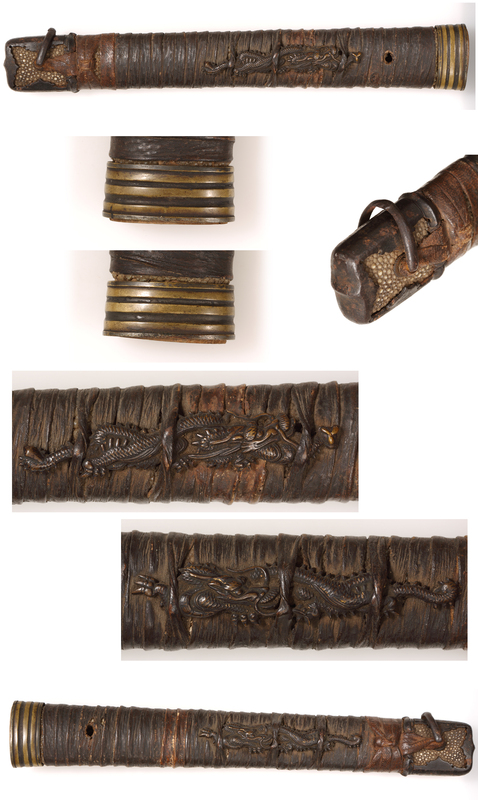 Tsuka and obi-tori was restored in recent years. 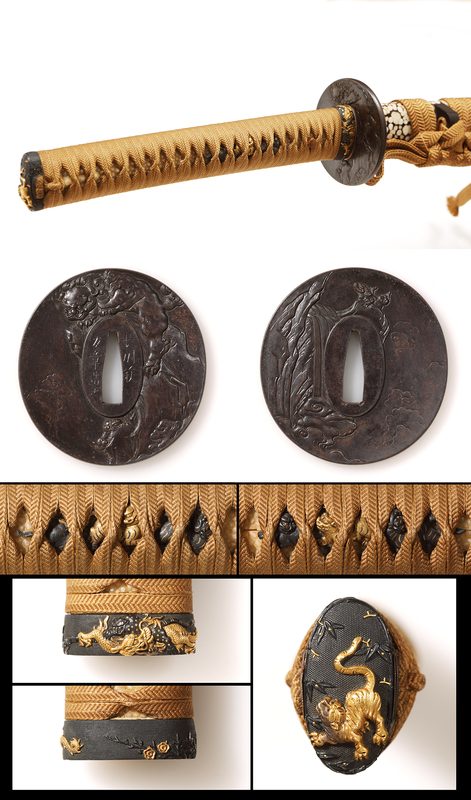 Description Kiku zôgan tetsu-ji kanagu kawari-nuri-zaya wakizashi koshirae "菊象嵌鉄地金具変り塗鞘脇差拵"
Price　JPY 80,000- -> JPY 60,000- (the fees of shipping and insurance not included in the price)PRICE DOWN! No real blades inside. Instead, wooden sword, called "tsunagi" is stored. 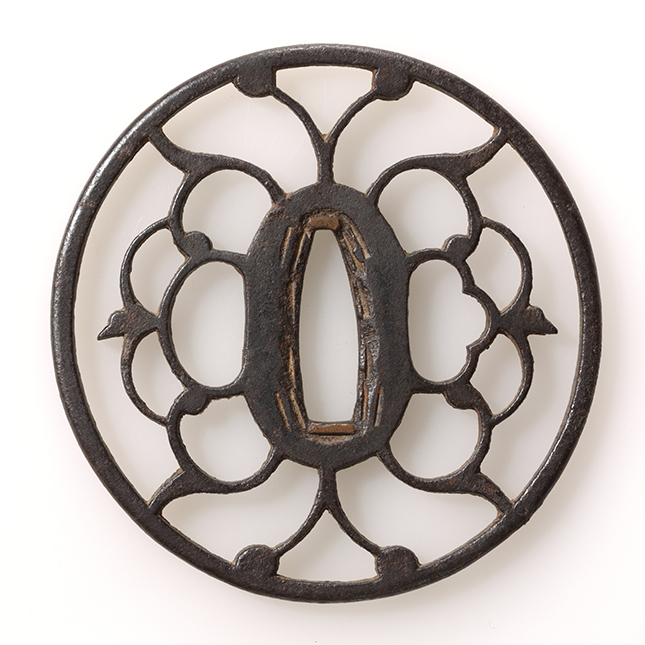 Tsuba : Chrysanthemum, kikka-gata, "菊花形"
Feature :It is a wakizashikoshirae with ensembles of chrysanthemum motif metal fittings. It twinkles aogai-chirashi kawari-nuri-zaya. Condition There is a tiny dent and scratches on saya, rest remains excellent conditions. Features: Spark inlays of gold is dazzling. 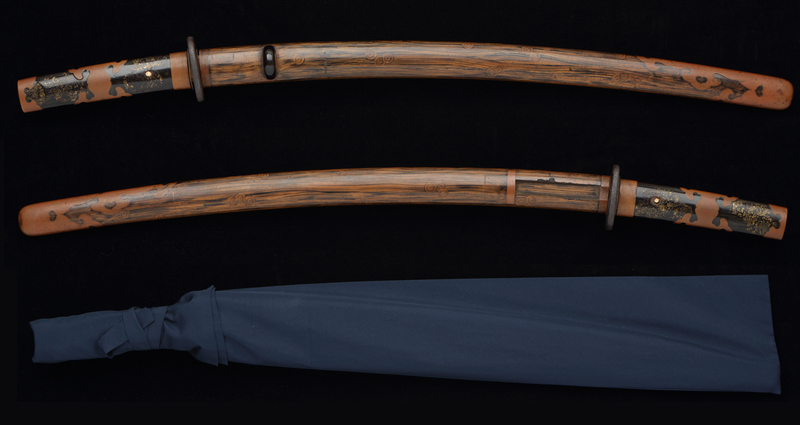 This Wakizashi Koshirae with magnificent support. 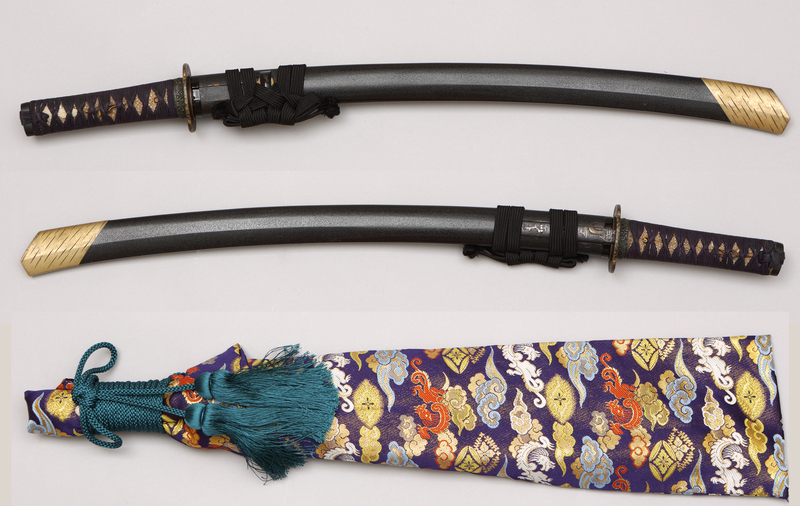 It was reportedly contains a short sword of Hizen Tadayoshi previously. A tsunagi and o-katana bag attached. No koka. No real blades inside. 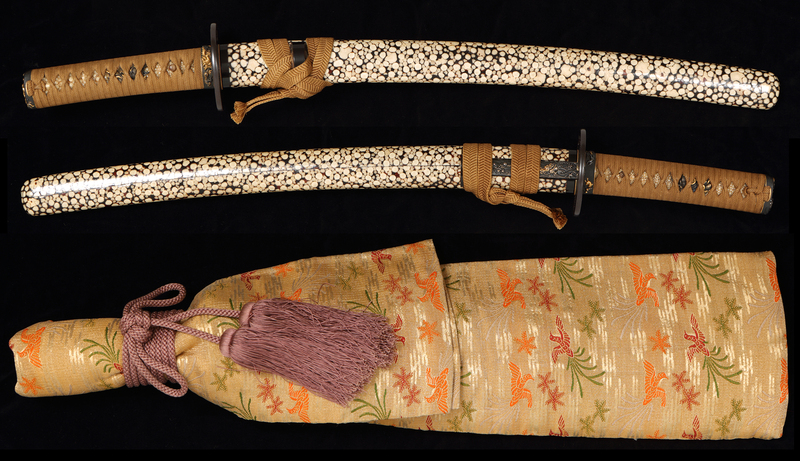 Instead, wooden swords, called "tsunagi" are stored. 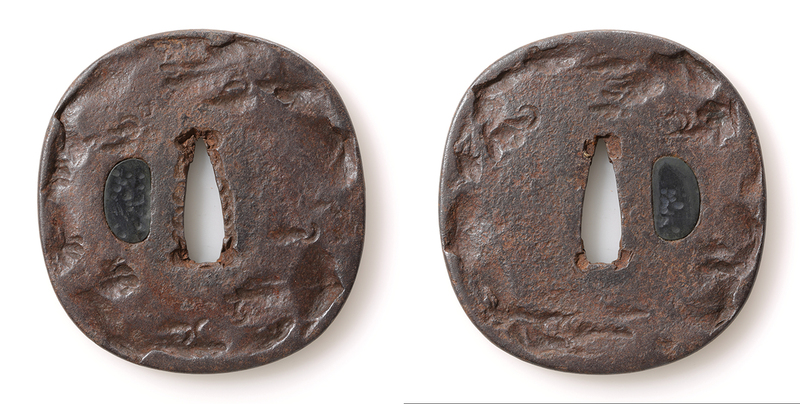 Feature Kawari-nuri-zaya dai-sho koshiraes, which have magnific black dots on shu-nuri . so that it moves a little. Other conditions are very fine. A tsunagi and a bags of koshirae are attached. No real blade inside. 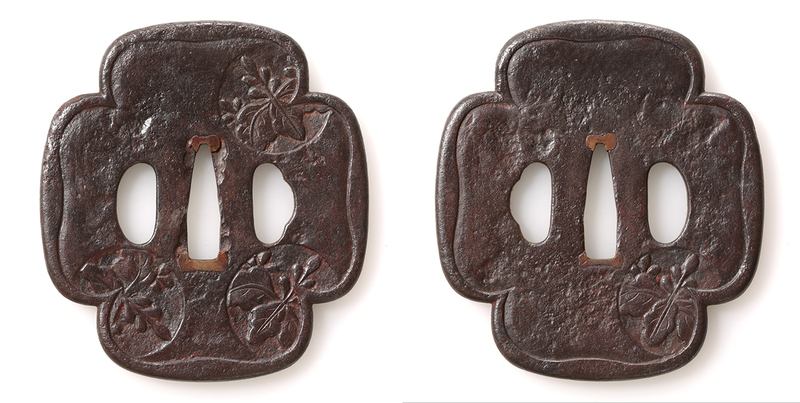 Wooden blade shaped material, called "tsunagi", inside. 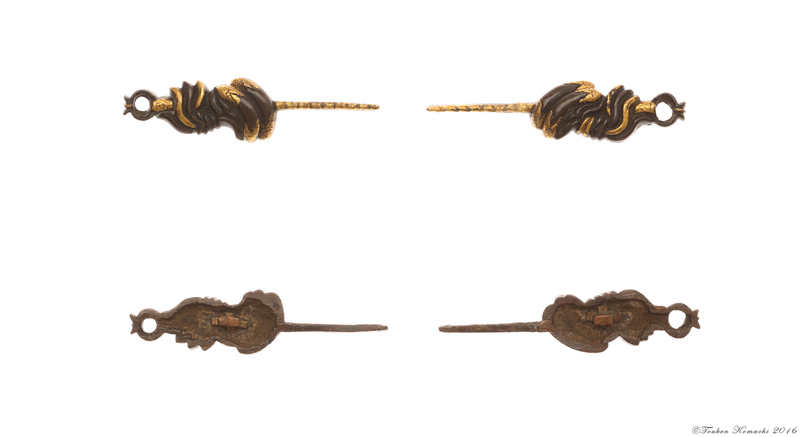 Feature　Saya with swirl patterns on hake-mes(lines of brush), tsuka with kin-mushikui-nuri(worm-eaten paint in gold color). Coordinated in brown tone. 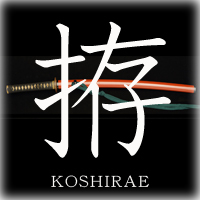 It is elegant koshirae. Conditions　A little sures(scratches) and small flaw are observed. However, the condtions is fine in general. One shitodome of kurigata is lacked. 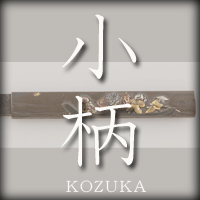 No kozuka. Tsunagi and bag of koshirae attached. only tiny scratch. It has fine conditions. There is a tiny dent. You can use it for koshirae making.